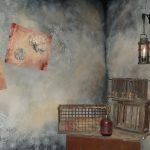 The pictures on this review are not to be re-produced. 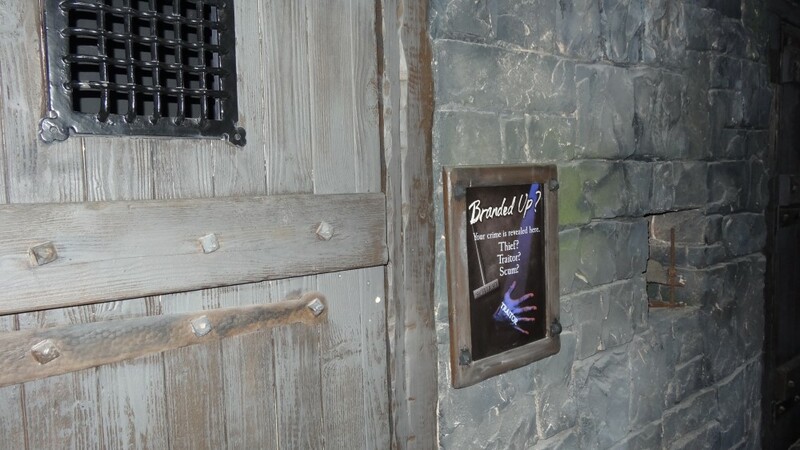 See our info for more information. 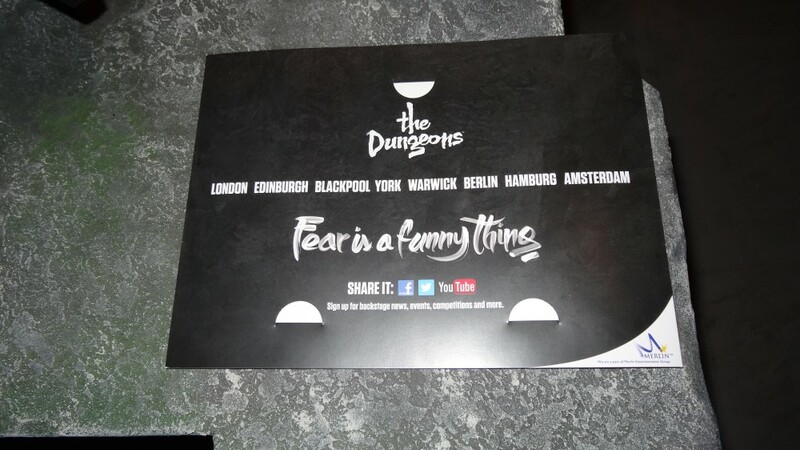 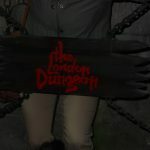 Fear is a funny thing is the first thing you will notice about the new Dungeons, along with the new logo. 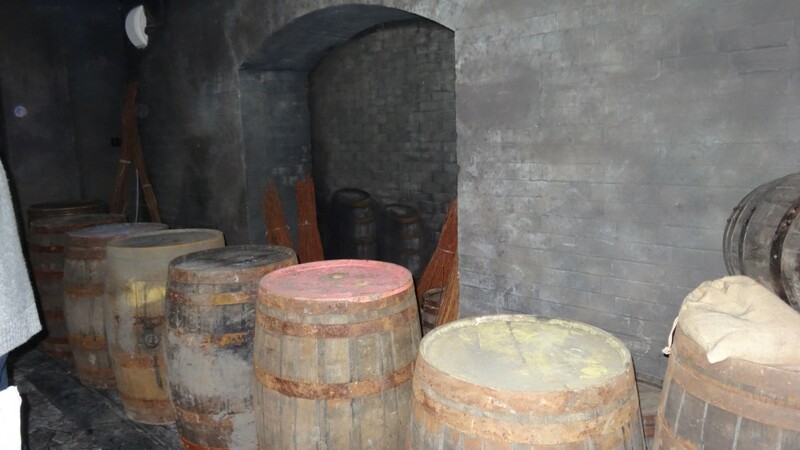 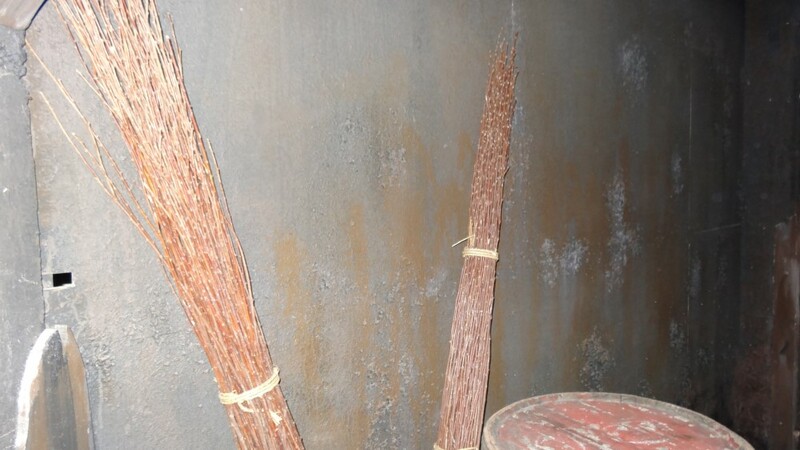 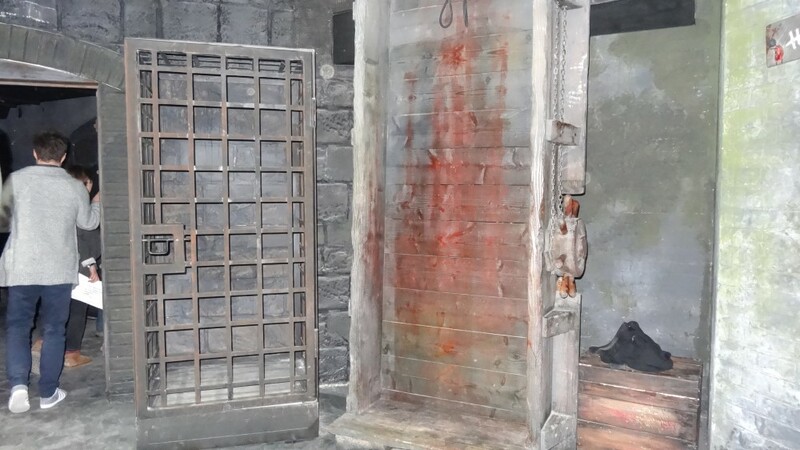 Less of the bright red and more of a maroon colour the dungeons are aiming at appealing to the families. 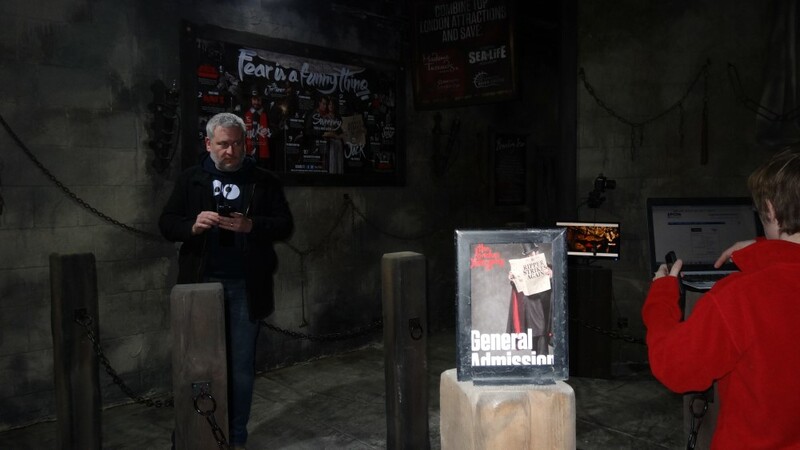 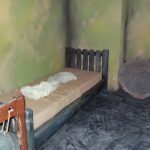 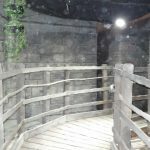 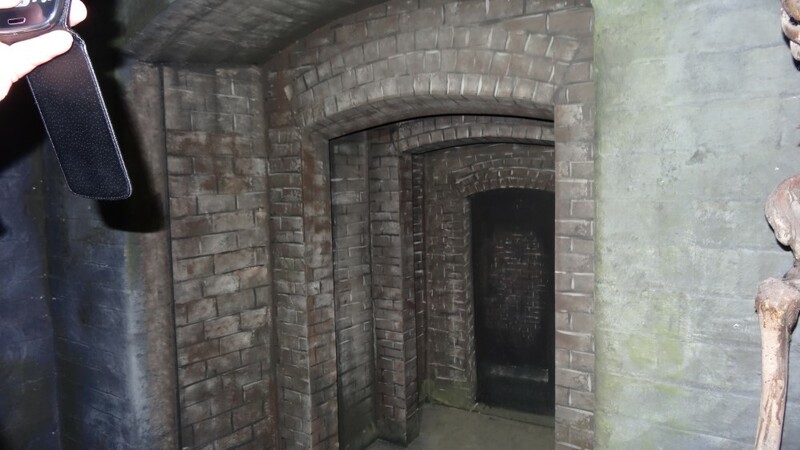 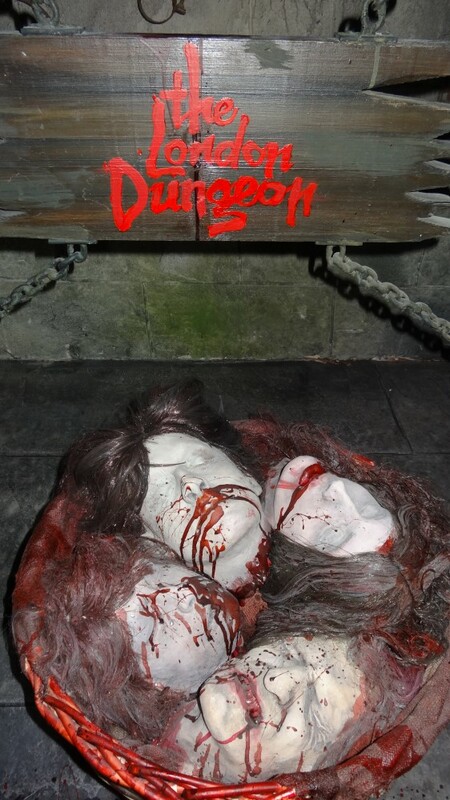 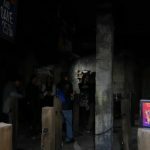 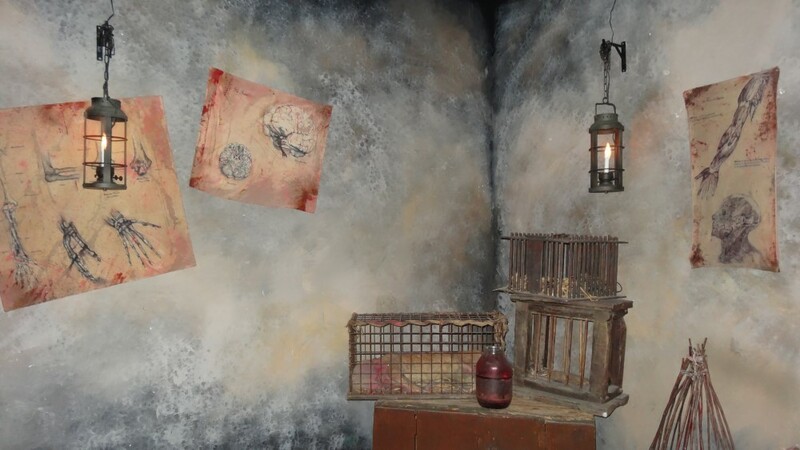 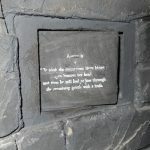 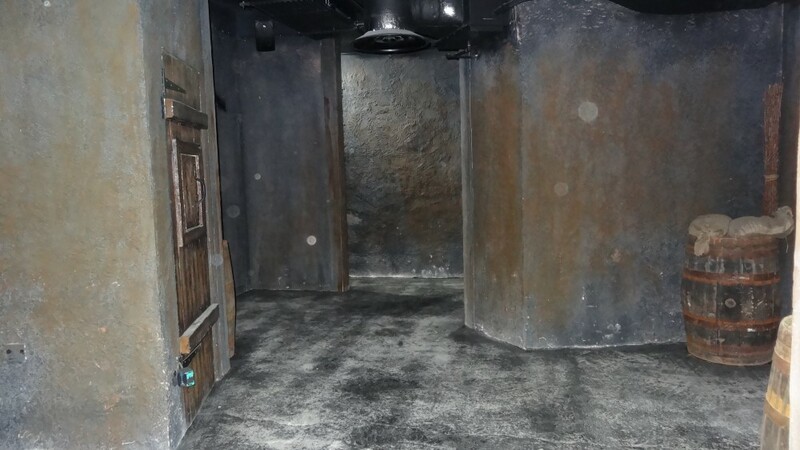 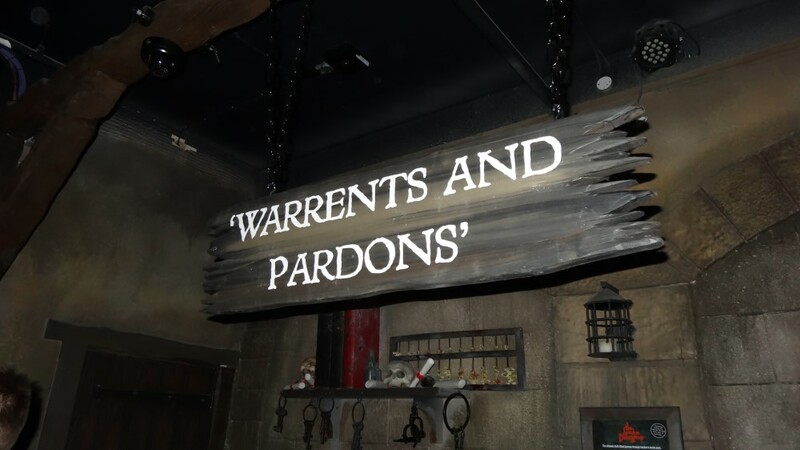 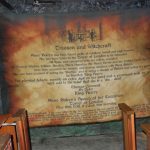 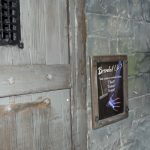 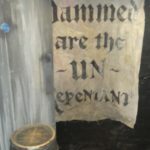 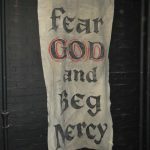 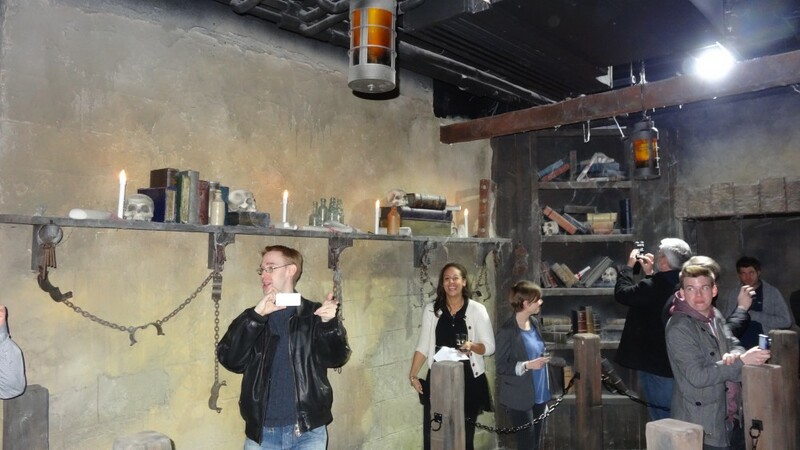 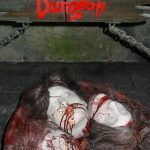 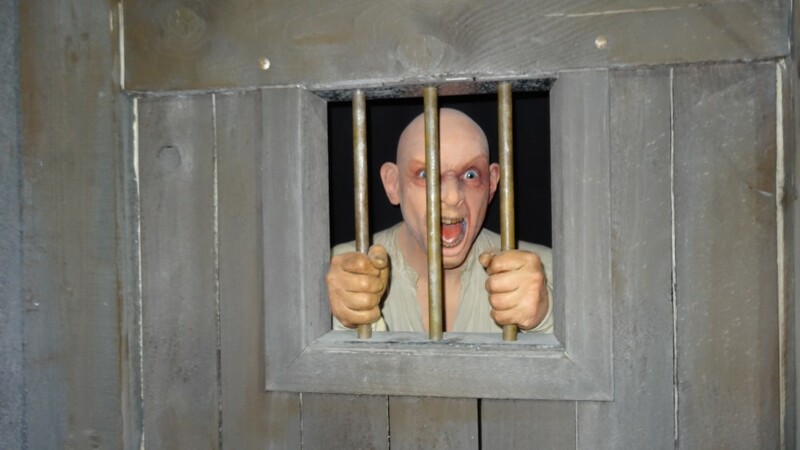 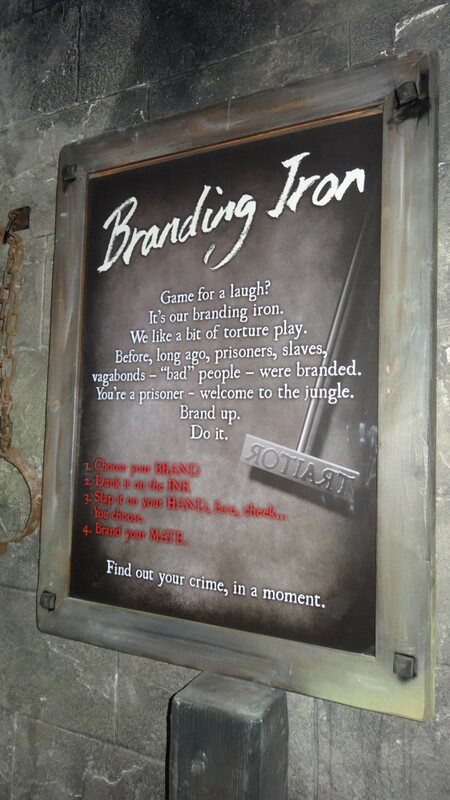 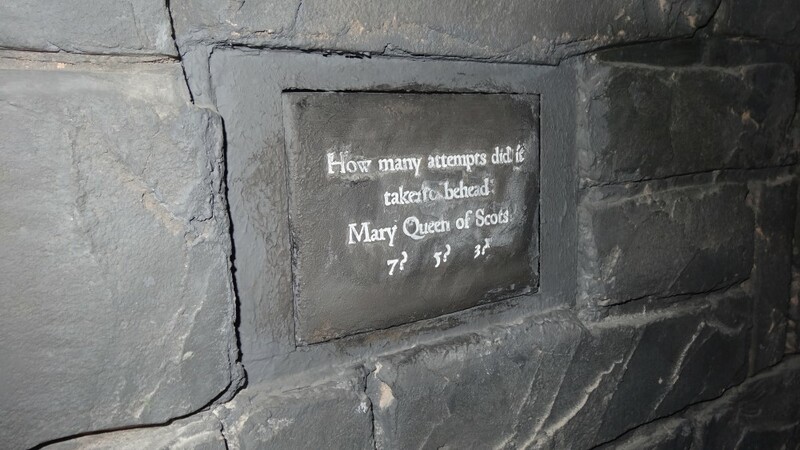 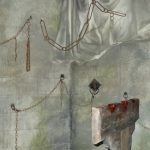 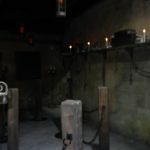 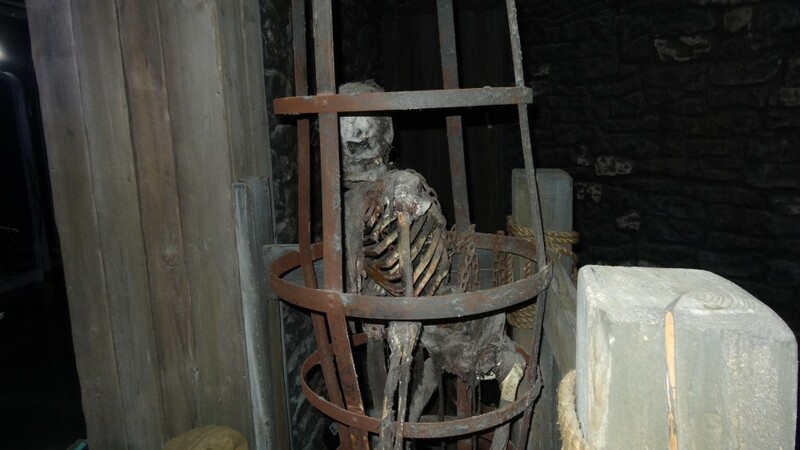 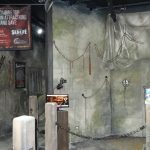 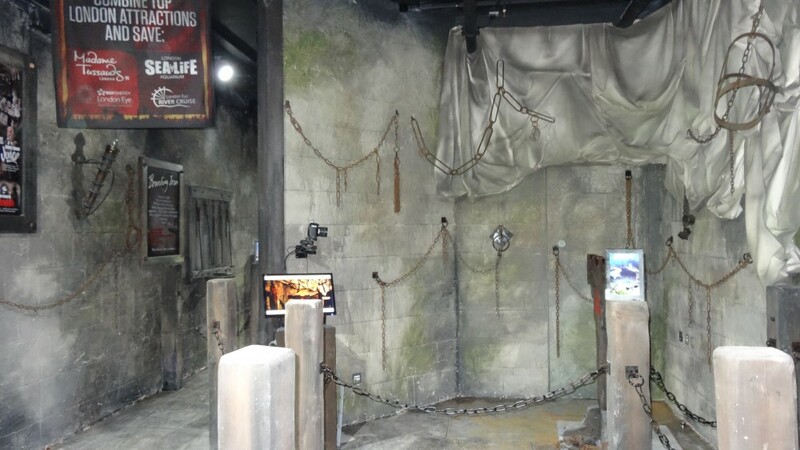 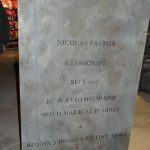 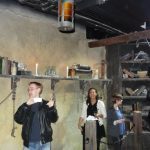 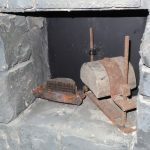 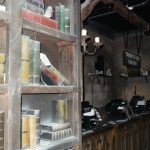 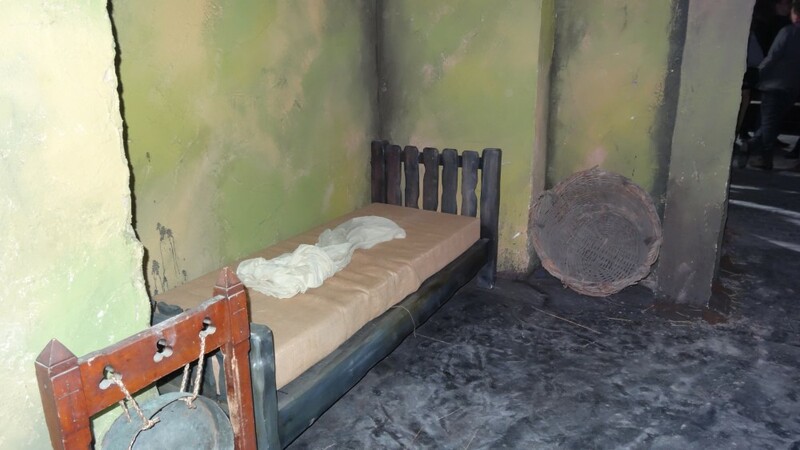 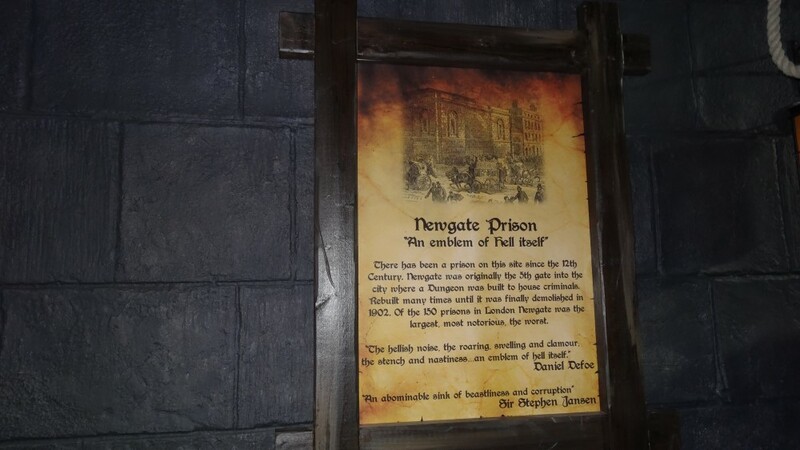 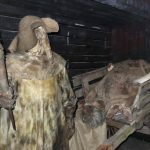 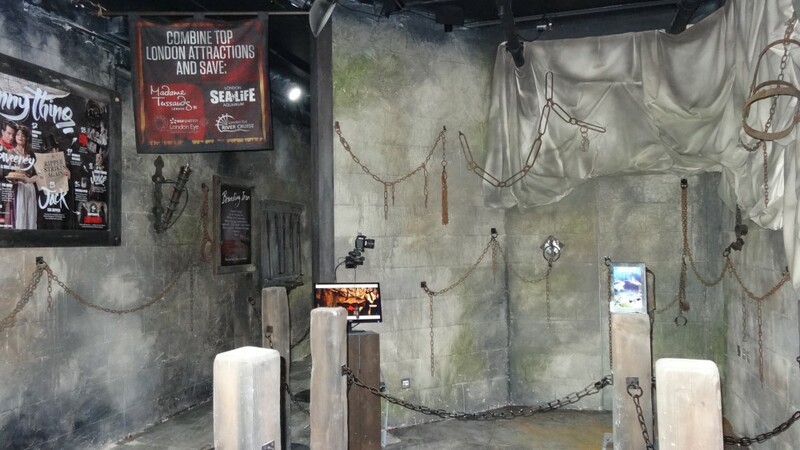 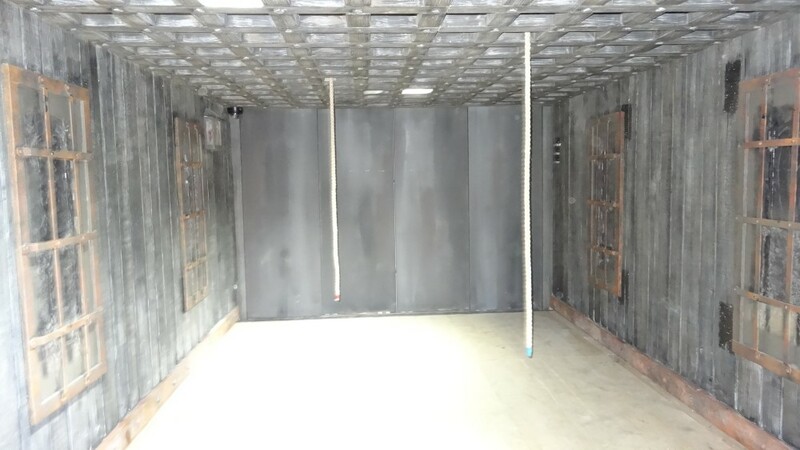 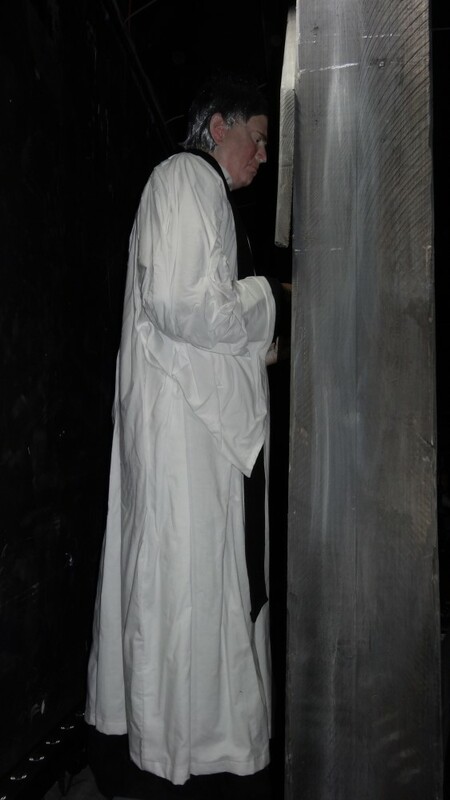 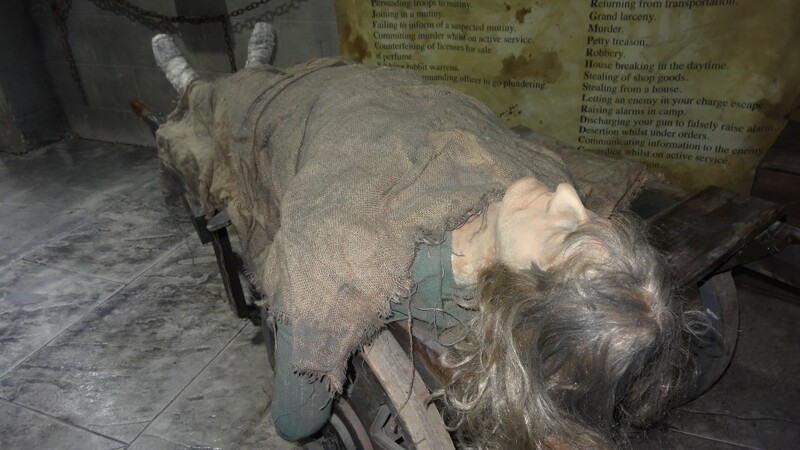 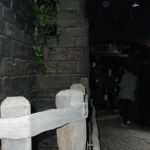 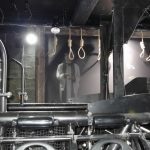 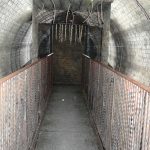 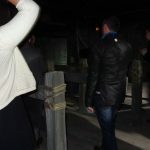 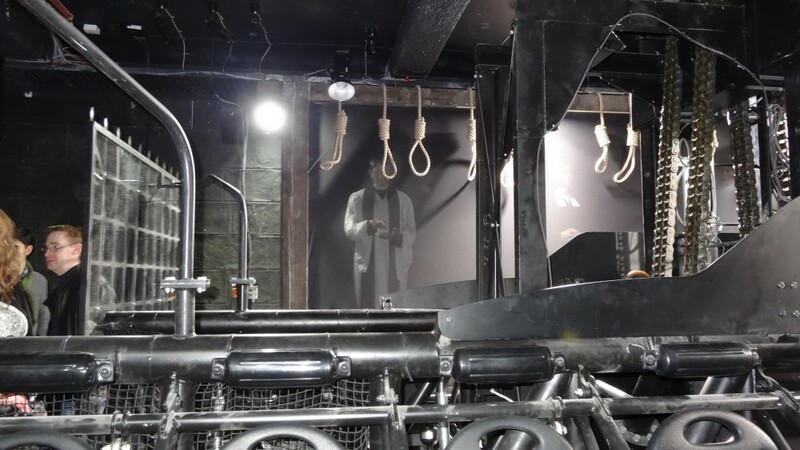 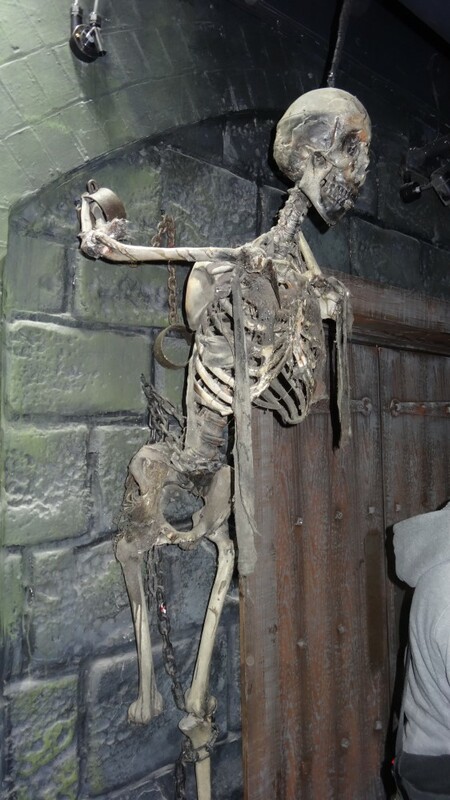 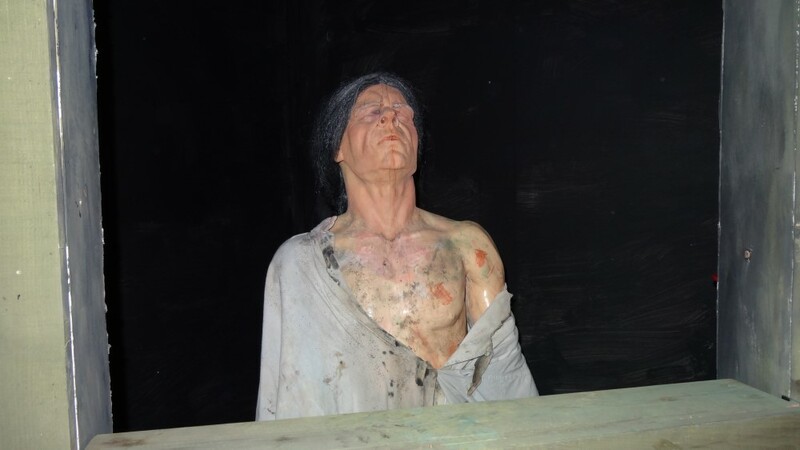 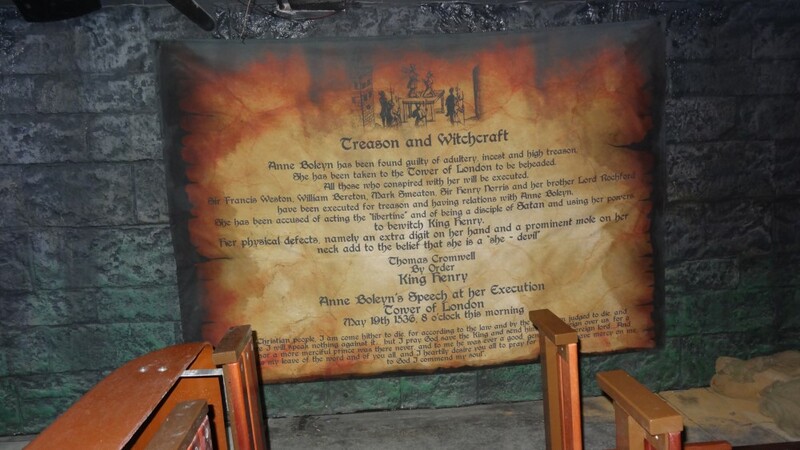 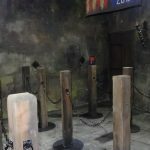 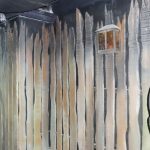 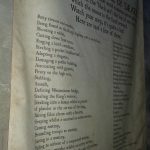 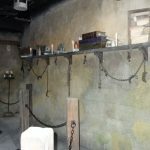 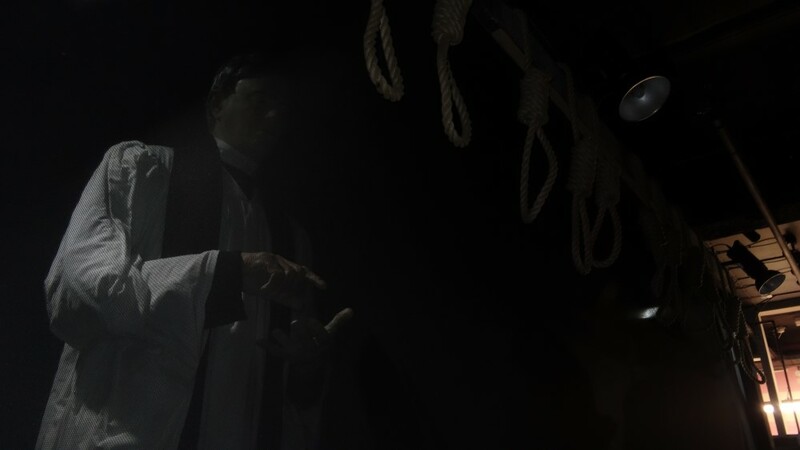 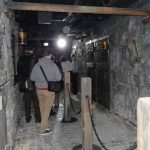 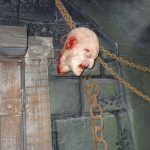 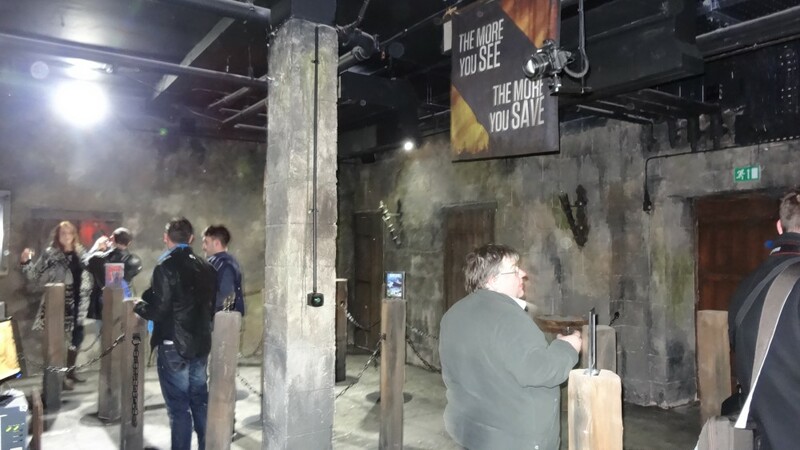 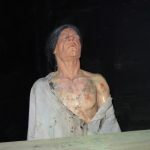 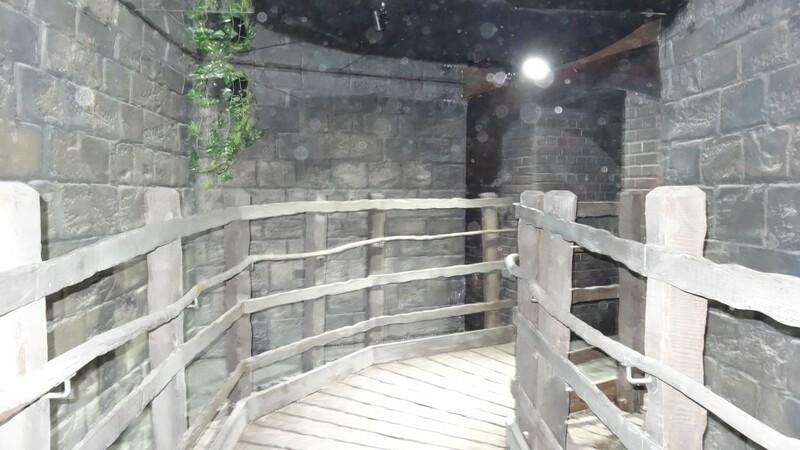 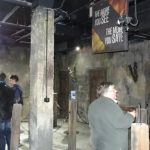 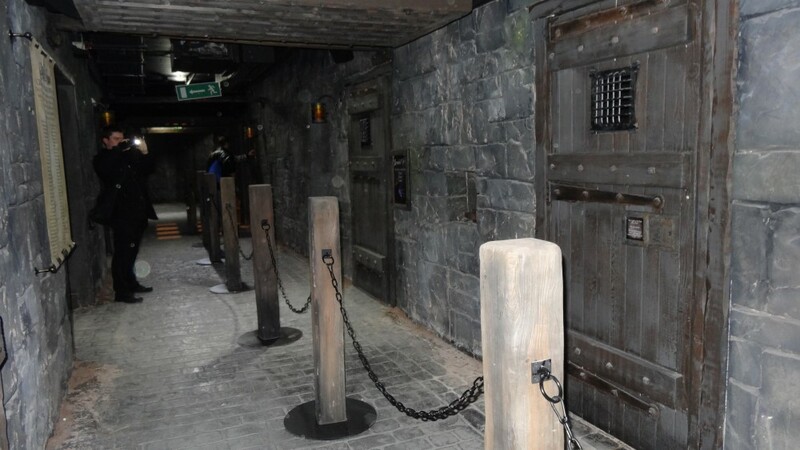 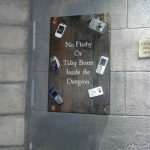 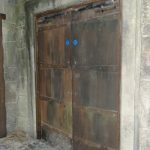 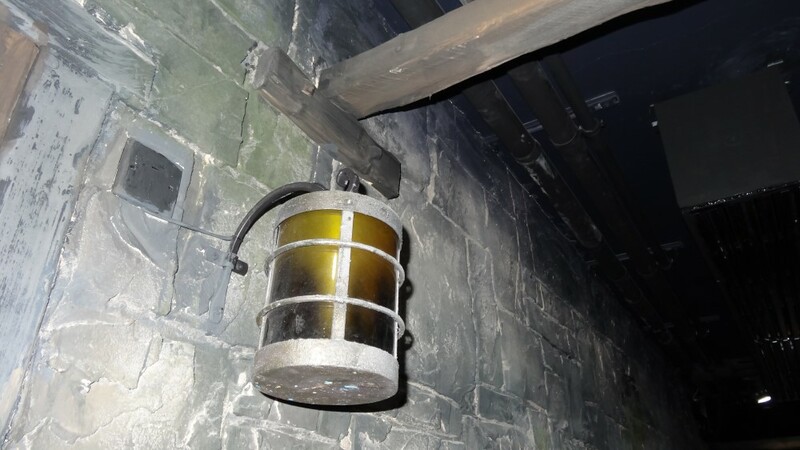 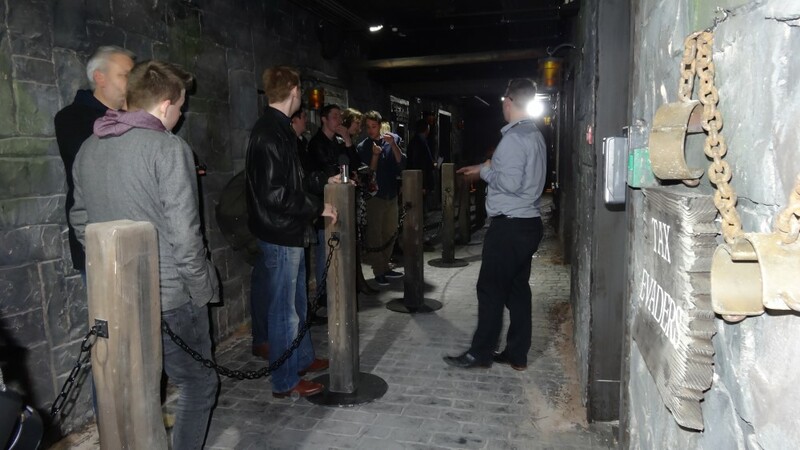 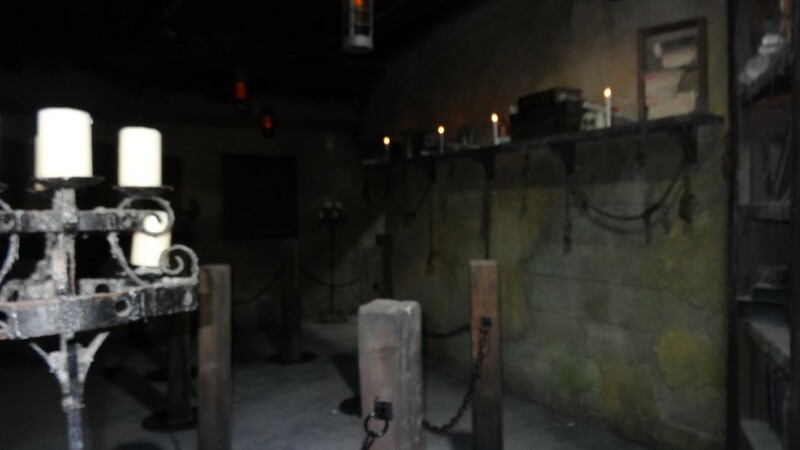 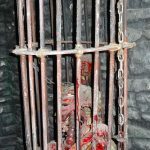 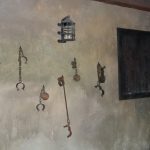 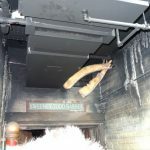 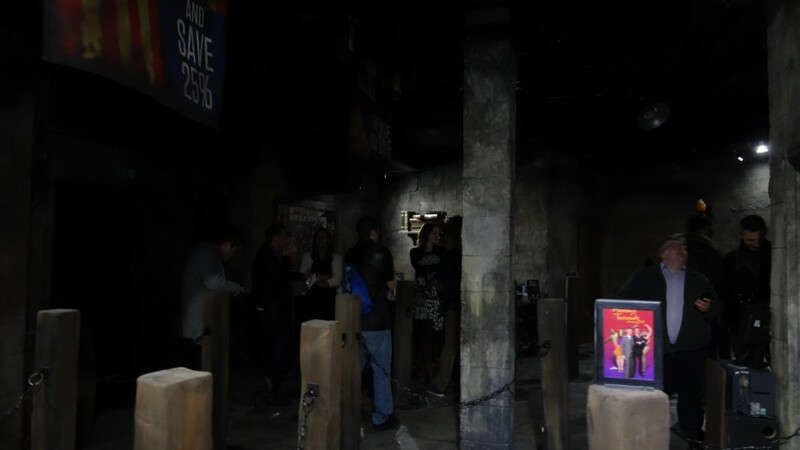 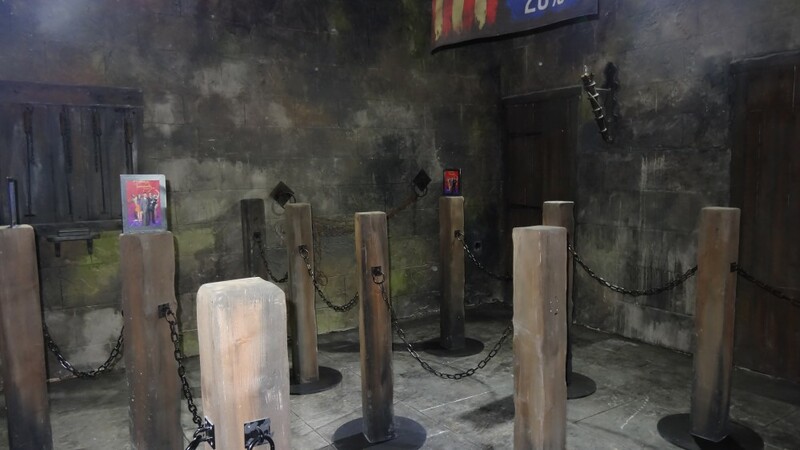 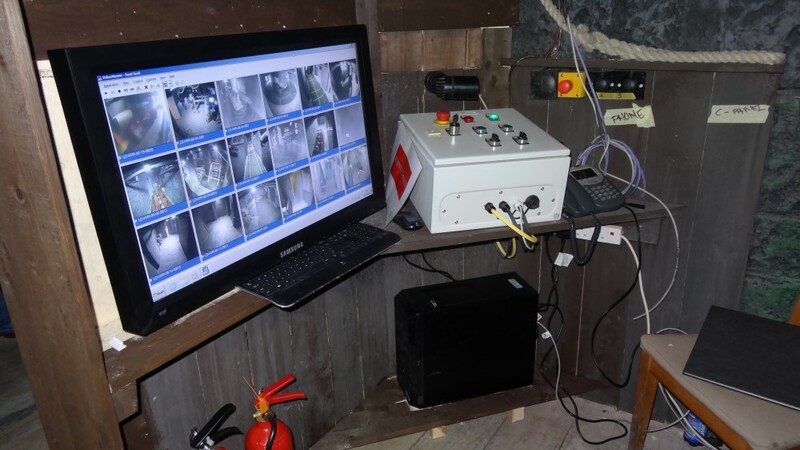 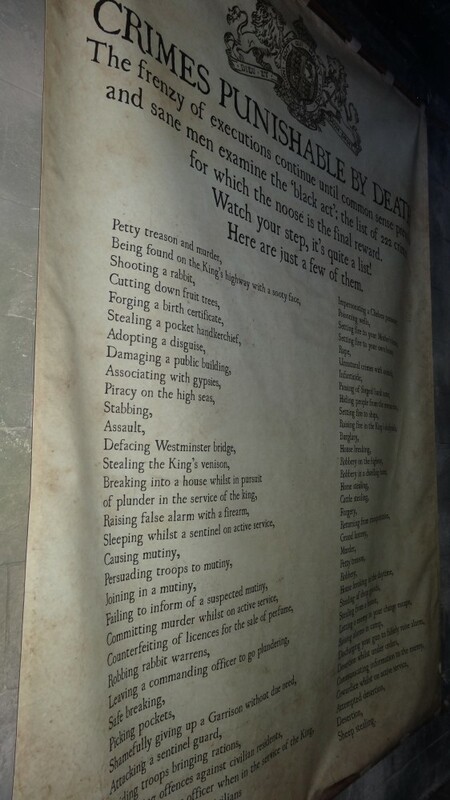 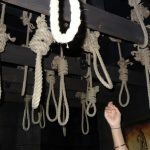 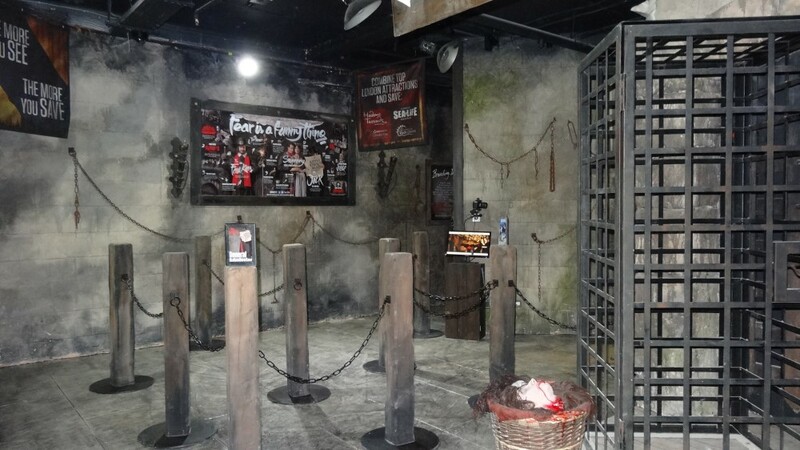 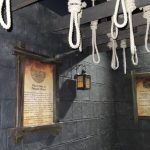 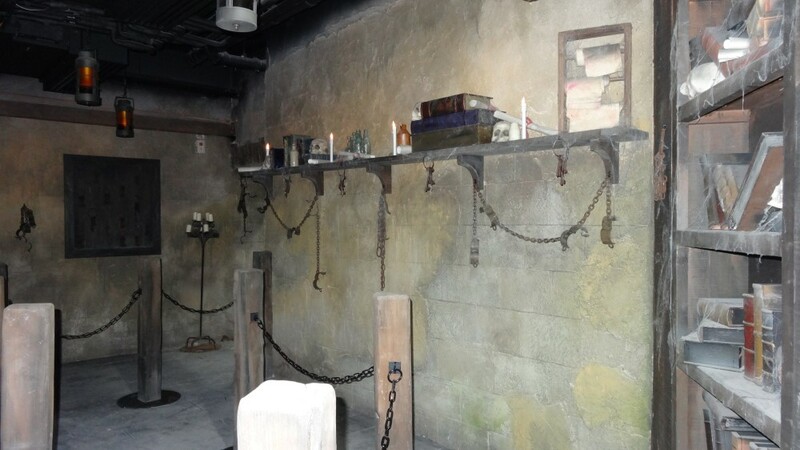 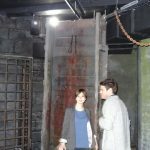 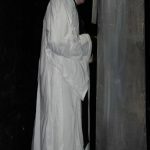 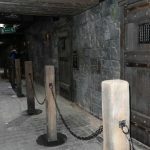 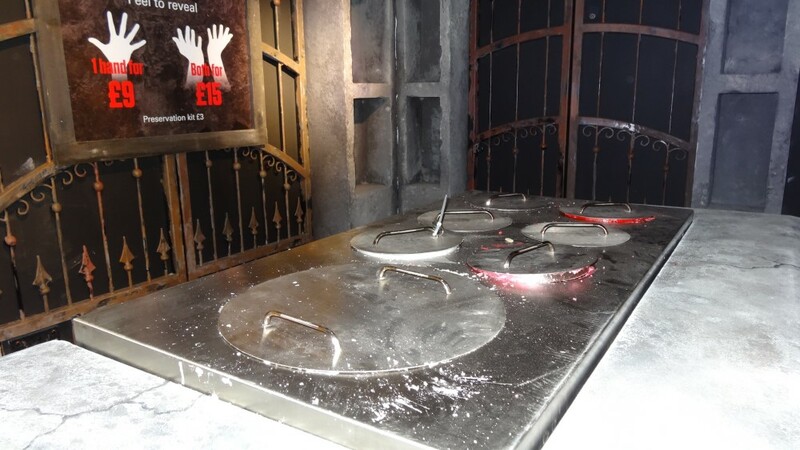 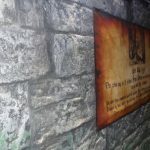 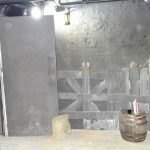 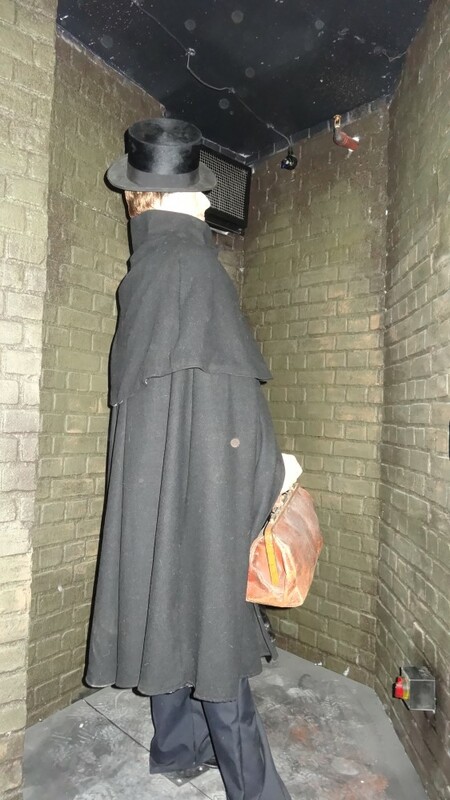 As we were told the element of fear is what you naturally think about when you think of the Dungeons, but less so the fact that you will have a fun time, likely to be laughing at points in the attraction. 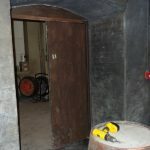 So out goes the old and in the new. 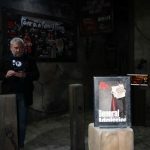 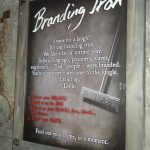 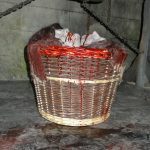 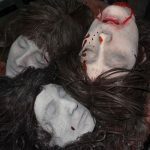 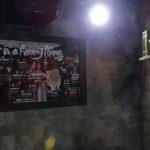 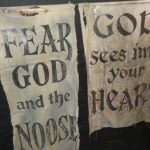 Fear is a funny thing is accompanied with the fact that marketing material and indeed merchandise will no longer have the “blood splat” effects to appear to tone it down slightly. 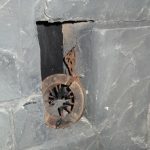 However essentially, nothing has changed inside. 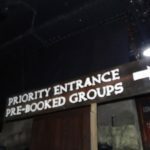 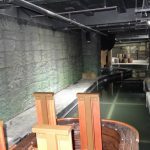 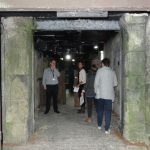 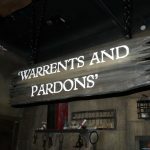 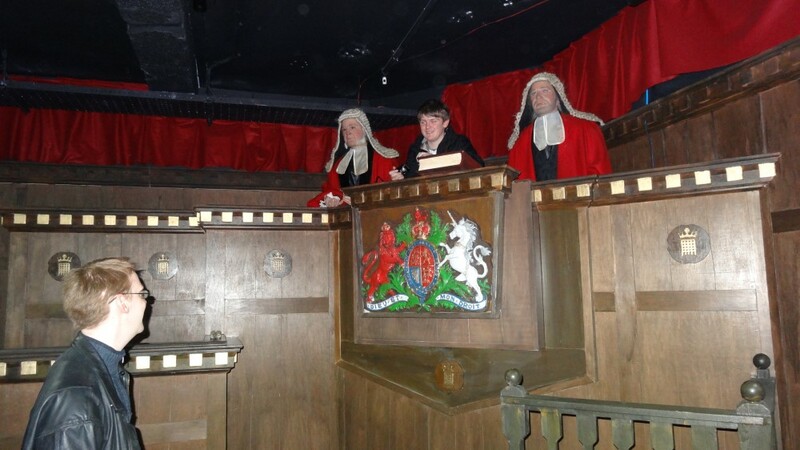 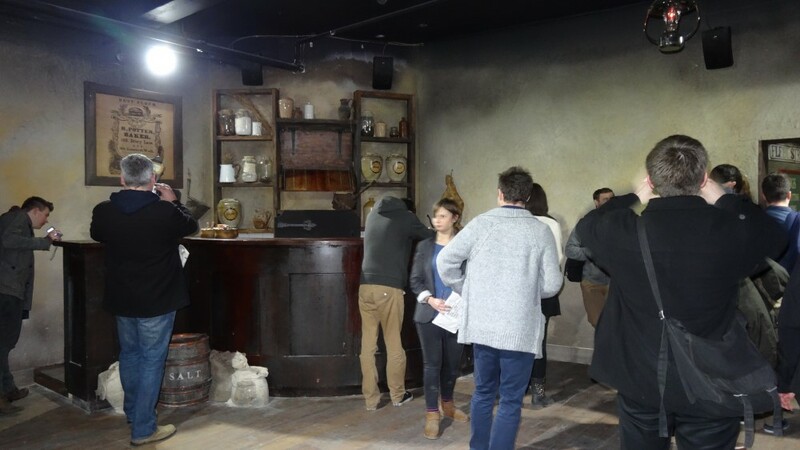 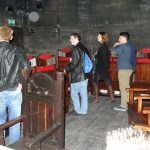 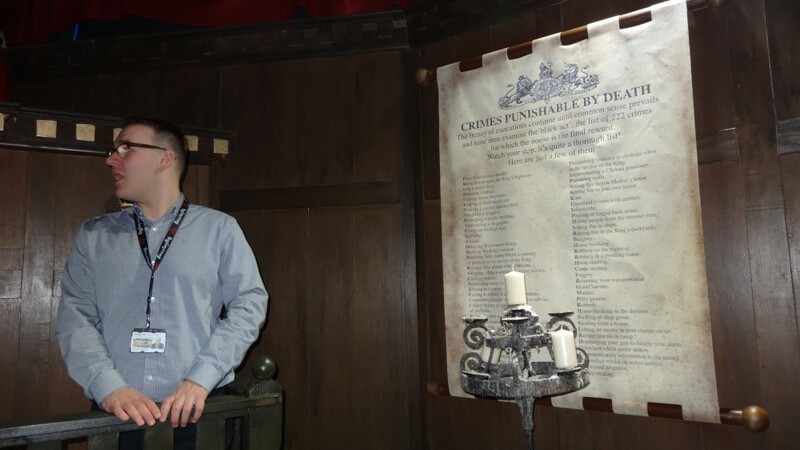 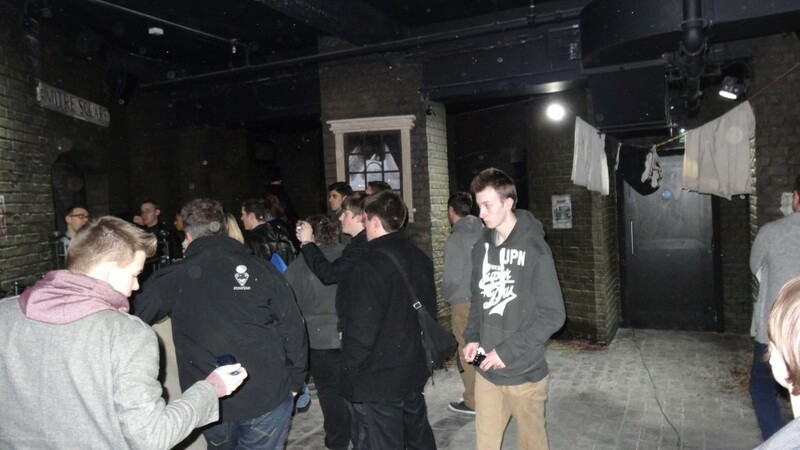 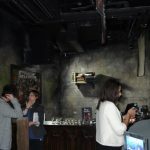 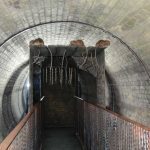 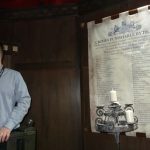 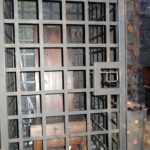 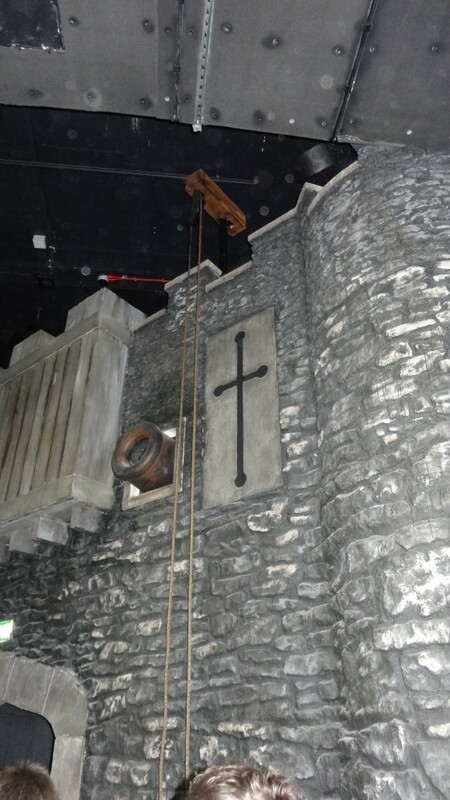 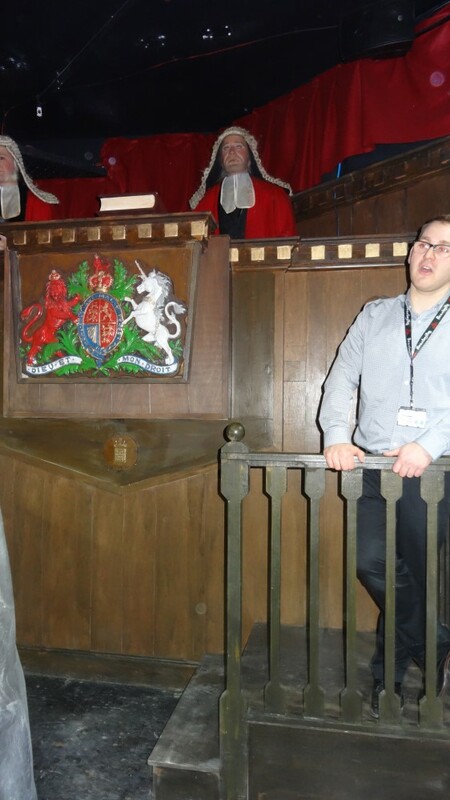 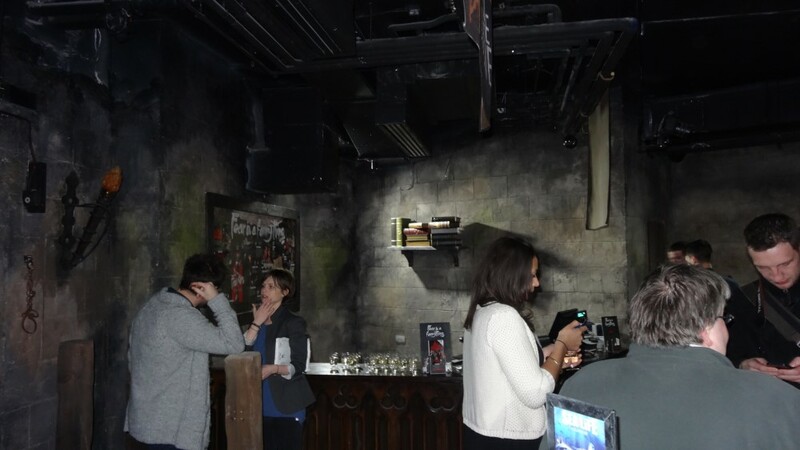 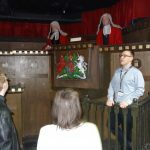 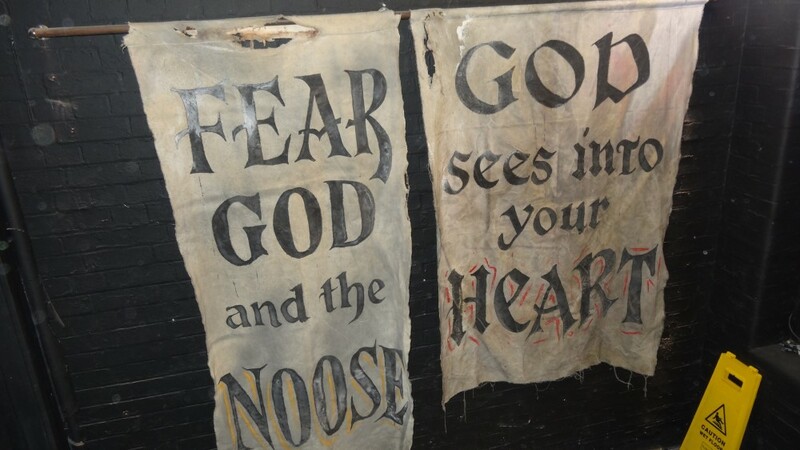 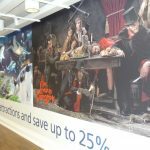 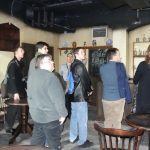 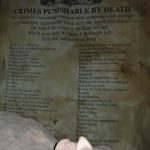 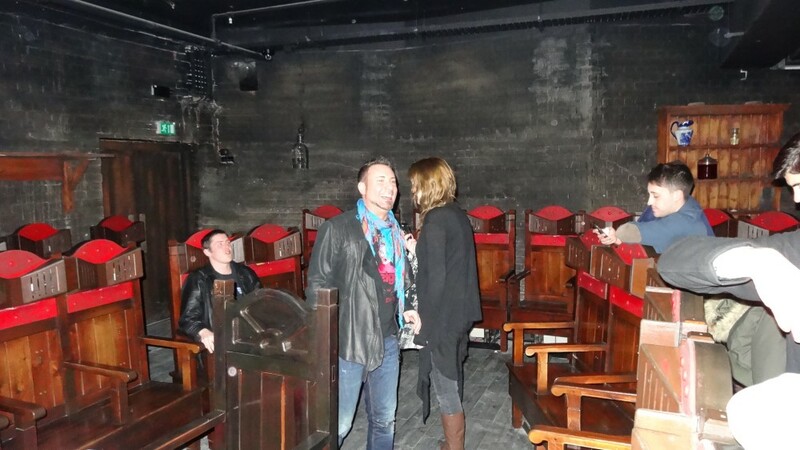 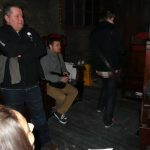 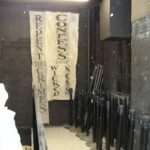 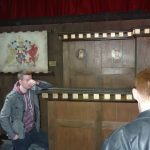 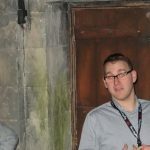 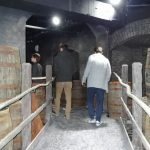 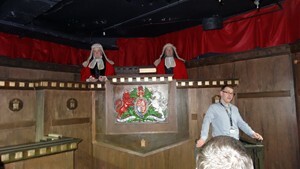 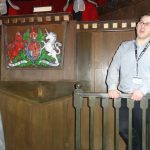 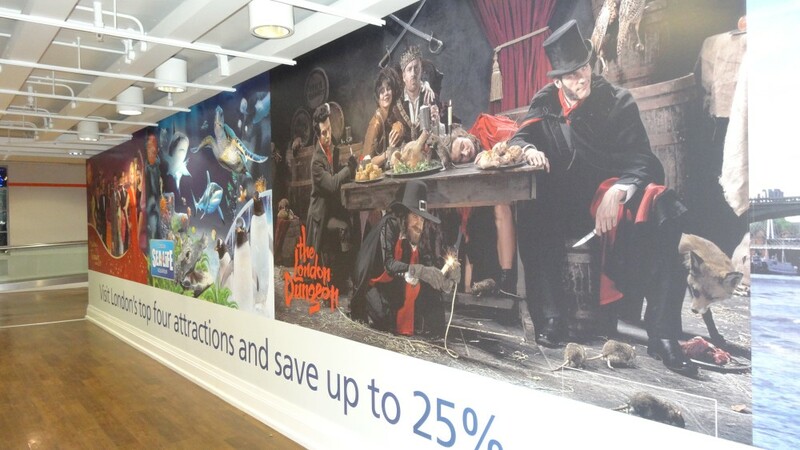 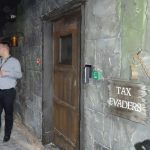 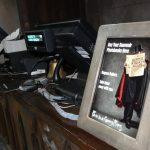 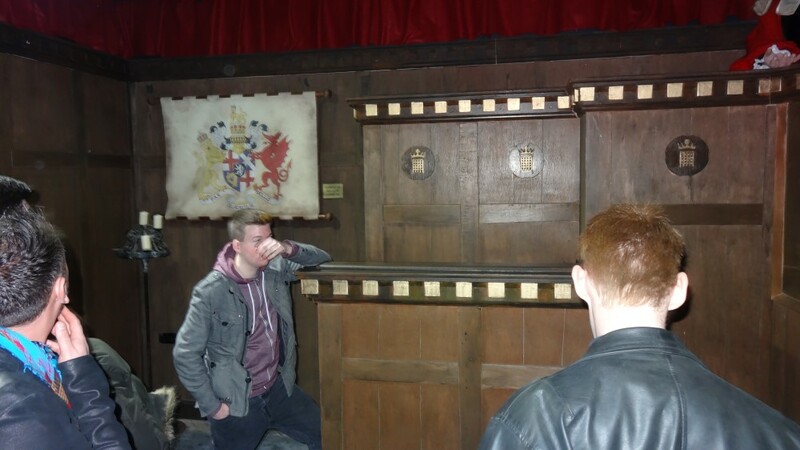 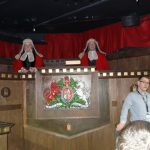 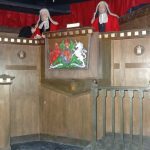 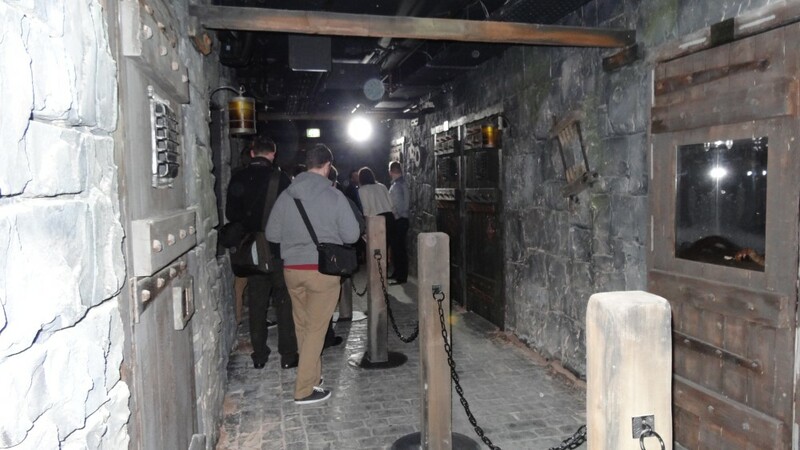 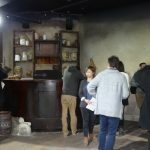 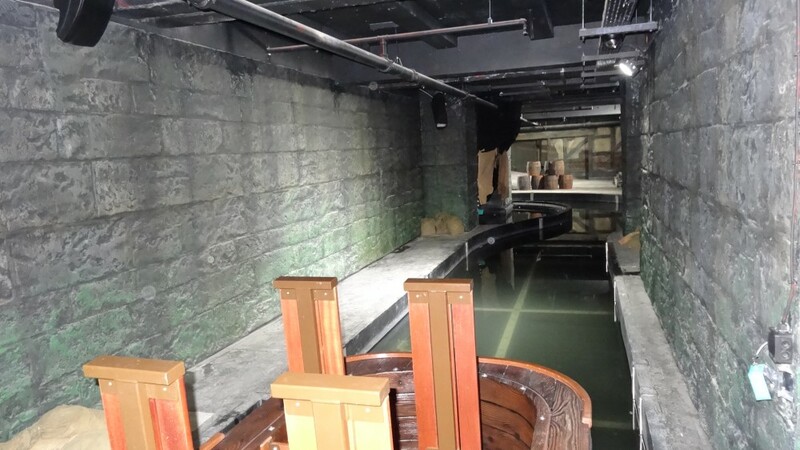 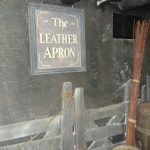 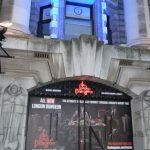 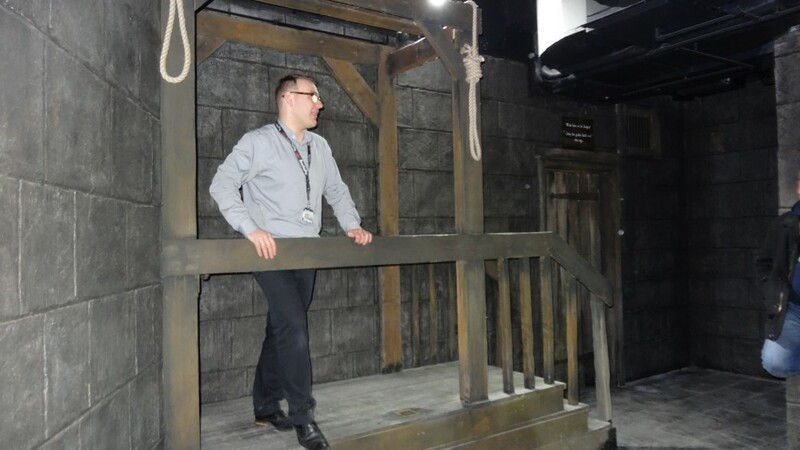 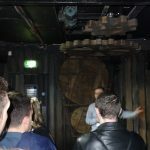 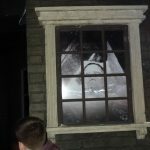 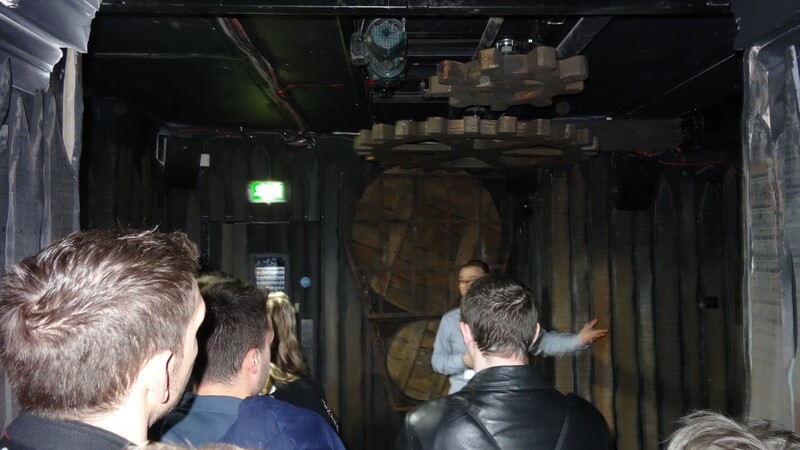 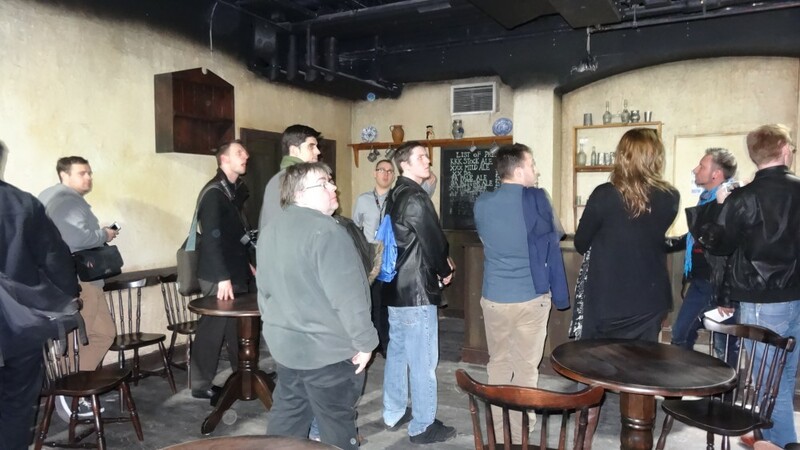 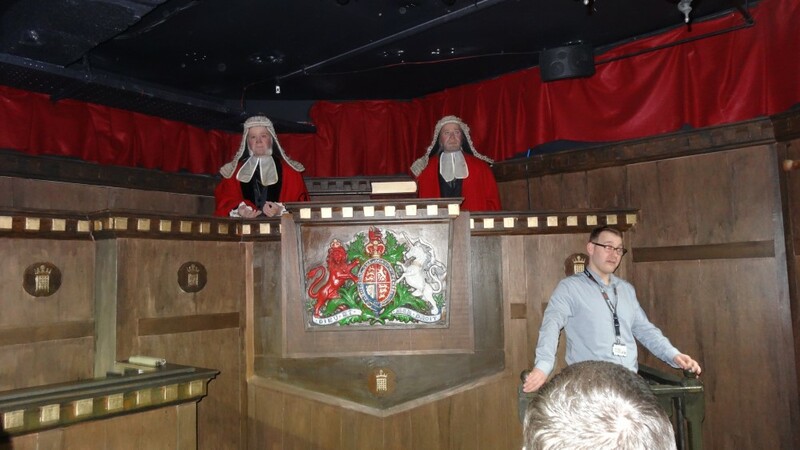 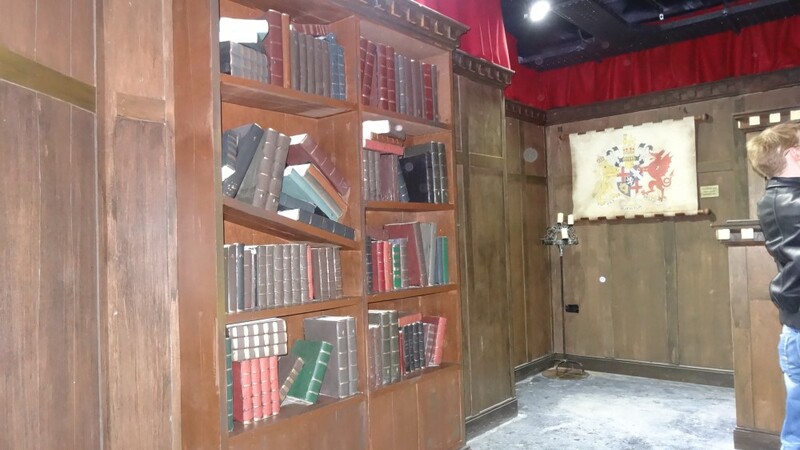 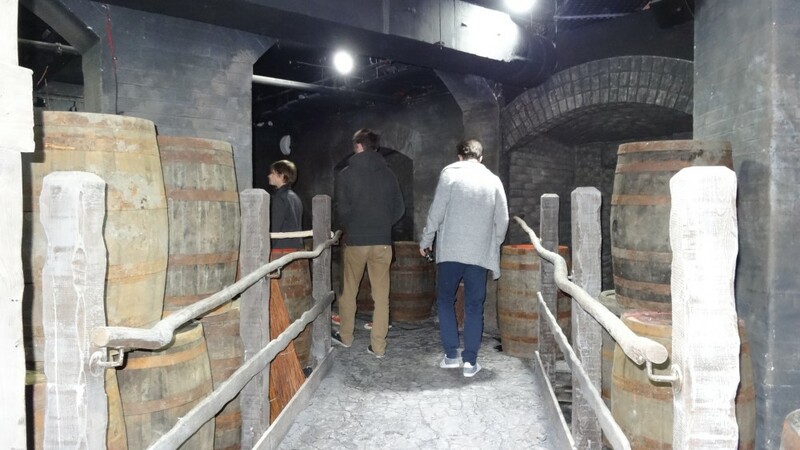 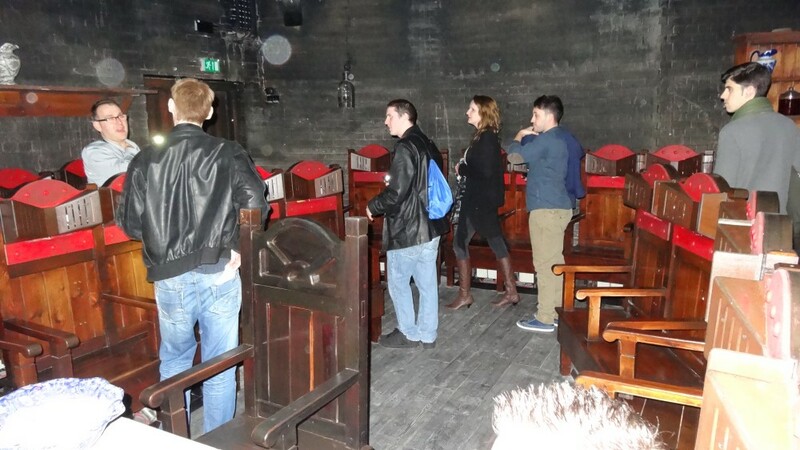 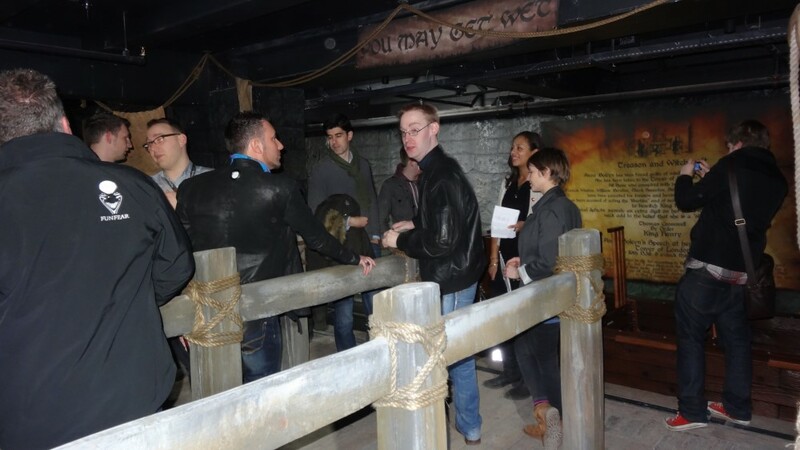 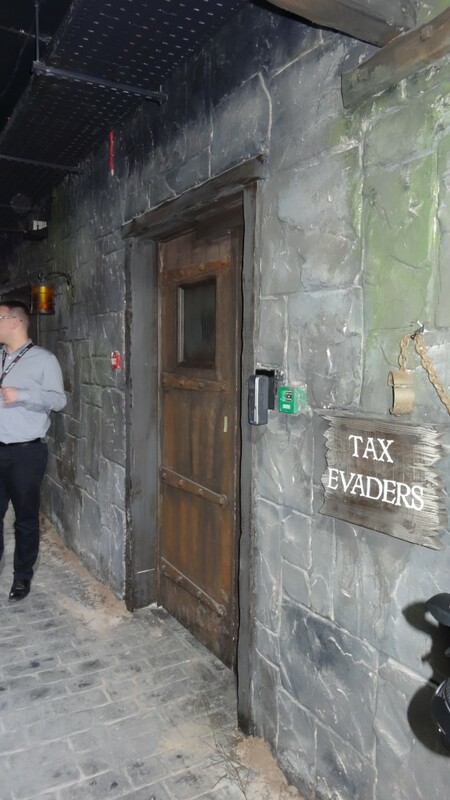 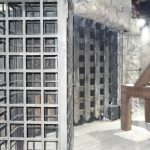 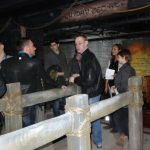 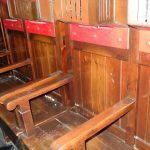 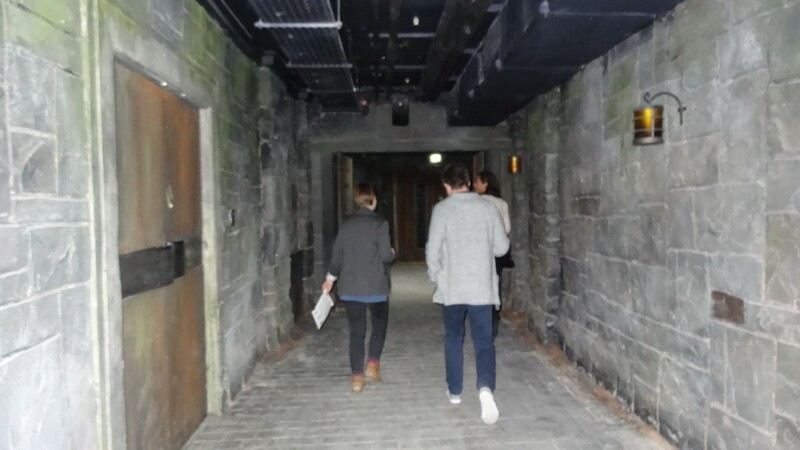 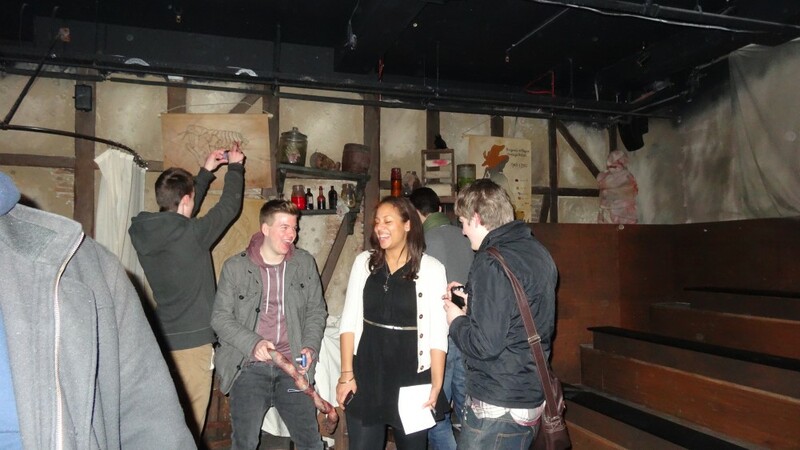 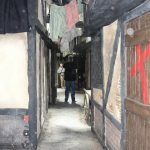 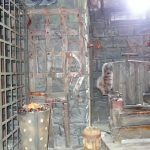 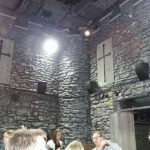 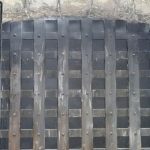 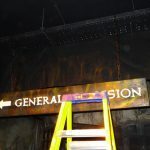 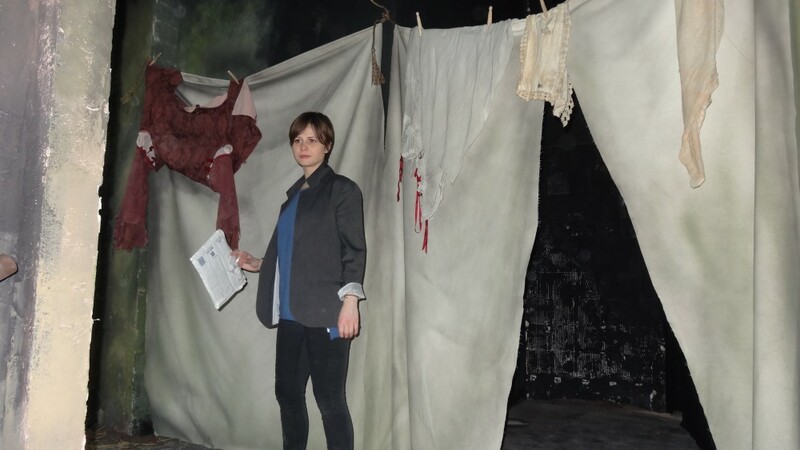 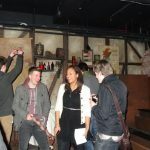 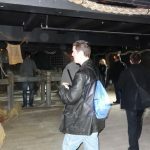 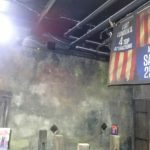 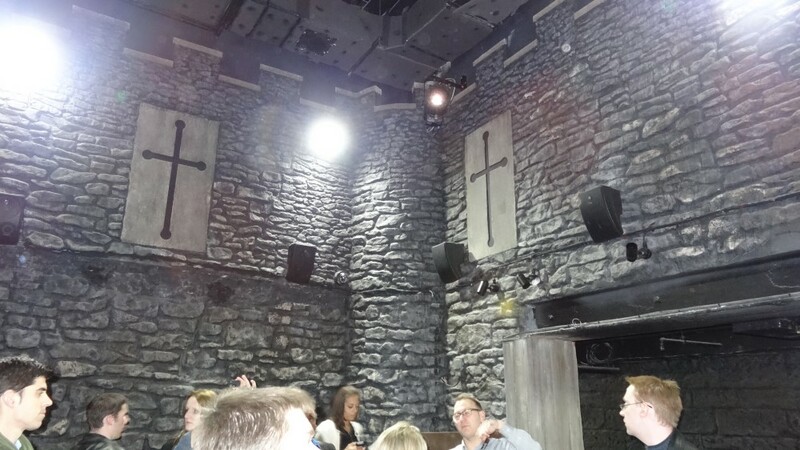 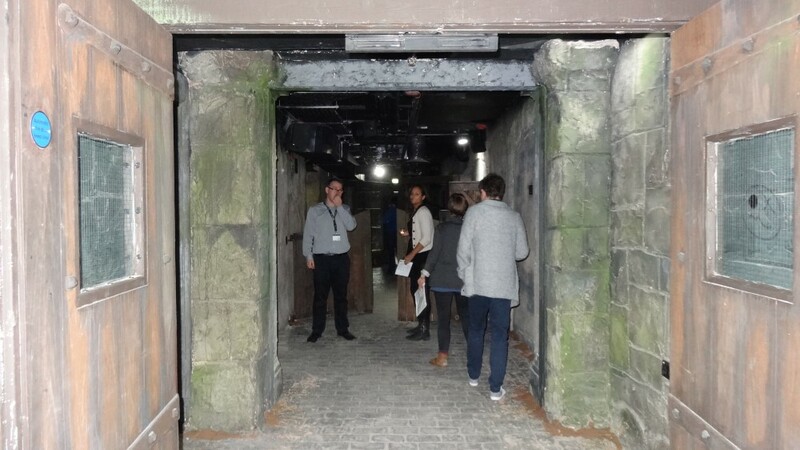 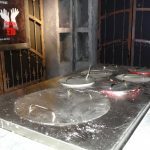 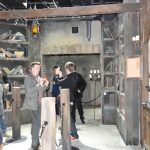 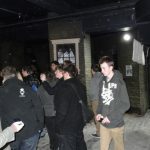 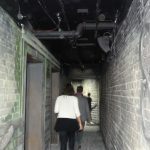 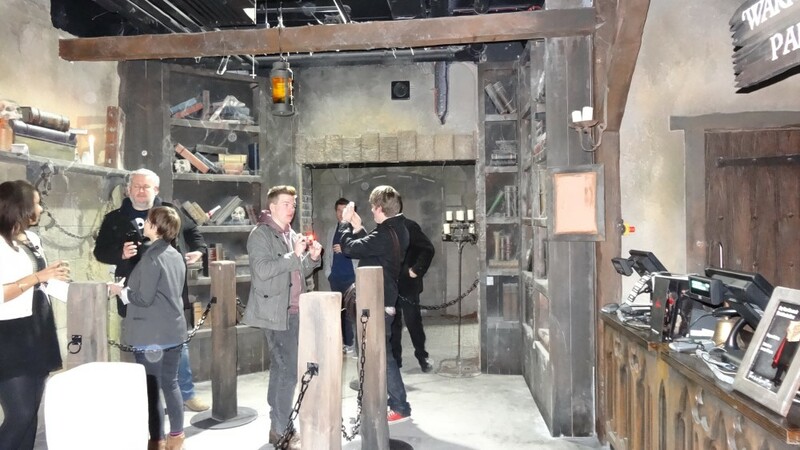 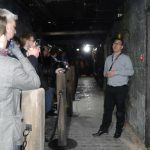 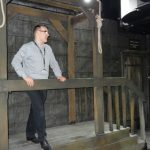 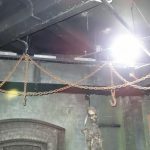 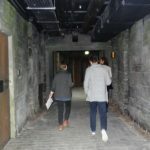 On the 25th of February we were lucky enough to be invited for a behind the scenes tour of the brand new London Dungeons at County Hall. 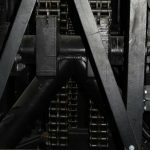 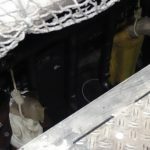 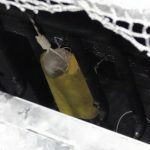 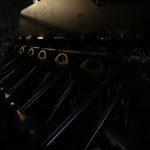 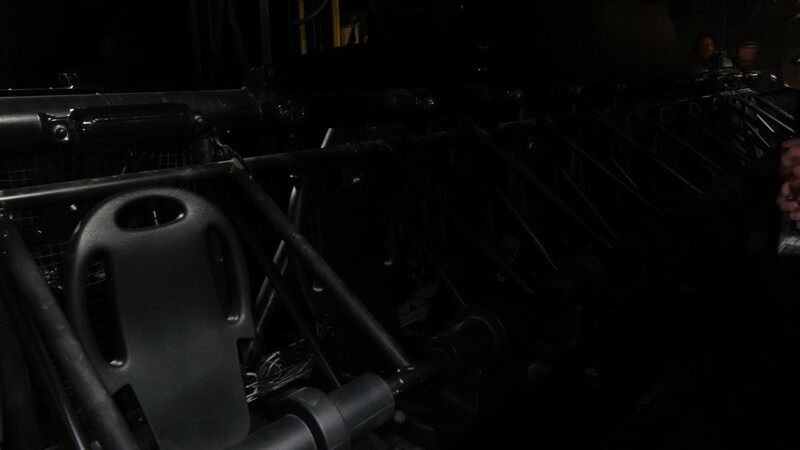 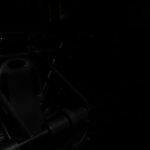 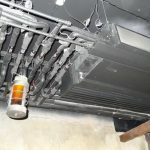 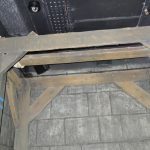 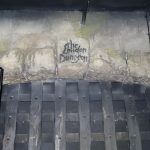 We warn you now, there are A LOT OF SPOILERS on this tour and you will see things that you wouldn’t normally see in such detail. 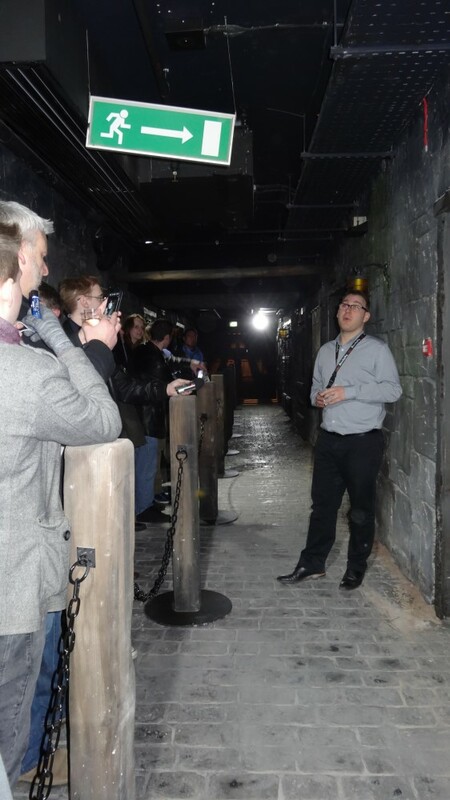 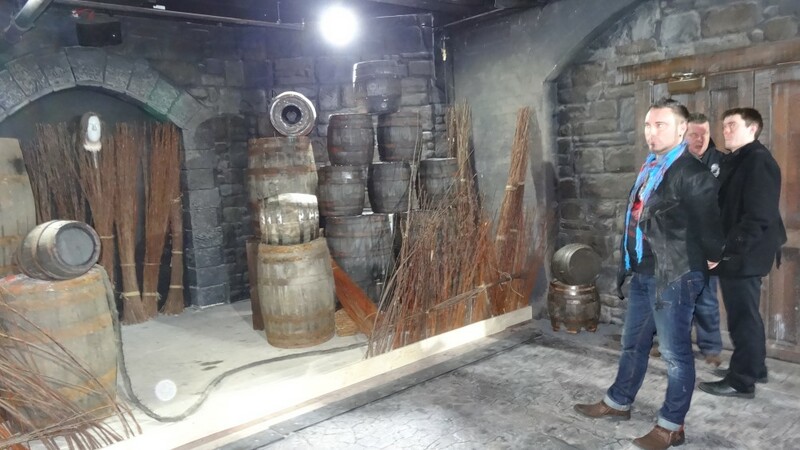 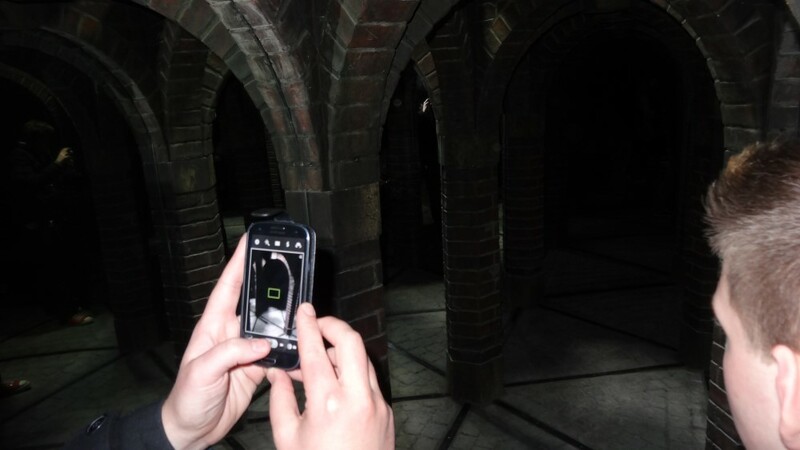 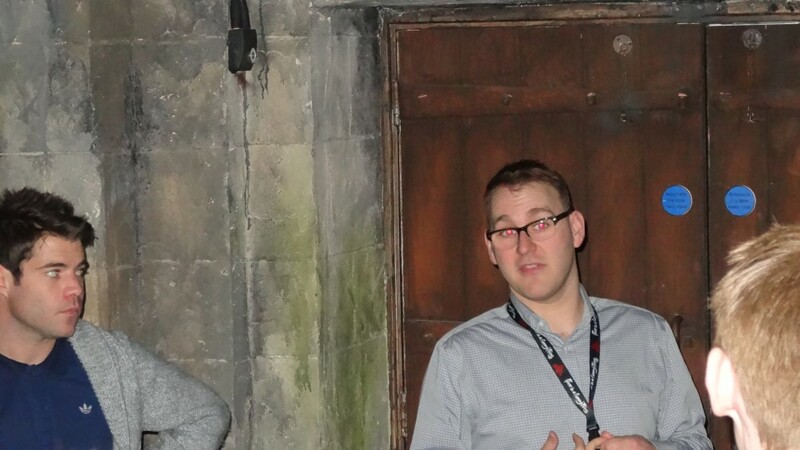 Guided around by Matt from Merlin Marketing, many questions about the new Dungeons have been answered. 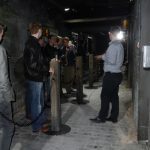 For the tour the lights were on, which means we were permitted to take a full selection of photos for your enjoyment. 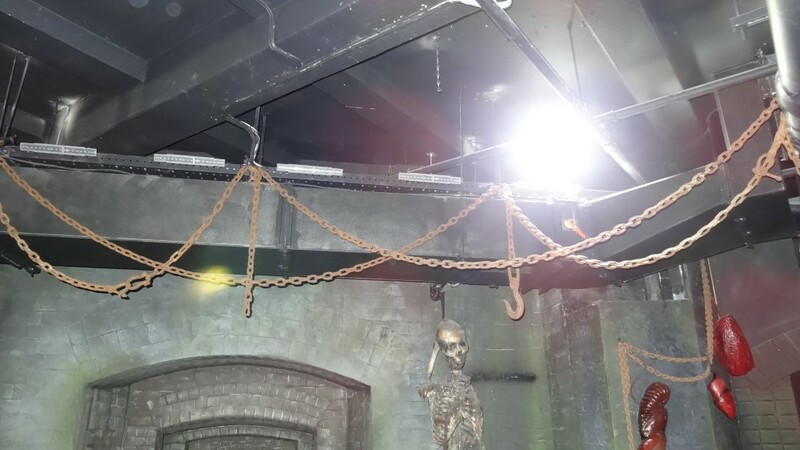 These pictures you won’t see again in such quality as you aren’t permitted to take pictures certainly with flash during any Dungeon performance. 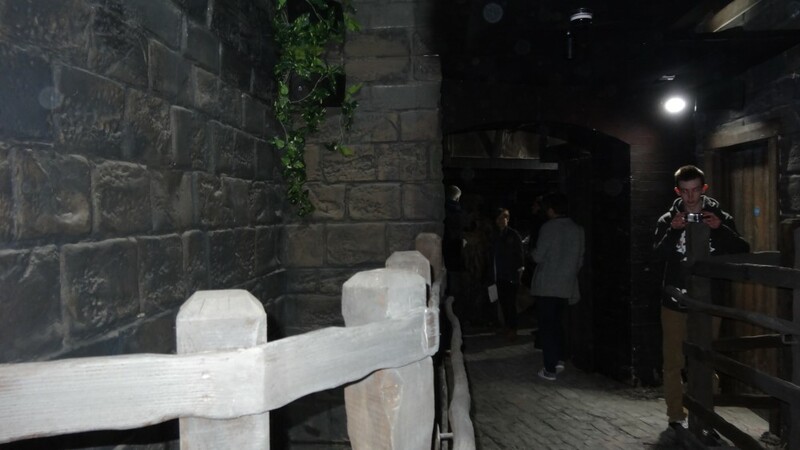 With that out the way we arrived at the Dungeon just after 7pm and got to experience the new entrance area. 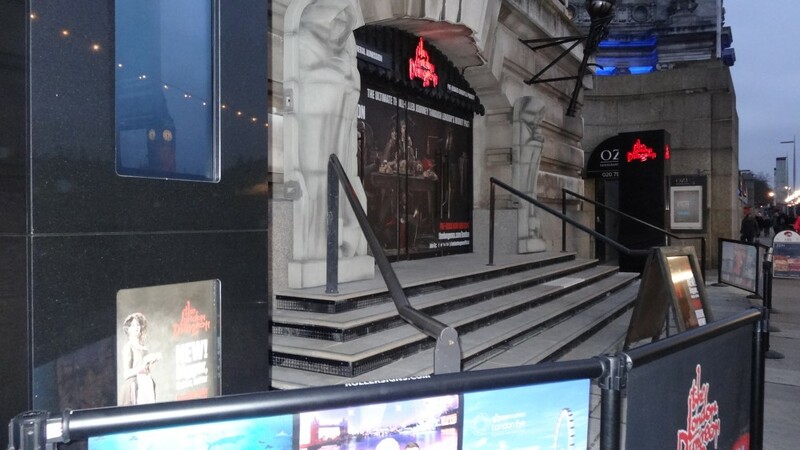 As you enter the building you will be greeted with two actors, one will be posing in the new guillotine. 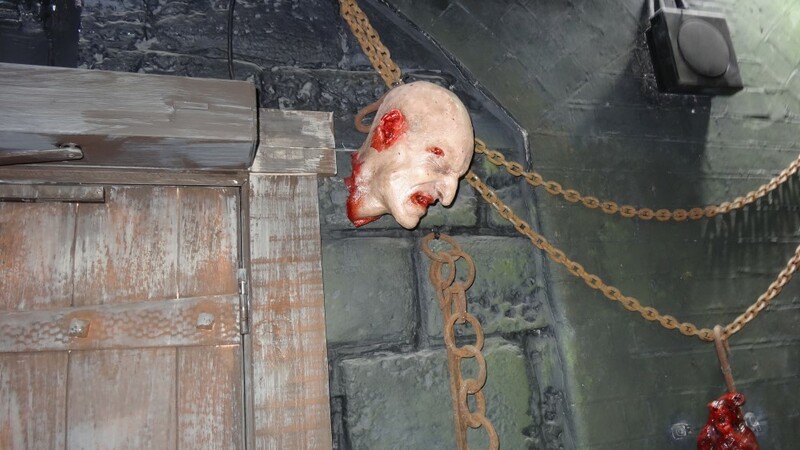 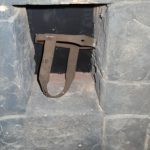 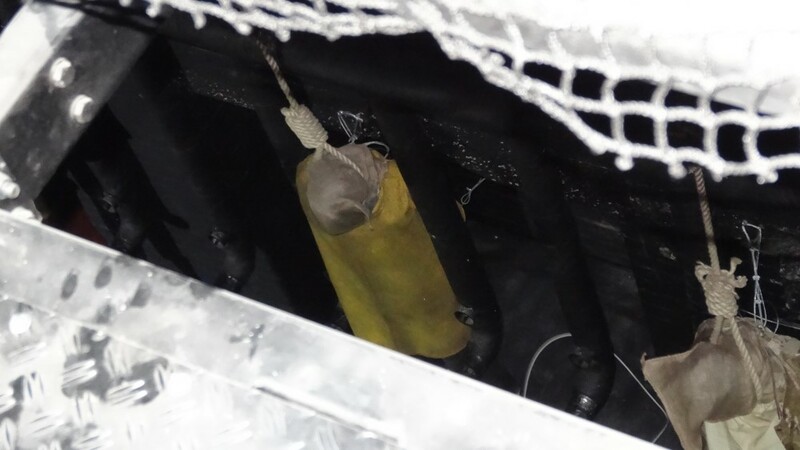 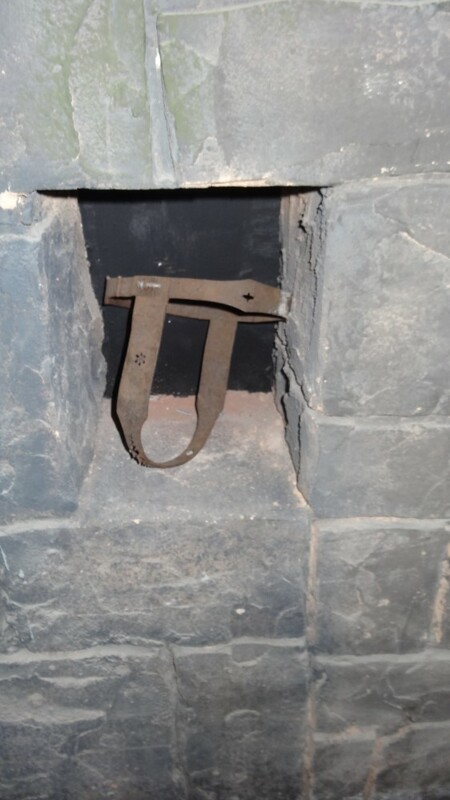 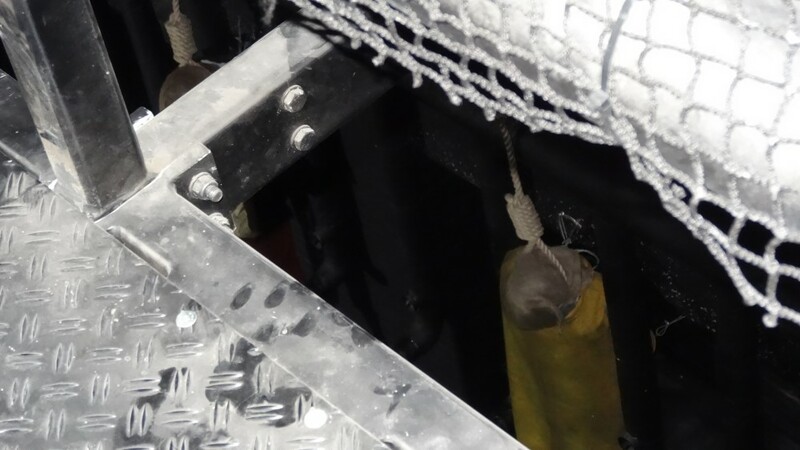 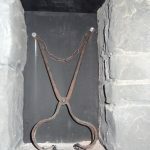 With trick buttons and a trick prop the guillotine will be shown as dropping to amputate the head of the actor. 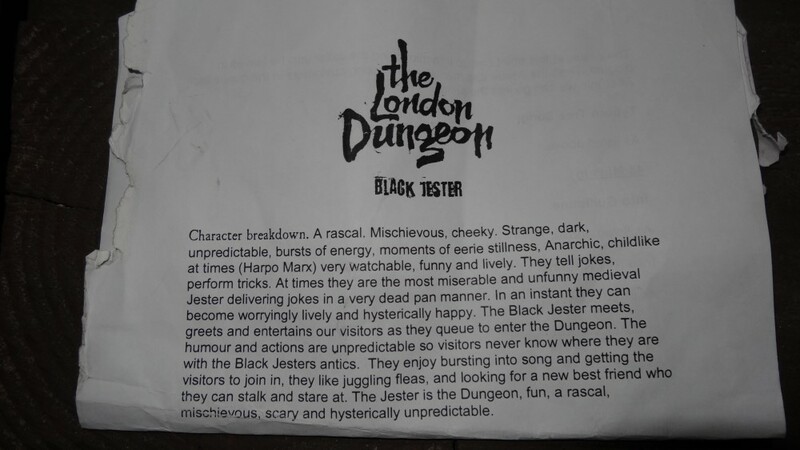 The other actor will also be greeting you, it will be a black jester just like the one in numerous other dungeons. 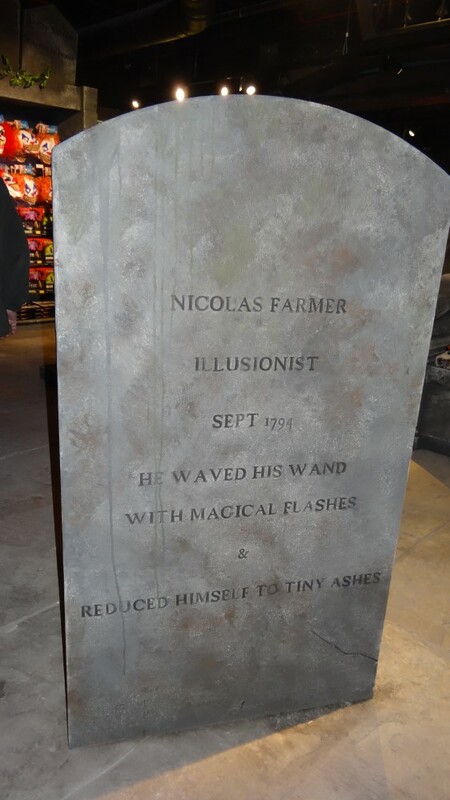 He will be funny and inviting but will also change his personality in a second. 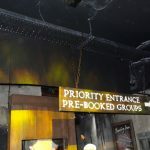 Also in addition to the cell actor there is also the usual stocks pictures which are taken of yourself, within two queues, one for the average ticket holders and one for the annual pass holders, meaning there are two different queues going different ways inside. 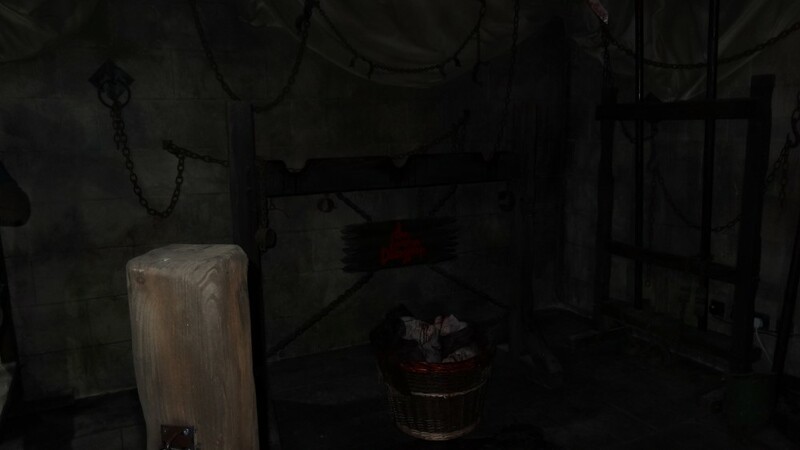 Low light and smoke effects will be used around your feet. 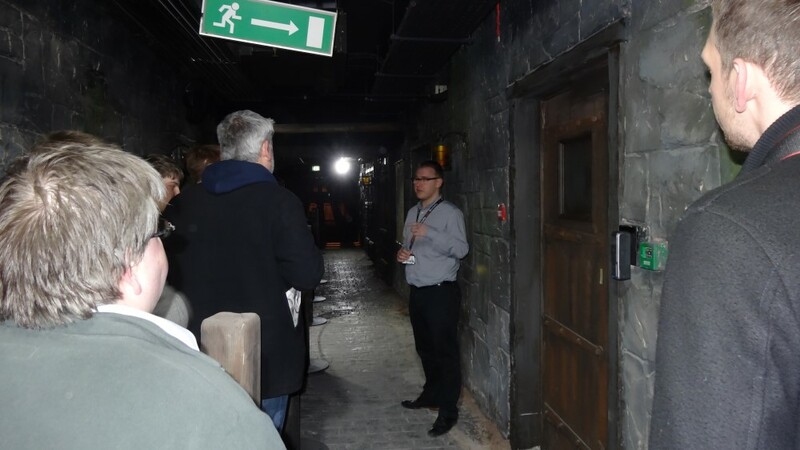 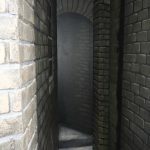 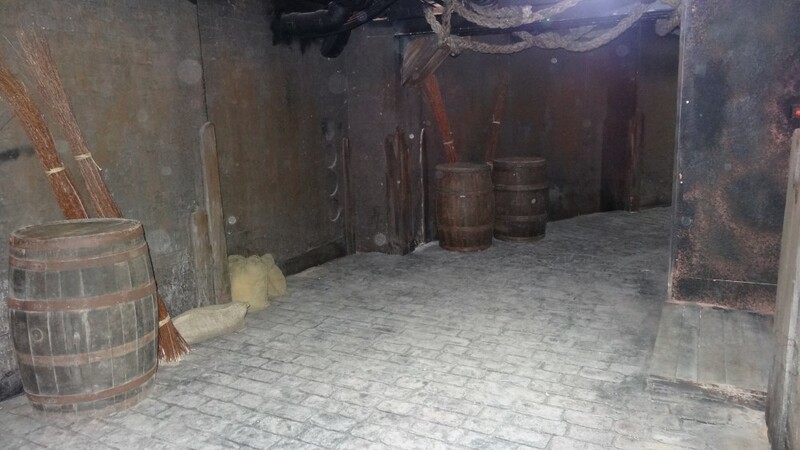 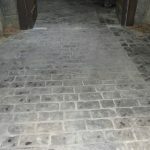 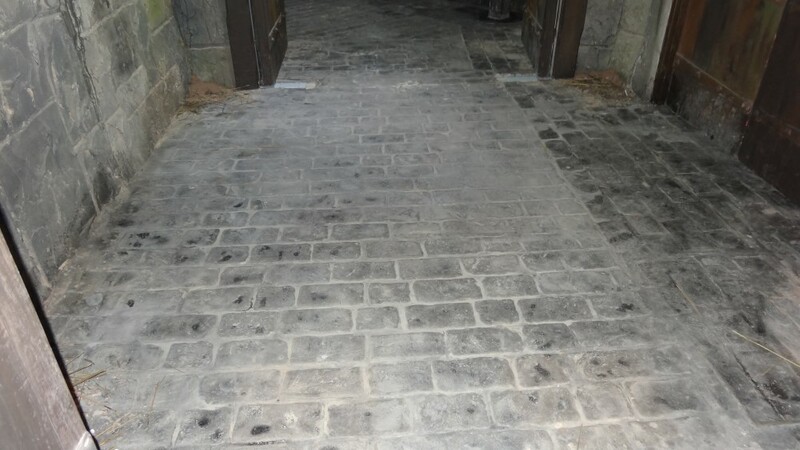 The first scene you encounter is a long cobbled hallway at this point we were told that there were seven types of floors which had been used for an authentic feel throughout the dungeons. 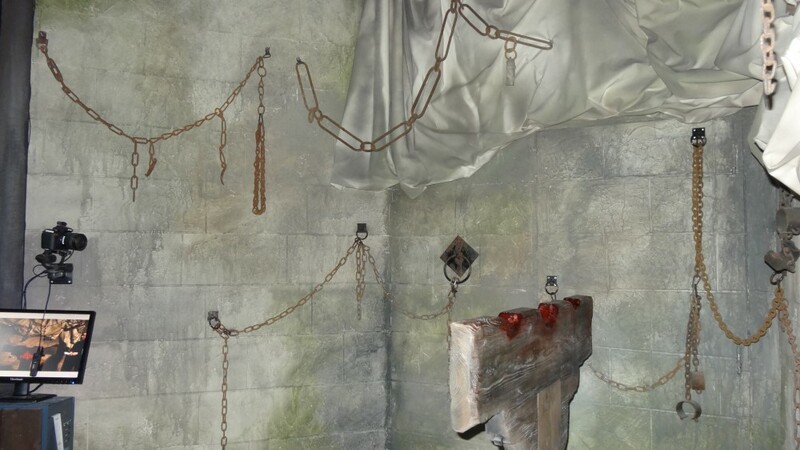 Money was spent so you could feel it, and encounter it more realistically. 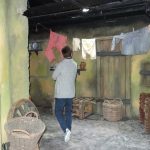 An actor will keep you entertained for a short while by interacting with visitors and telling them jokes. 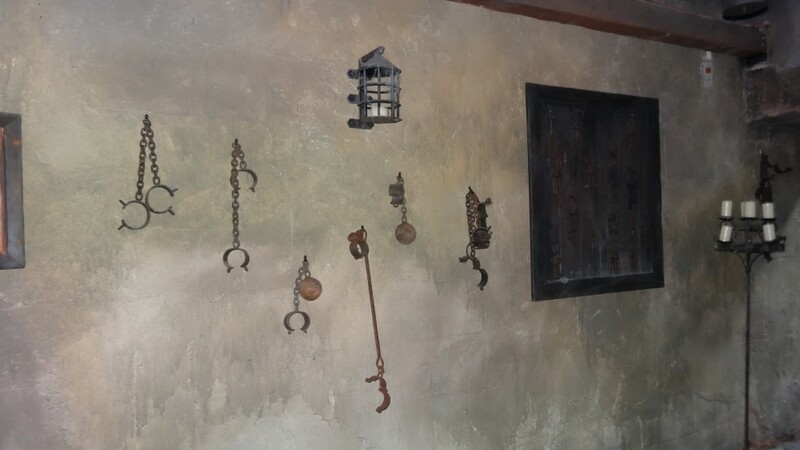 You’ll see on the walls of this hallways are different torture tools. 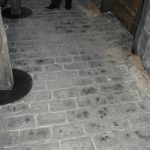 Also some of the cobbles bricks spin around with a question about the past, spin the brick again and you will find the answer on another side. 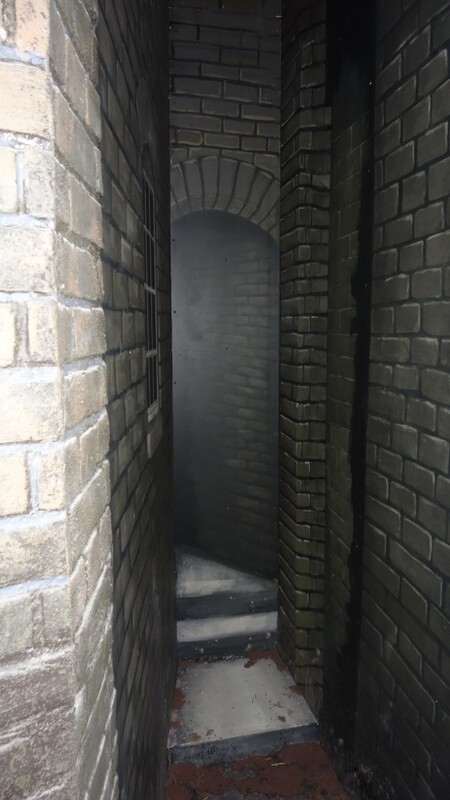 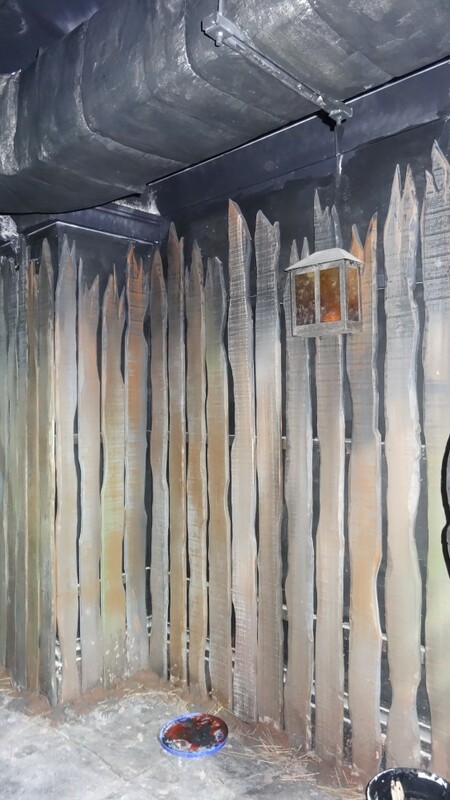 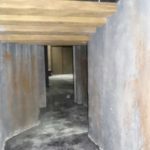 Towards the end of this hallway there will be animatronics sounds and mannequins, giving guests a real scare before they enter the worse to come! 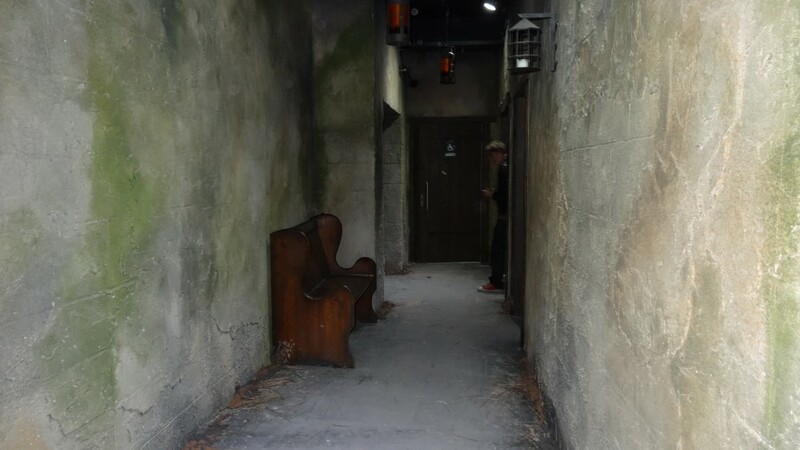 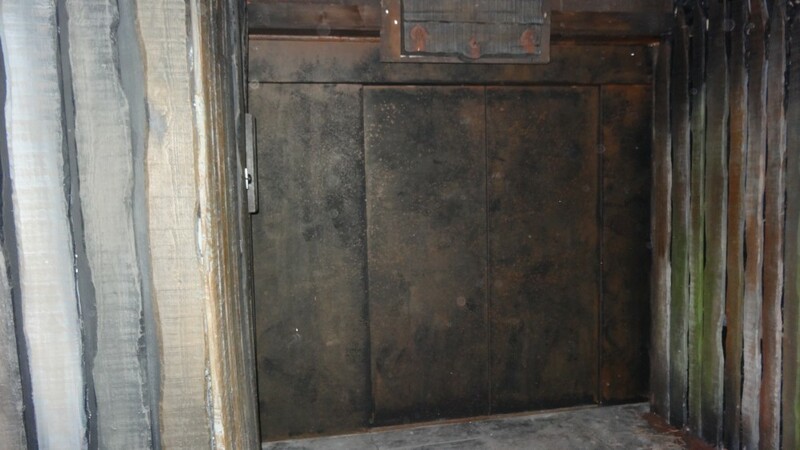 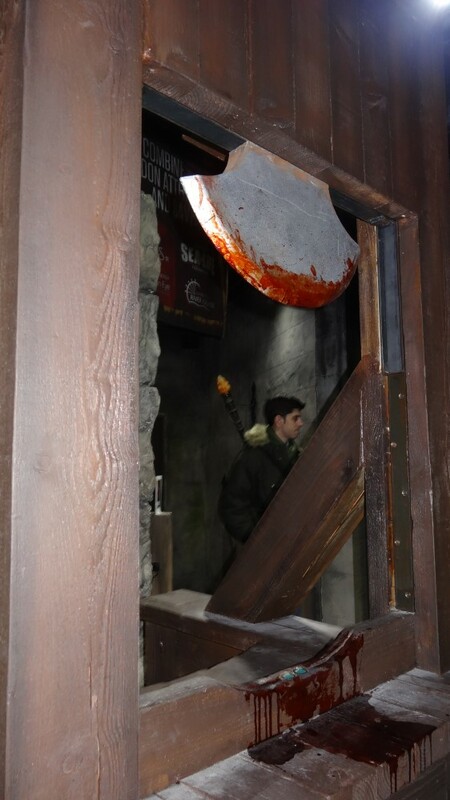 There is also an interactive door at the bottom of this hallway to provide scares and interaction with the visitors! 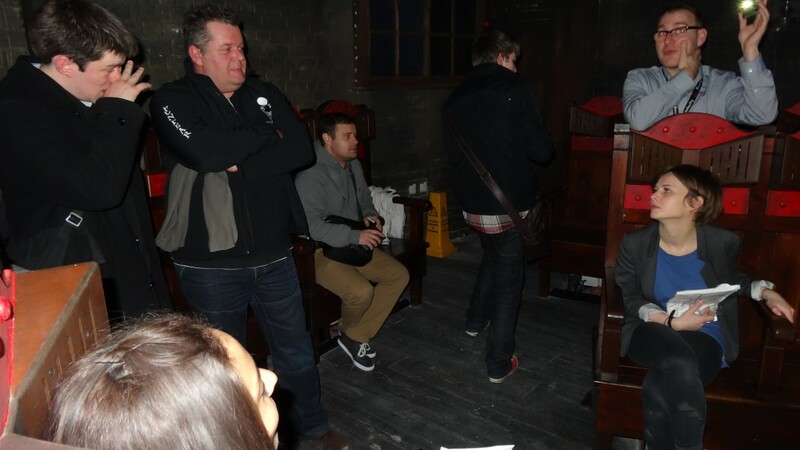 The next room we entered was another ticket office, which looked like a library room. 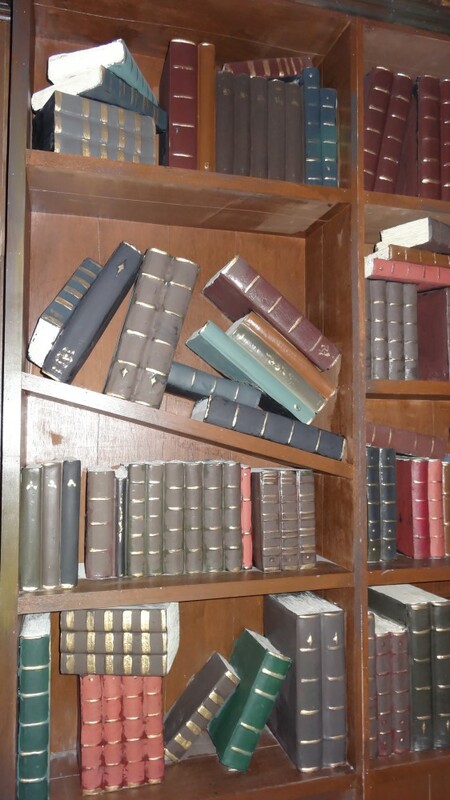 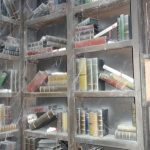 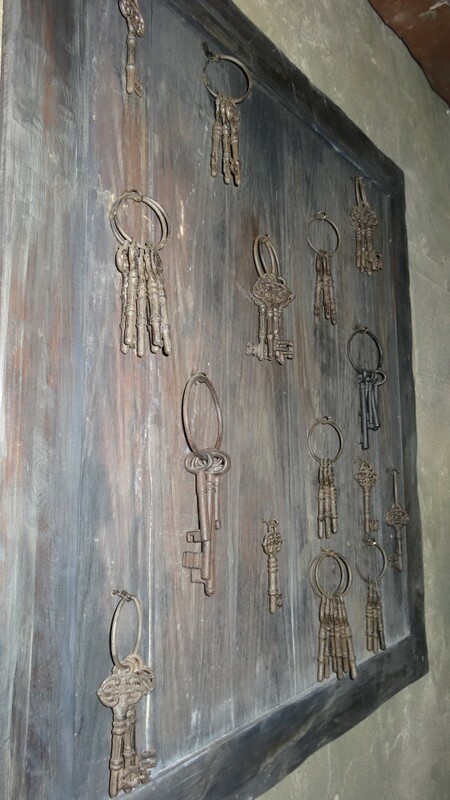 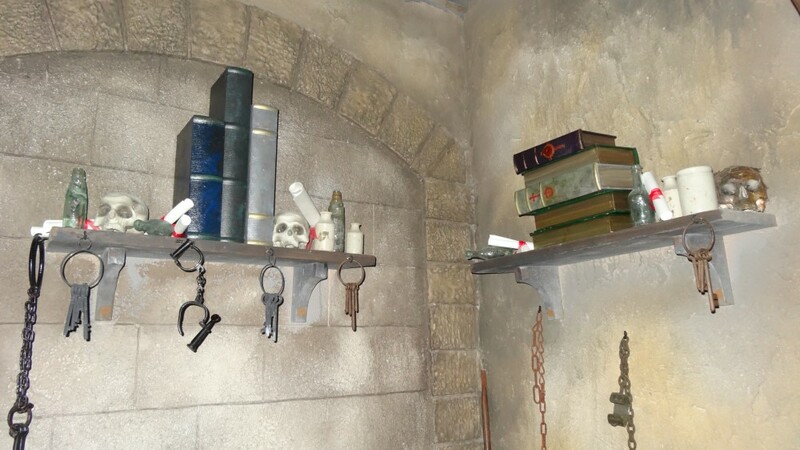 Books all around and lots of keys placed on the walls. 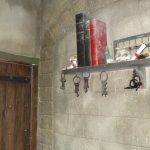 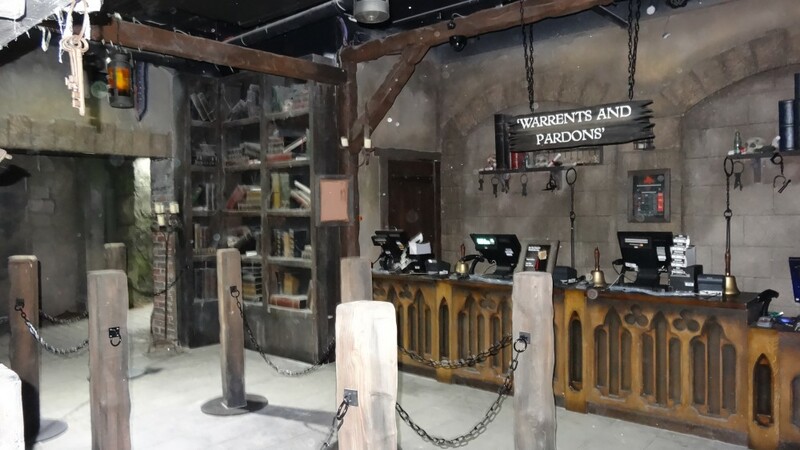 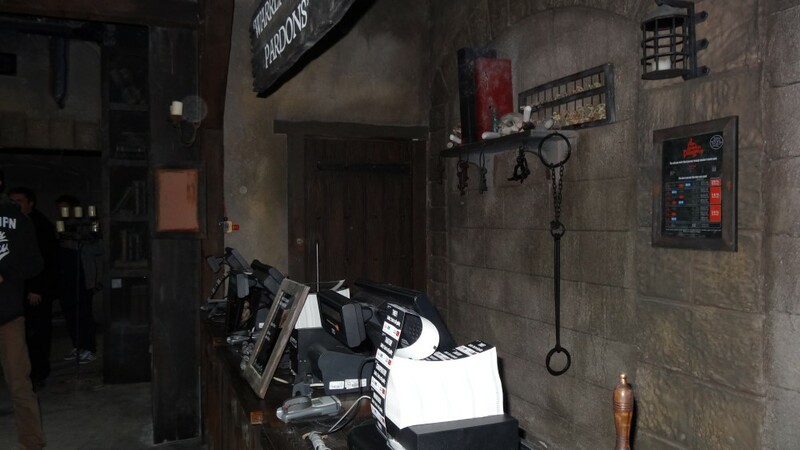 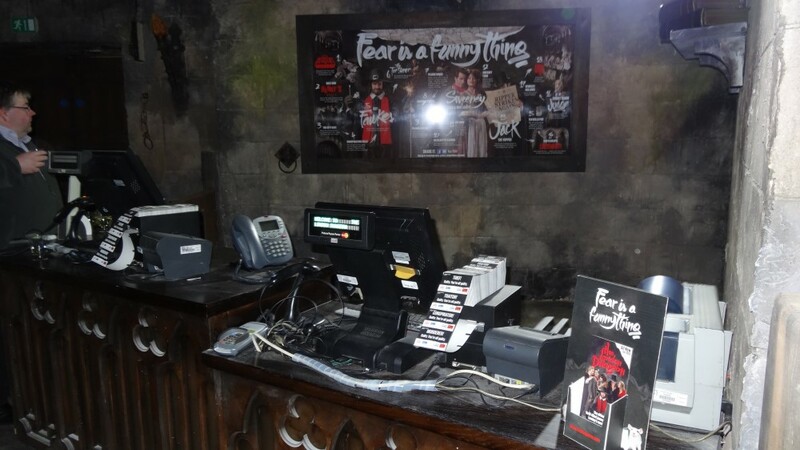 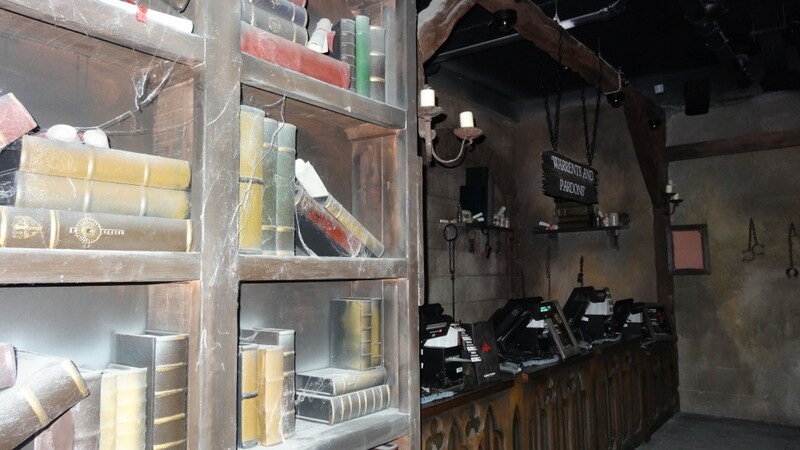 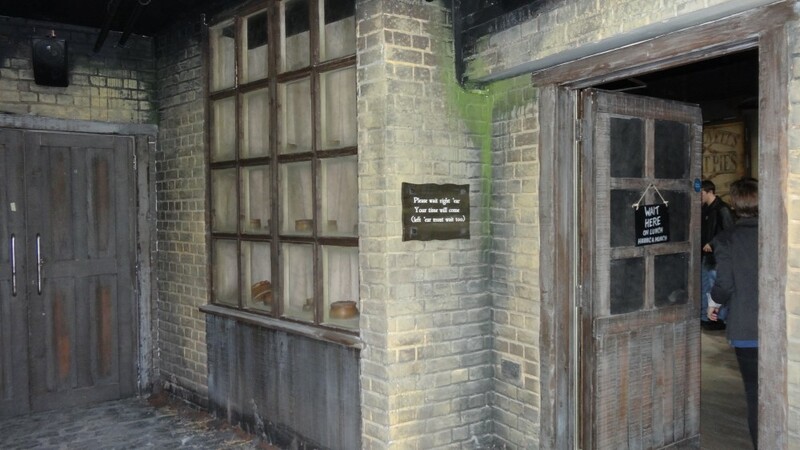 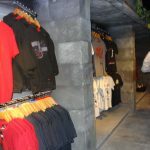 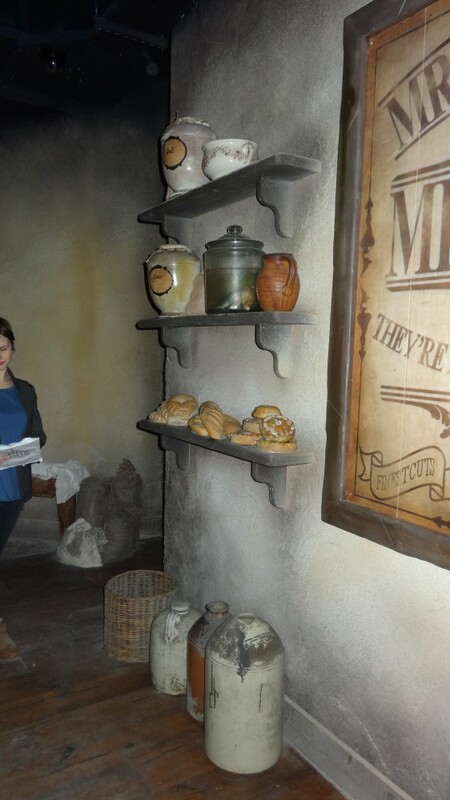 This will be the main ticket office you will come to when you visit The Dungeons. 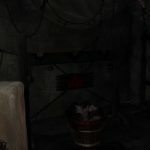 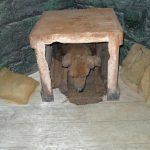 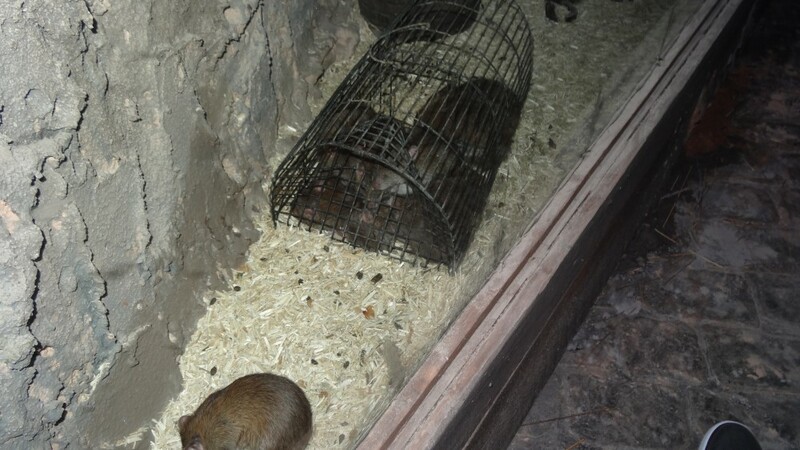 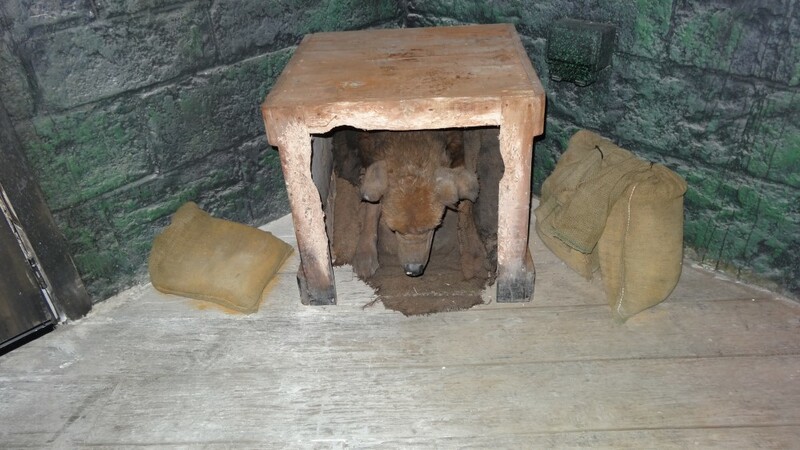 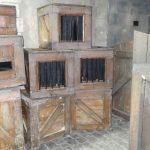 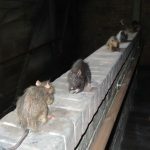 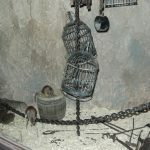 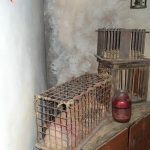 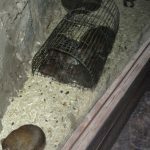 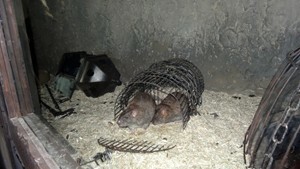 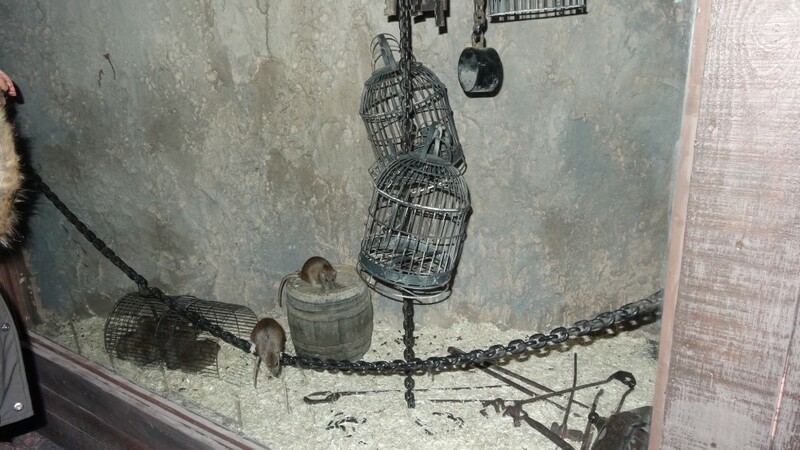 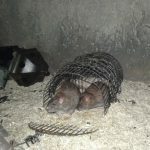 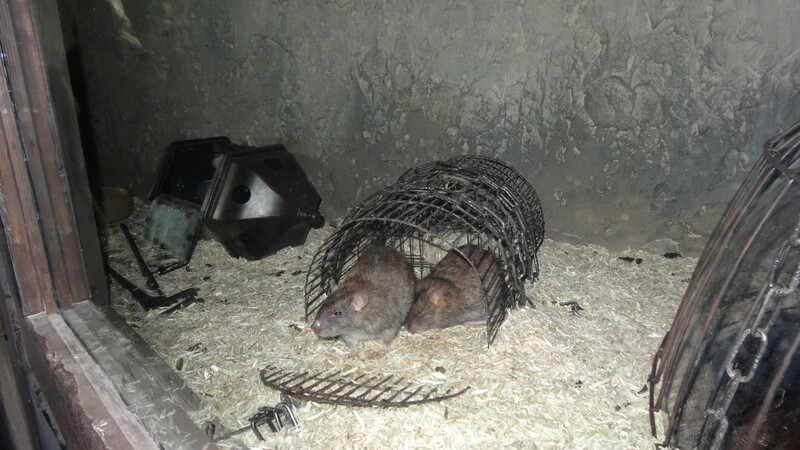 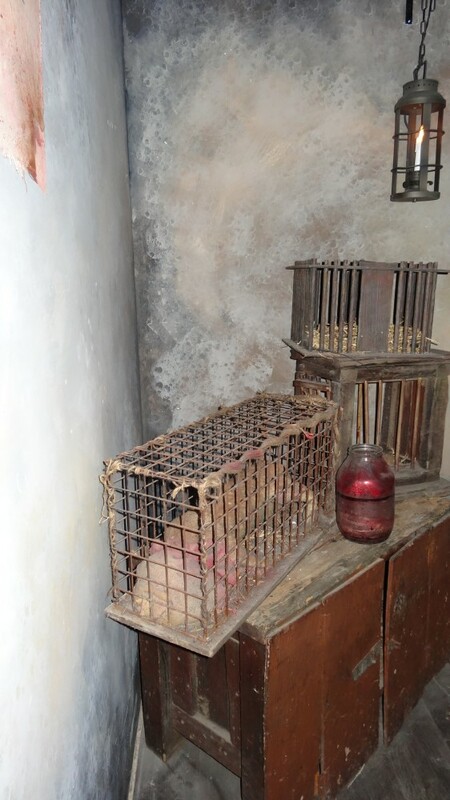 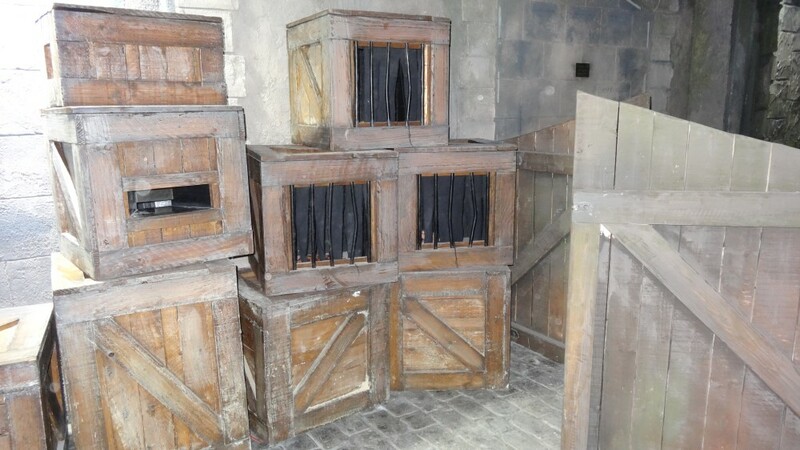 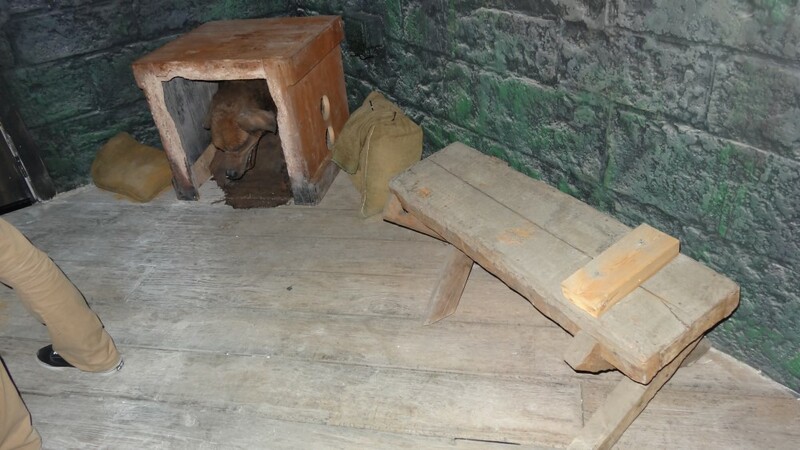 Then you will meet the rats, a small narrow hallway with cages either side full of REAL rats. 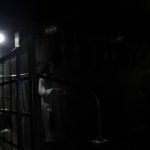 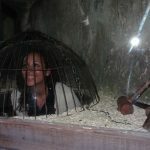 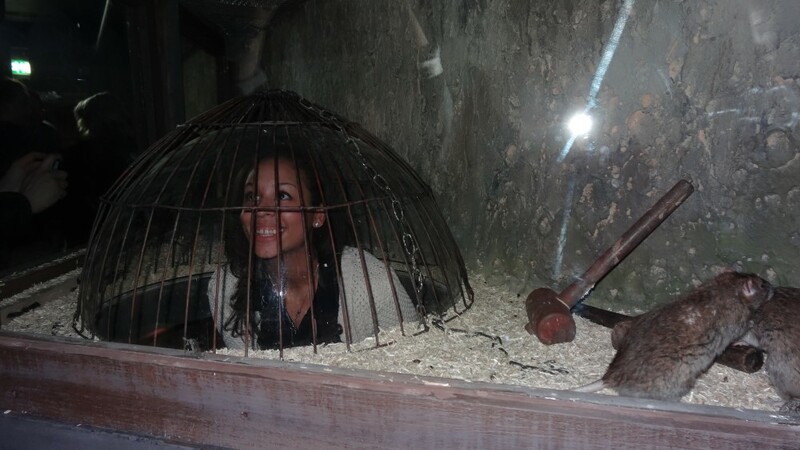 There is a small lookout between one of the cages where you can put your head into and feel as if you were in with them! 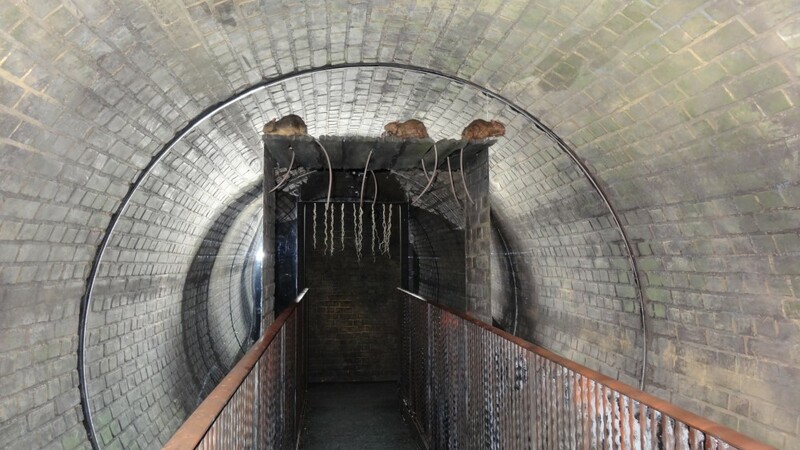 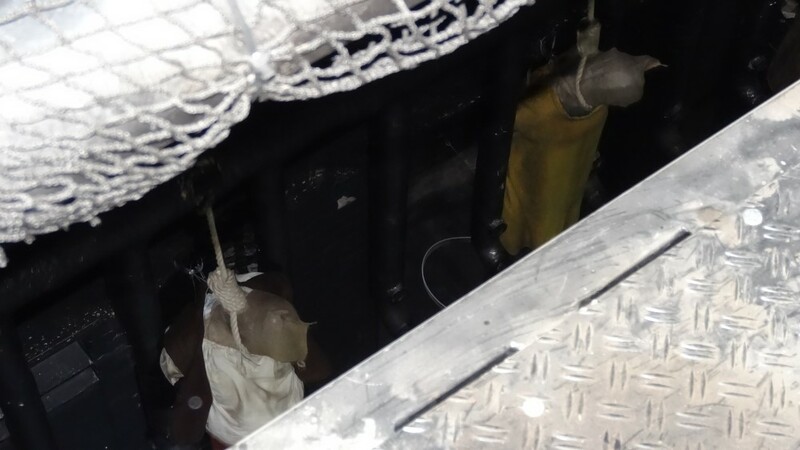 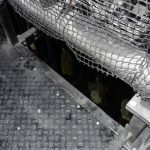 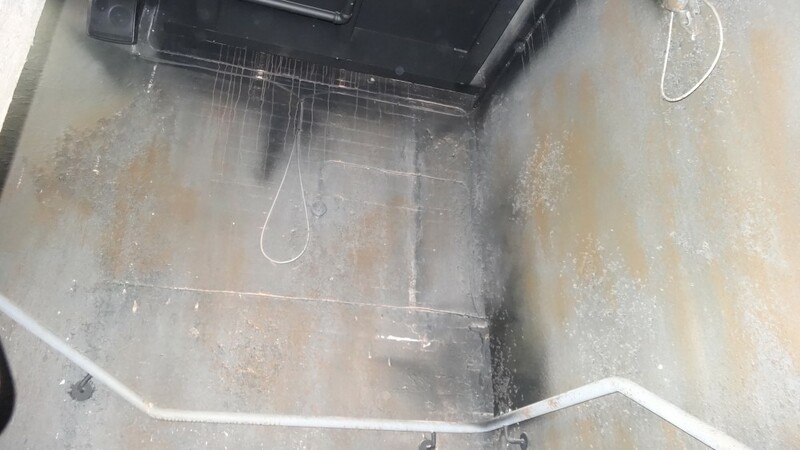 After you have met the rats your tour will begin with the lift, this lift will take you down to the bottom floor where your journey will begin. 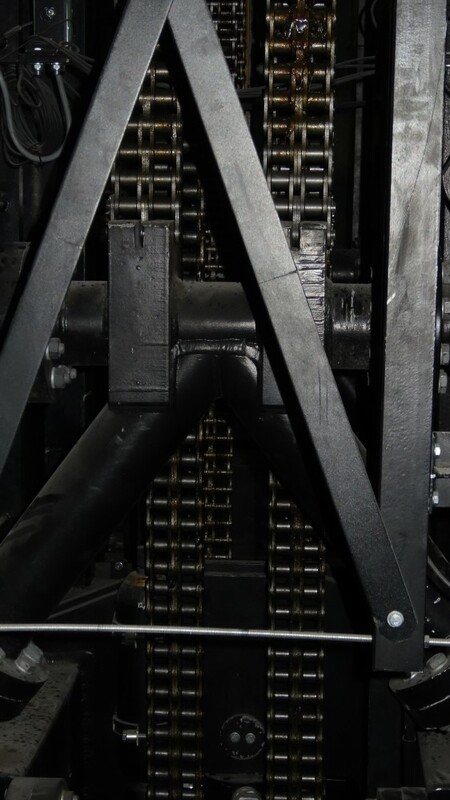 This lift can hold up to 140 people (although you probably will never be put in there with that amount of people!) 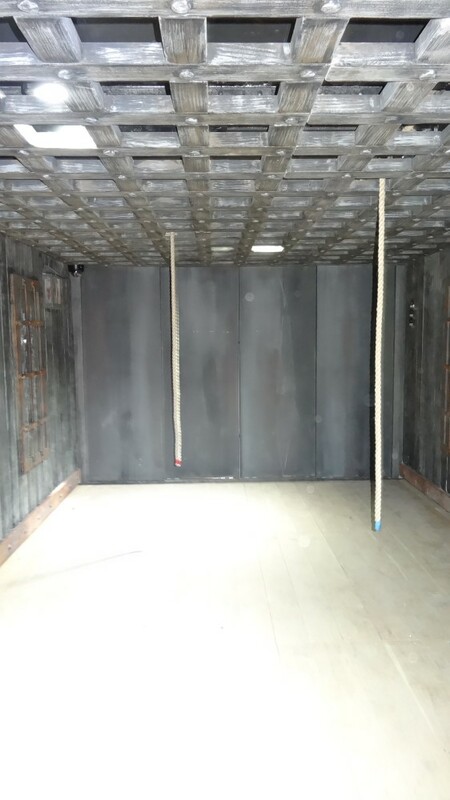 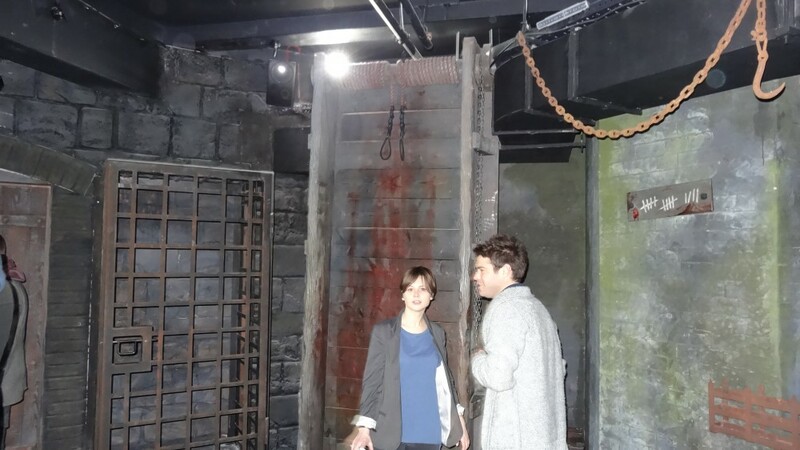 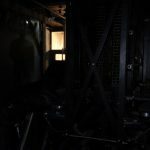 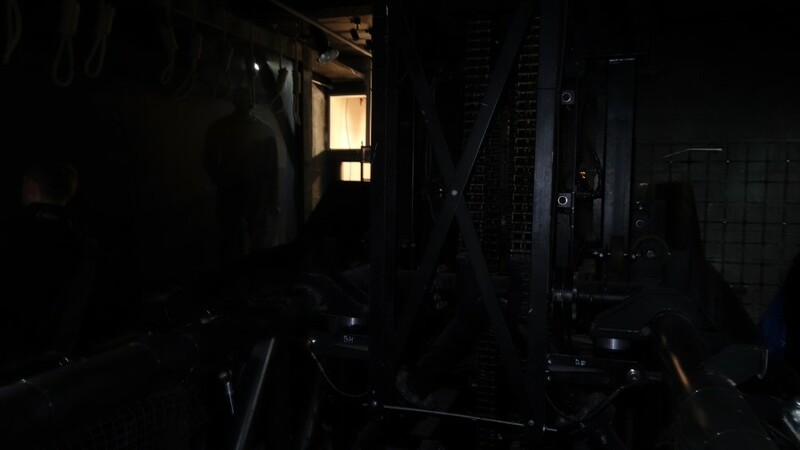 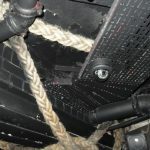 You will see inside the lift there are two hanging ropes, these are placed there purposely for the visitors inside to interactive with the actors. 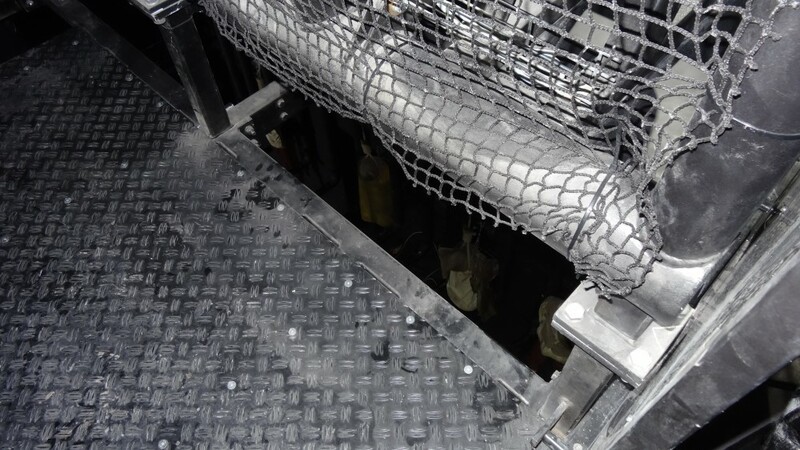 There will be a story that the lift has broken and that you need to pull on the ropes before you plummet to your death. 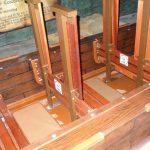 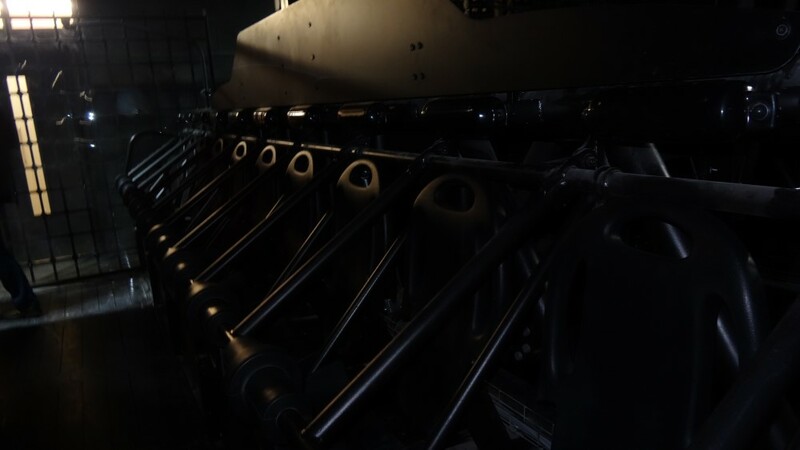 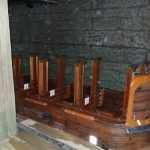 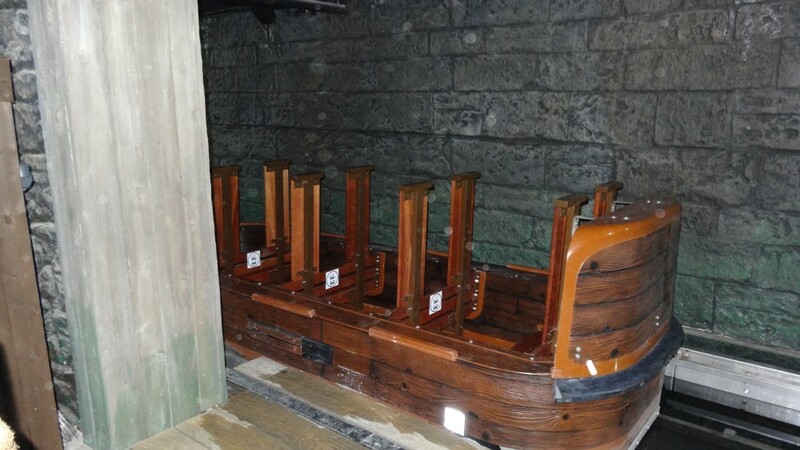 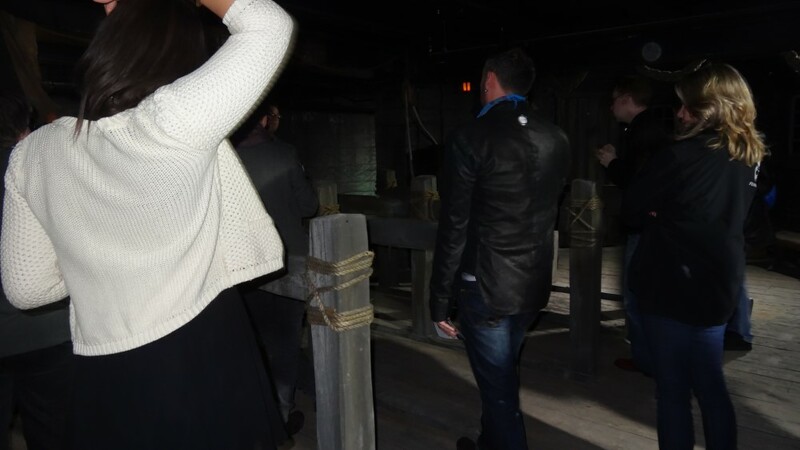 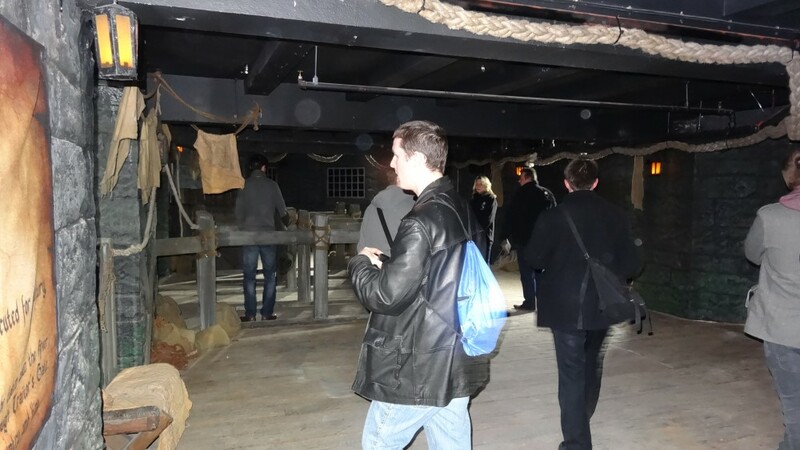 When you step out from the lift you will feel a wind effect hit you as you enter the Henry the eight boat ride. 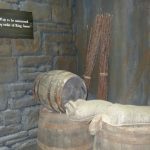 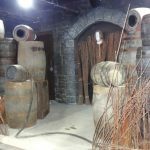 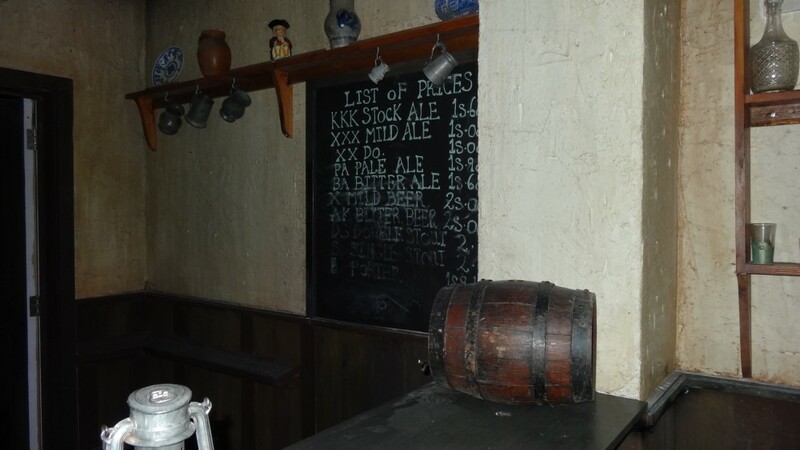 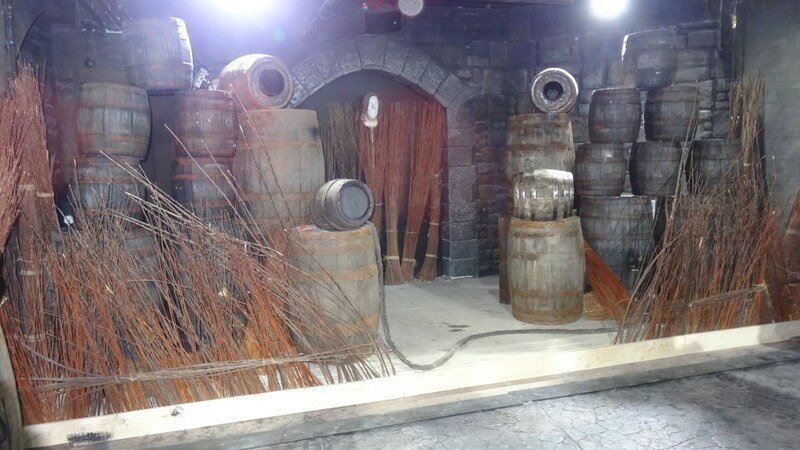 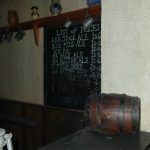 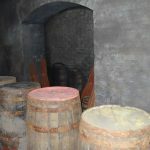 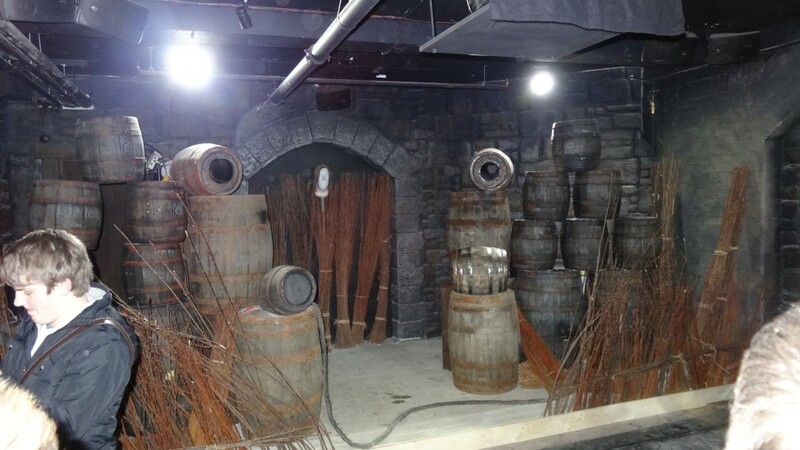 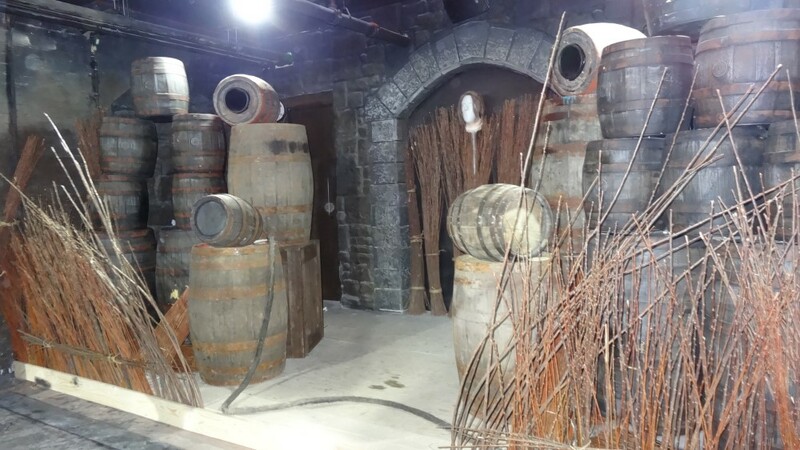 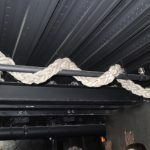 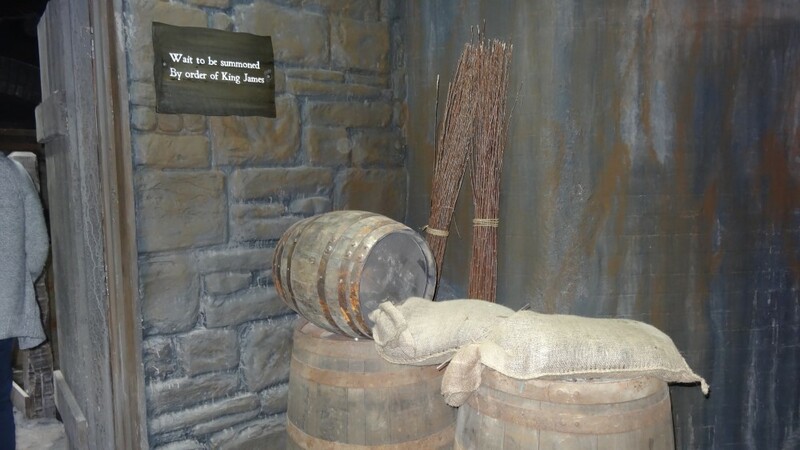 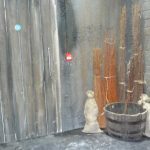 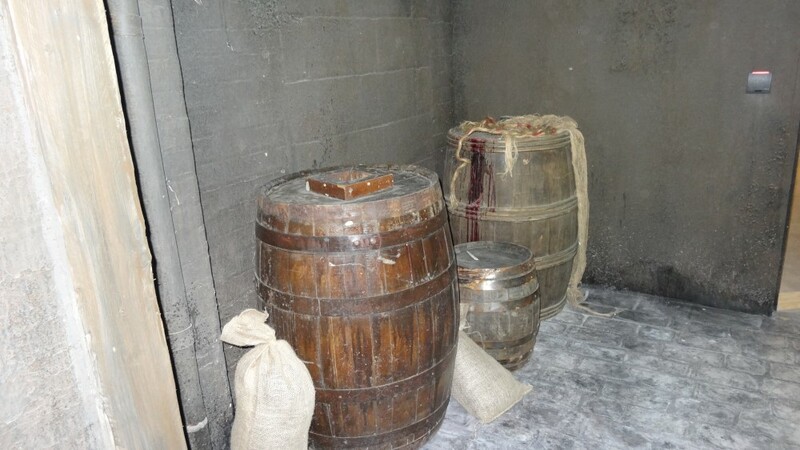 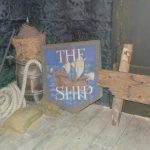 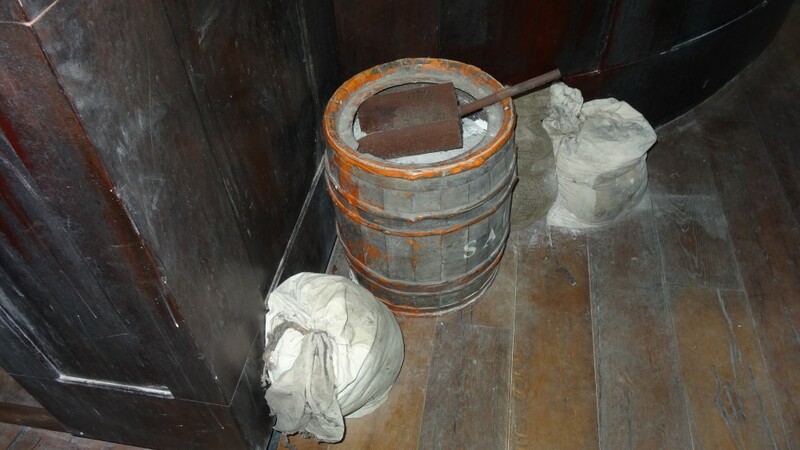 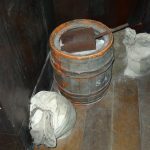 You will find items around this room like rope, wheels from the ships, barrels and signs. 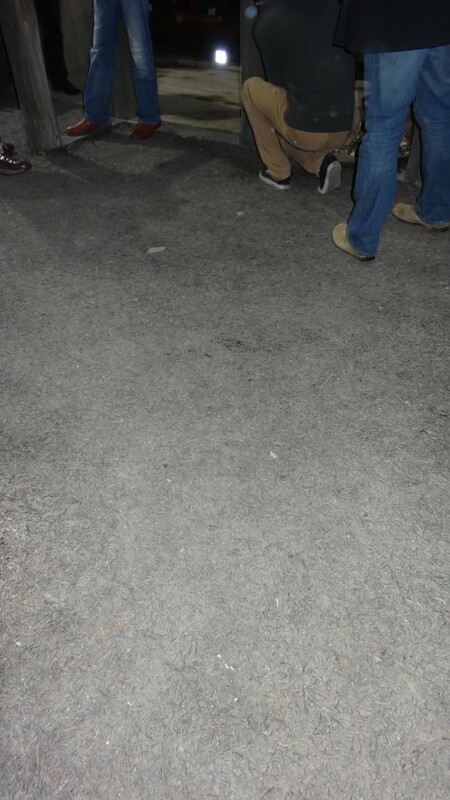 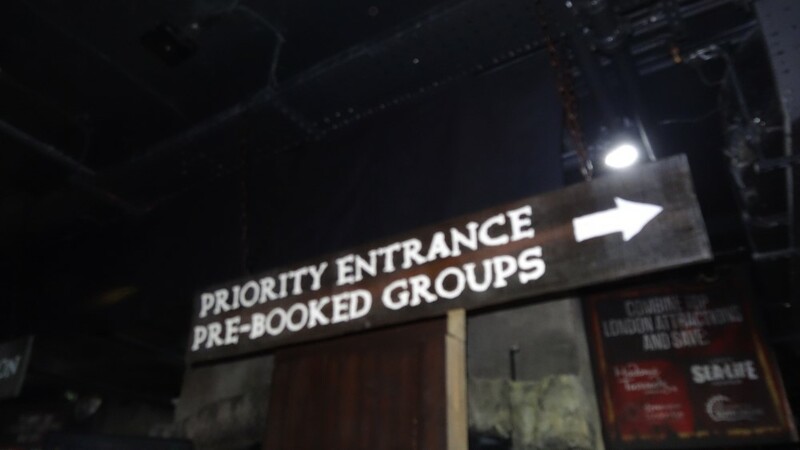 There is also a queue layout for you to await your turn. 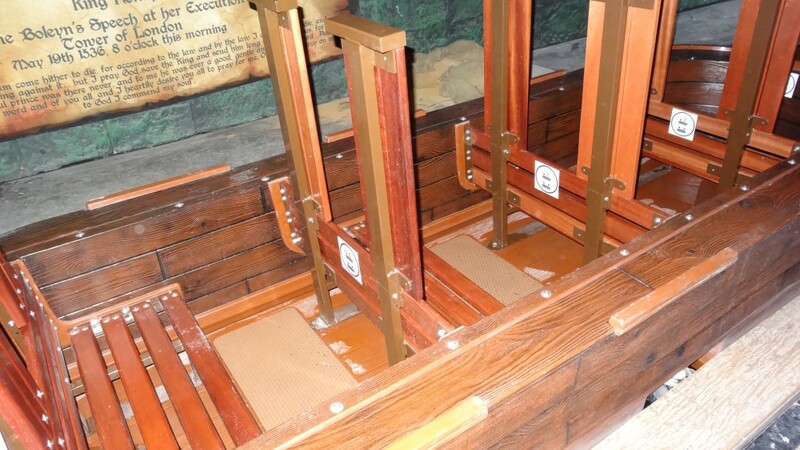 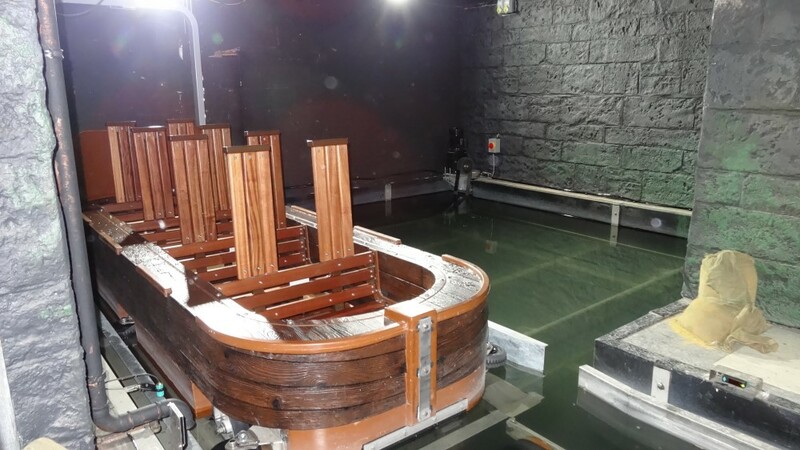 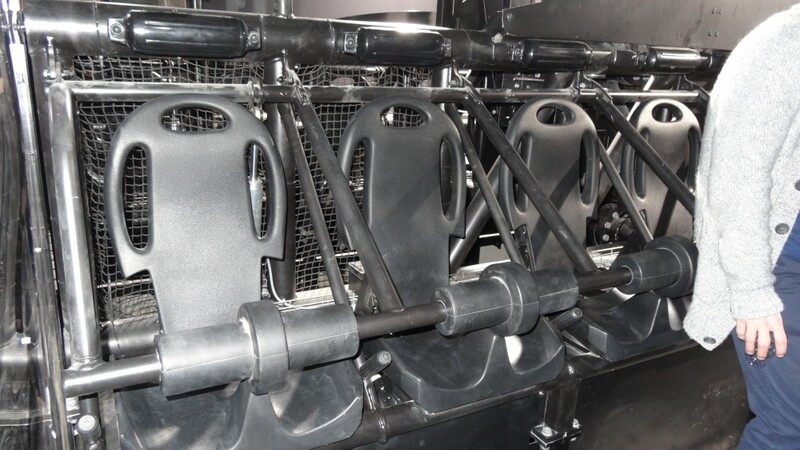 The boats are differently designed, with a higher backrest as the ride tilts further backwards than it did before! 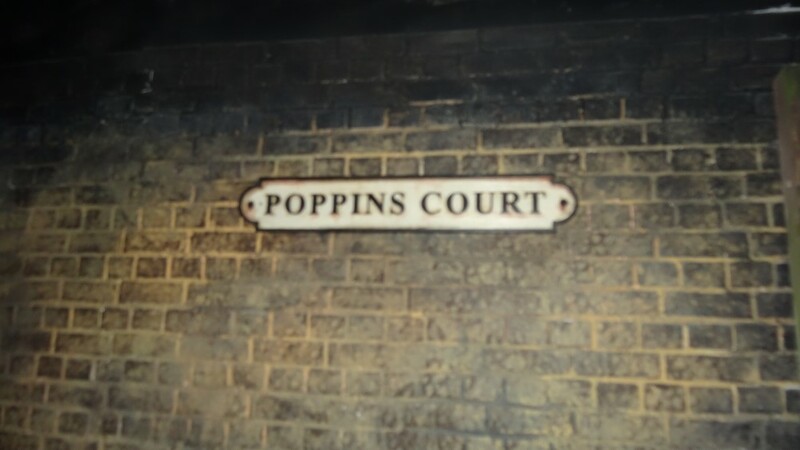 Just a note you will get much wetter than you did before! 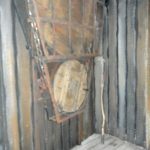 When you step of the boat you will meet the gong farmer! 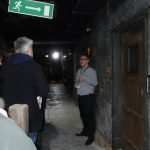 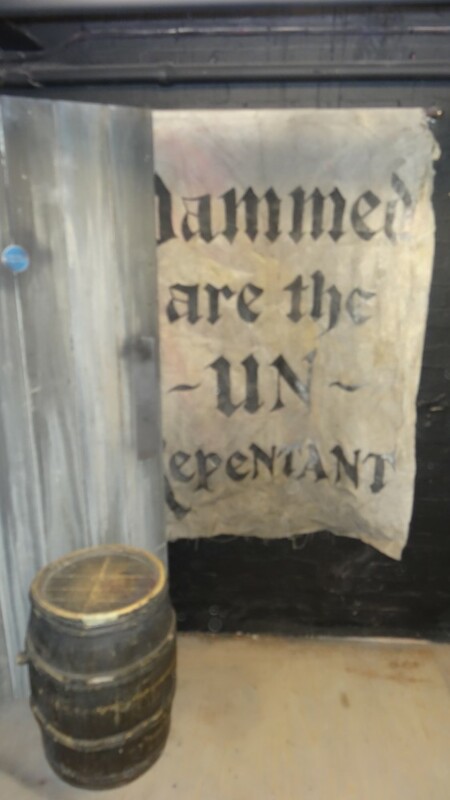 All of the visitors will get to see him and hear is story, unlike Tooley Street as some people missed Mrs Lovett’s speech! 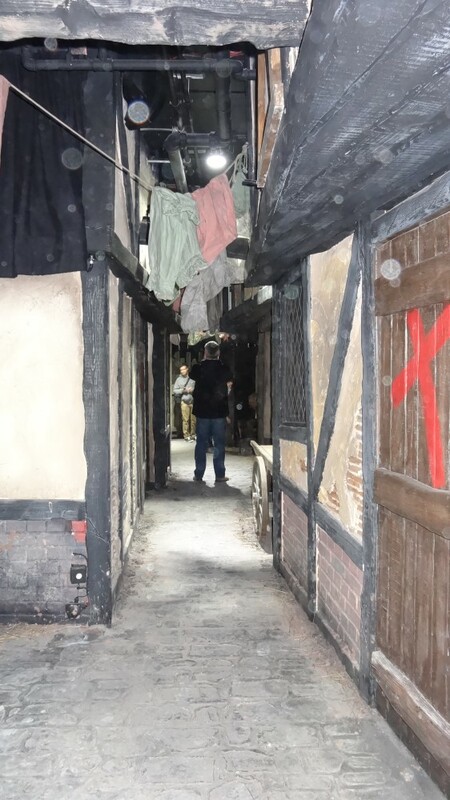 This scene looked like a castle courtyard with a big bricked building and a rope running up the side of it, the idea of this is that the gong farmer you meet will be throwing ‘bags of poo’ down at you as you walk through. 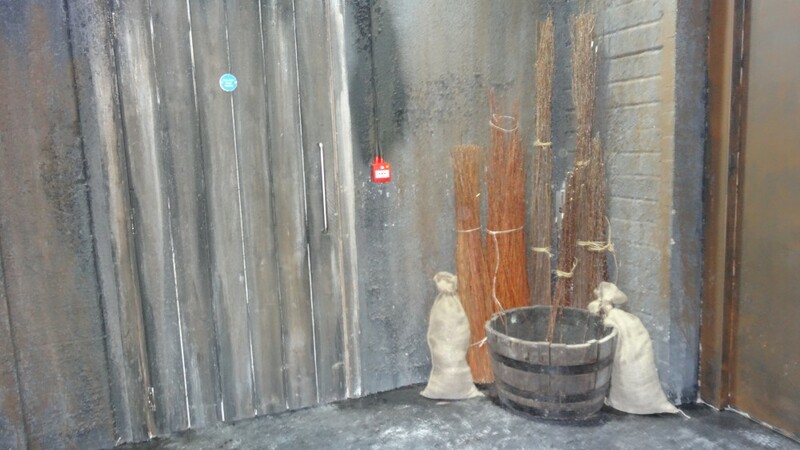 Other props in this area include skeletons in cages and wheelbarrows. 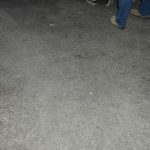 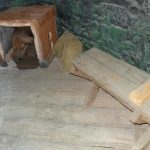 With a hay like floor there is a dirt on each of the side and in the corners of the room. 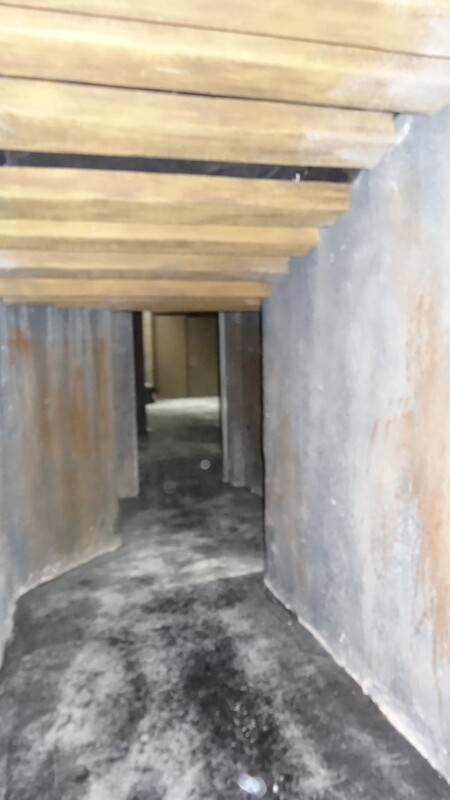 Walking through to the next scene you will come across a lot of rubble to the sides of you, look closely and you will see that these contains bodies! 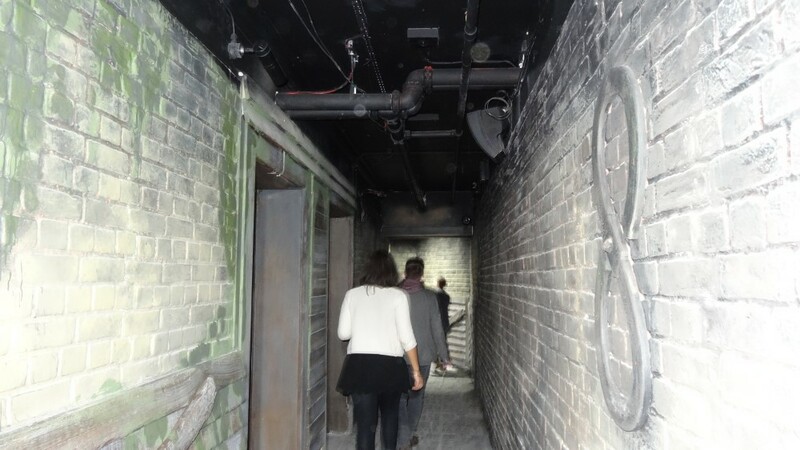 Walk on and you’ll find the hallway gets quite considerably smaller, the idea of this is to make you feel disorientated by making you crouch down to get through! 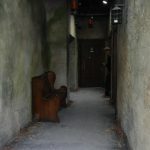 The end of the hallway you will meet a animatronics character who will make loud noises as you pass and rattle at the cages. 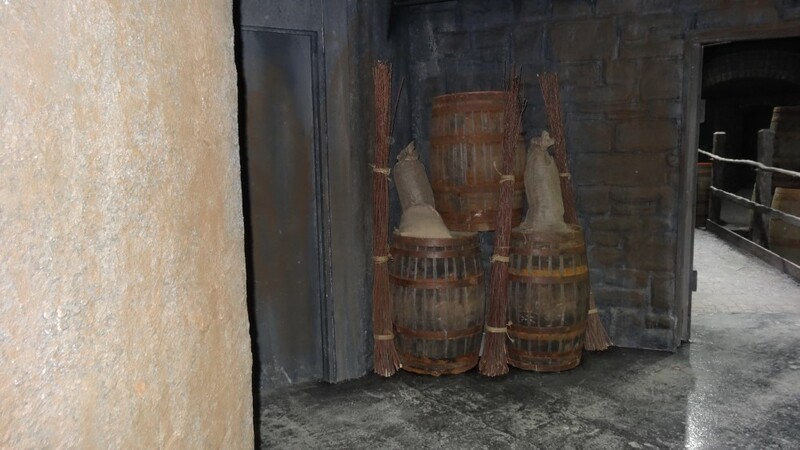 You then walk through a small village with huge barrels either side of you and what seems to be bundles of straw. 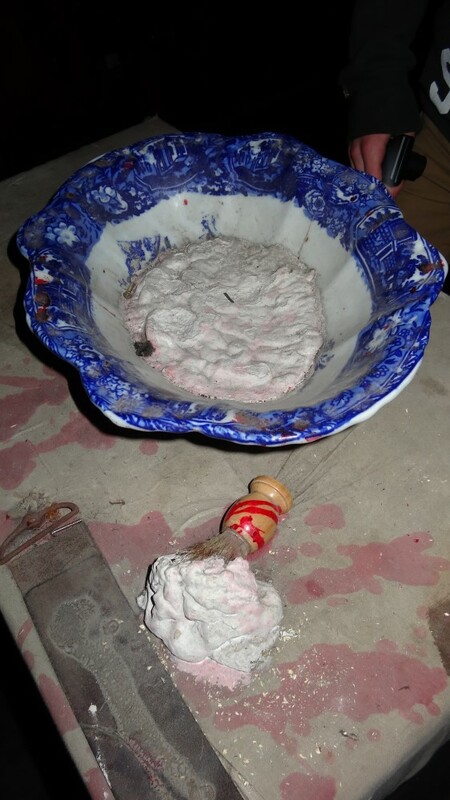 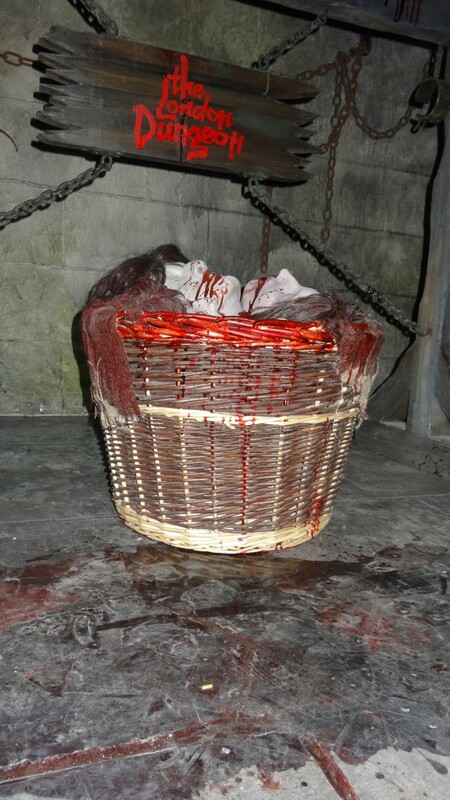 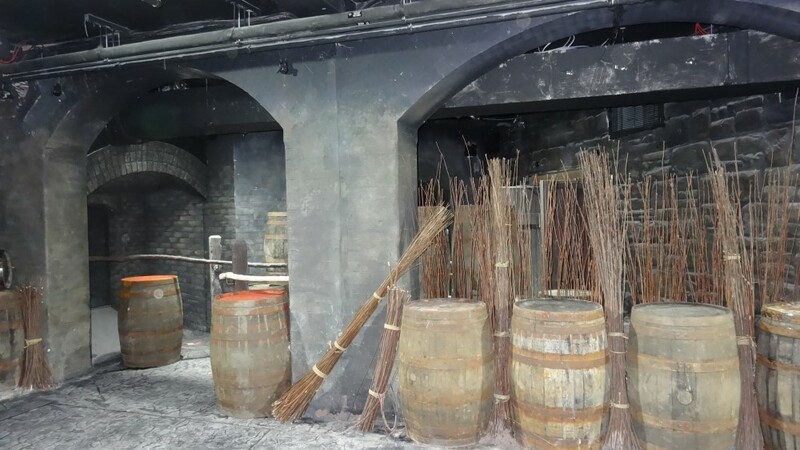 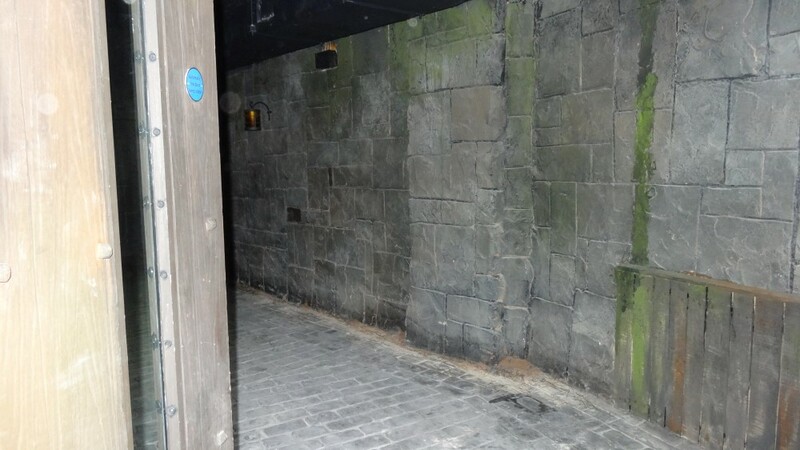 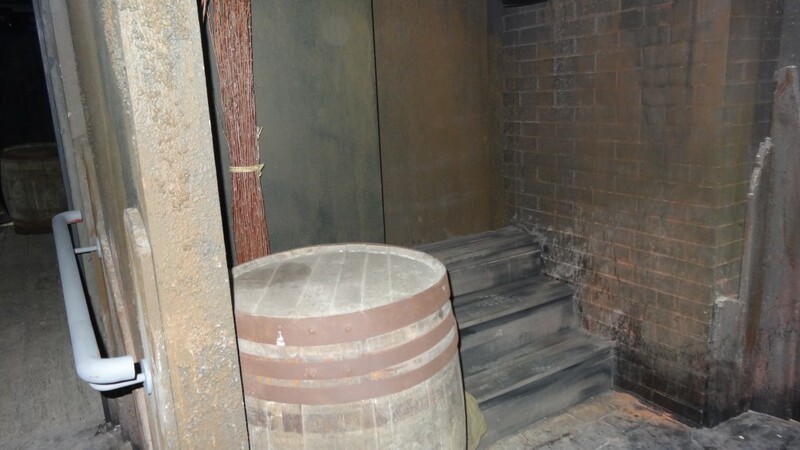 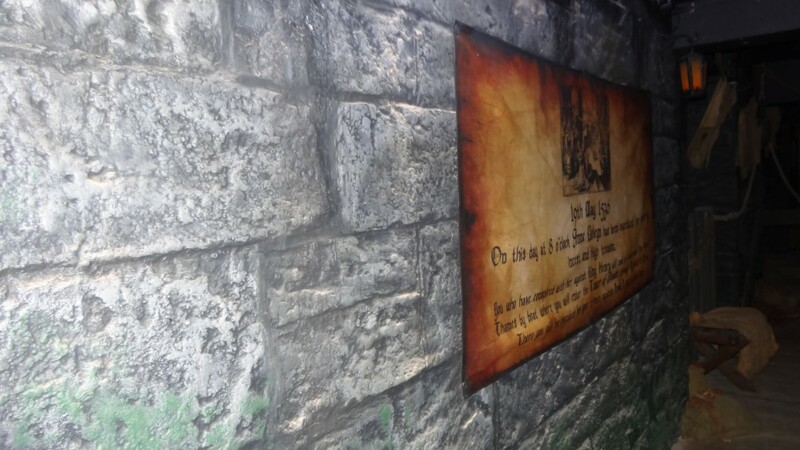 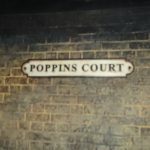 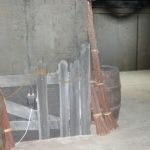 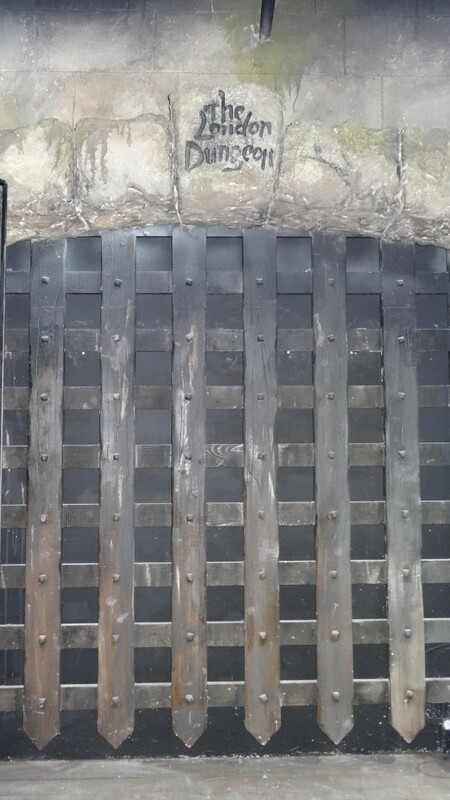 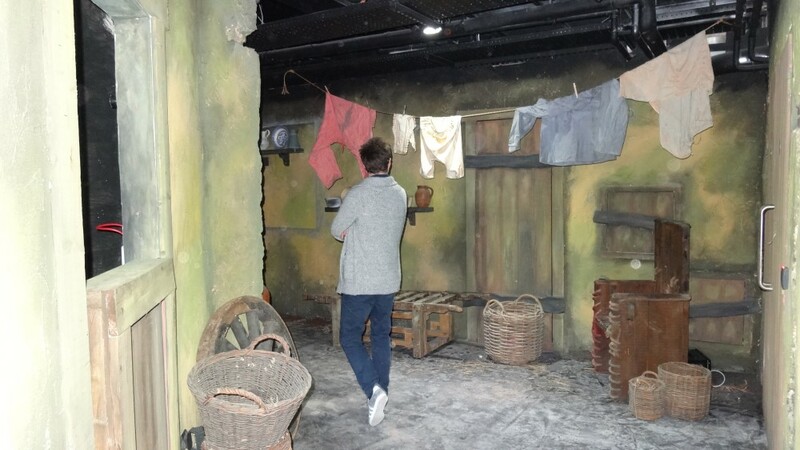 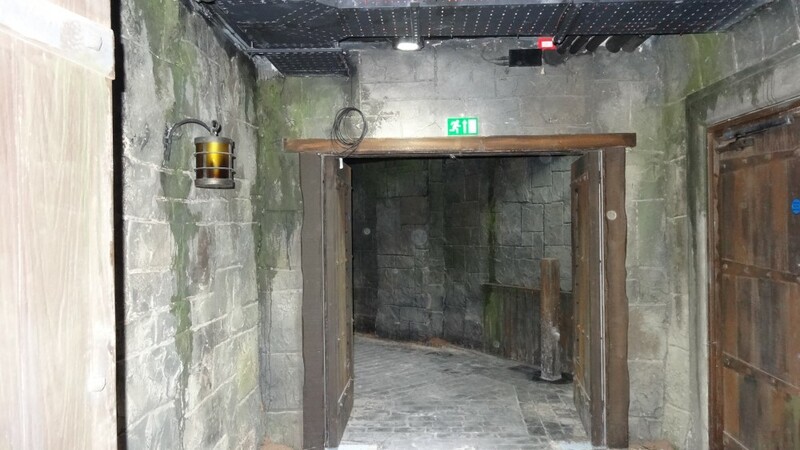 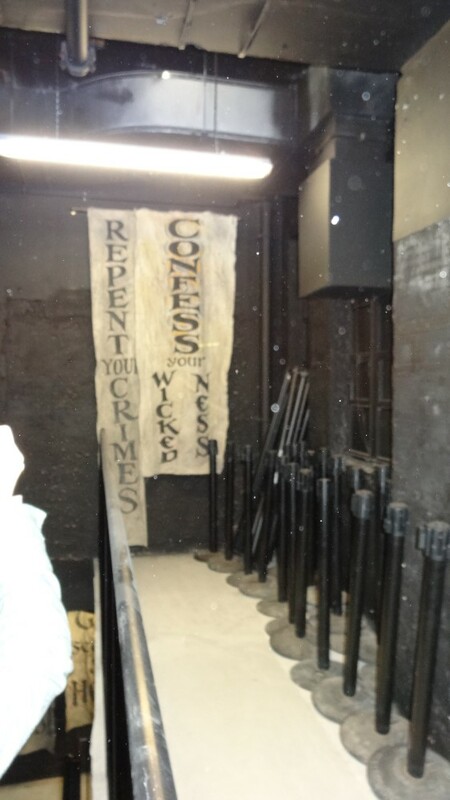 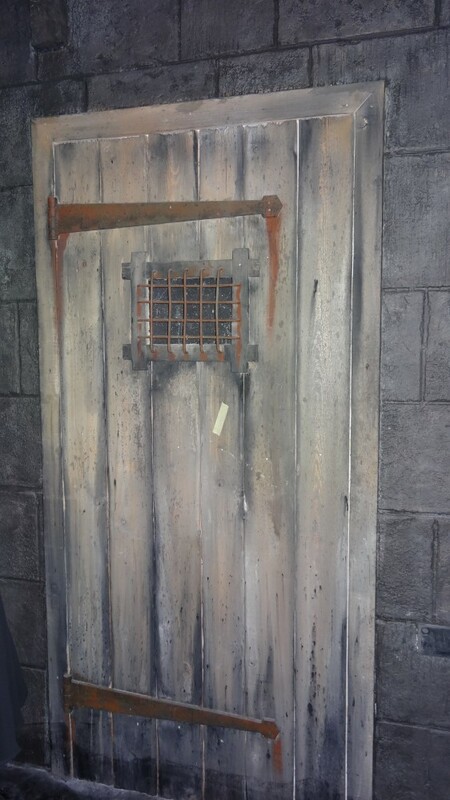 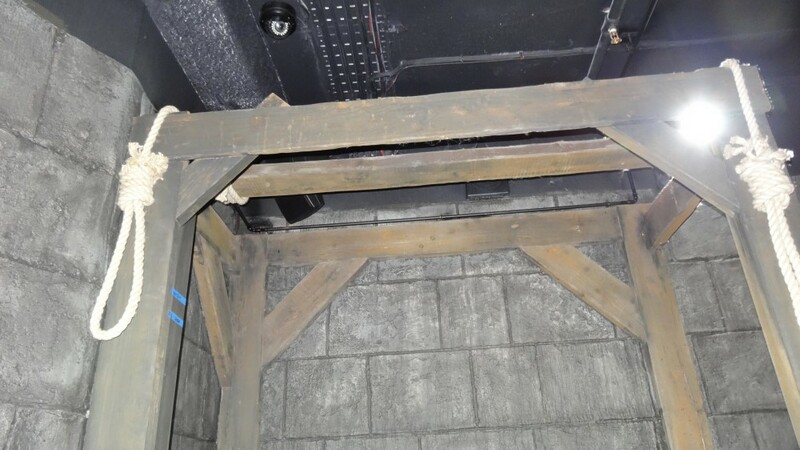 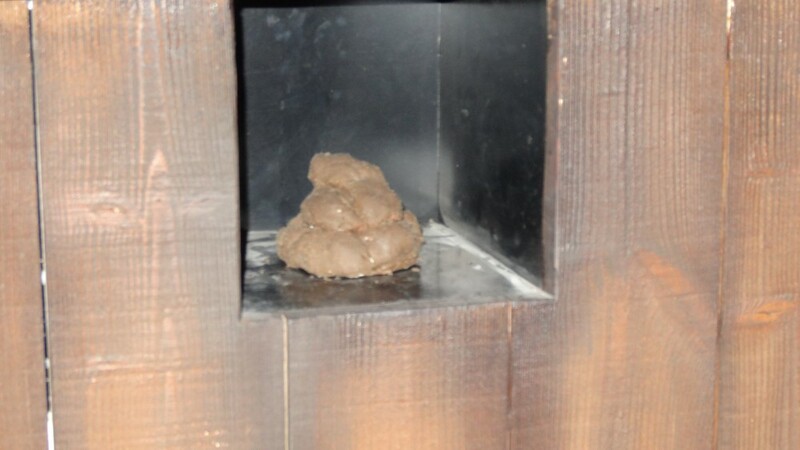 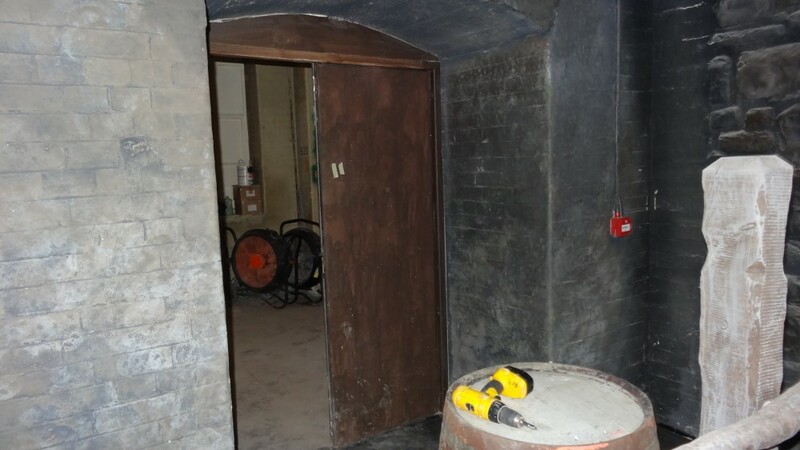 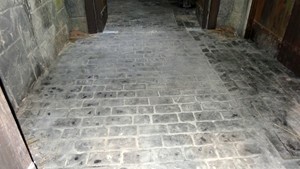 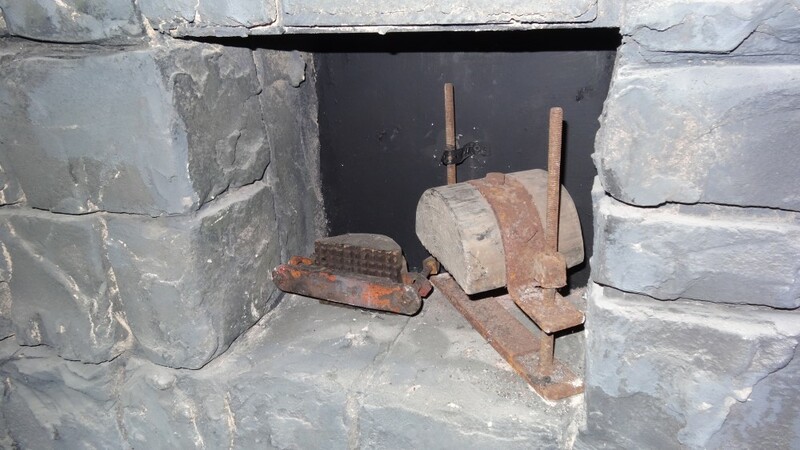 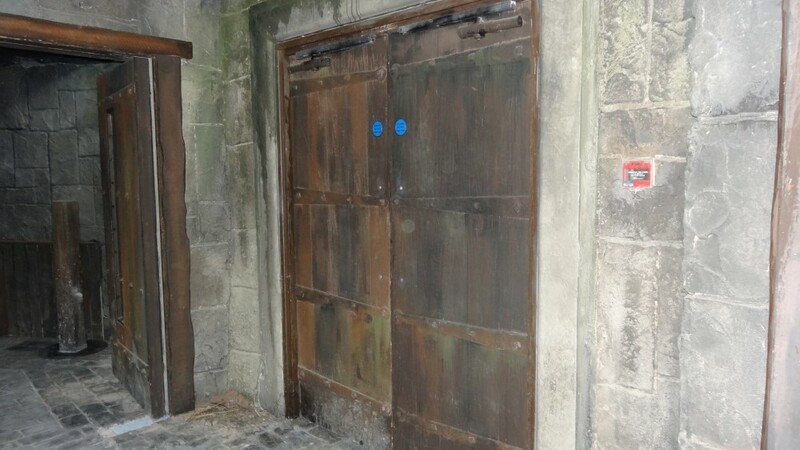 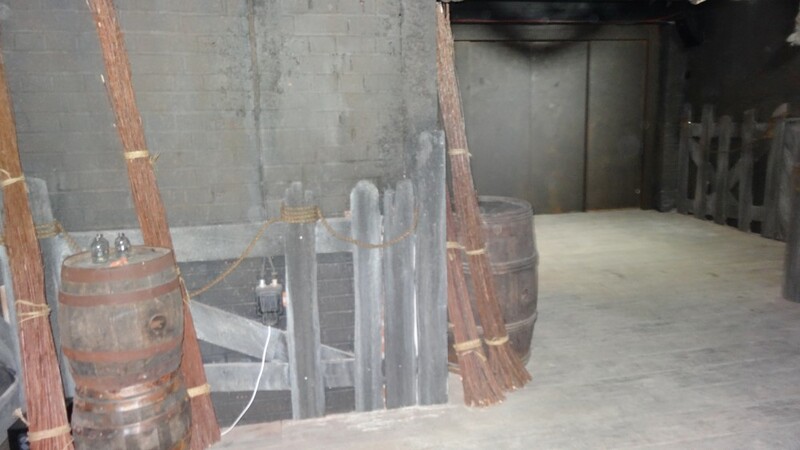 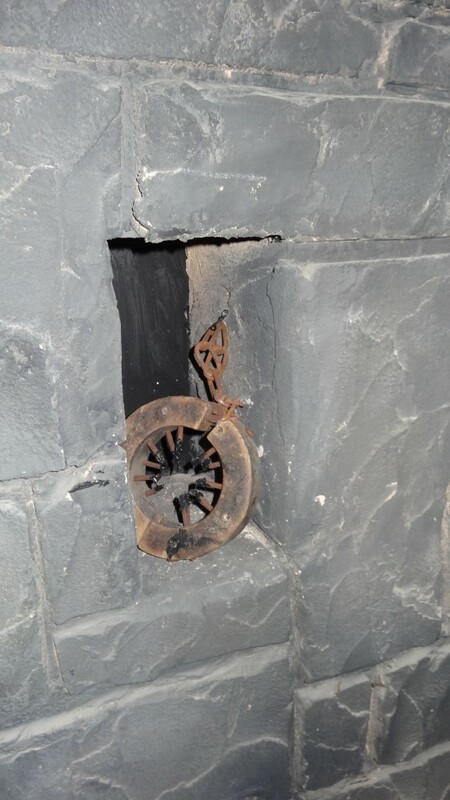 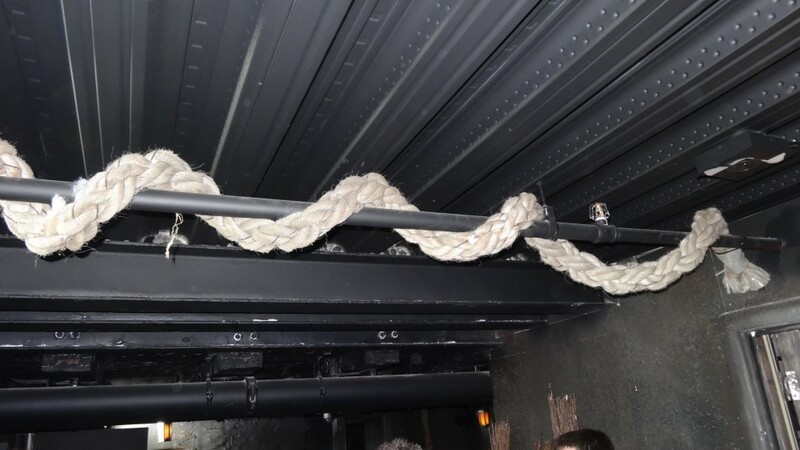 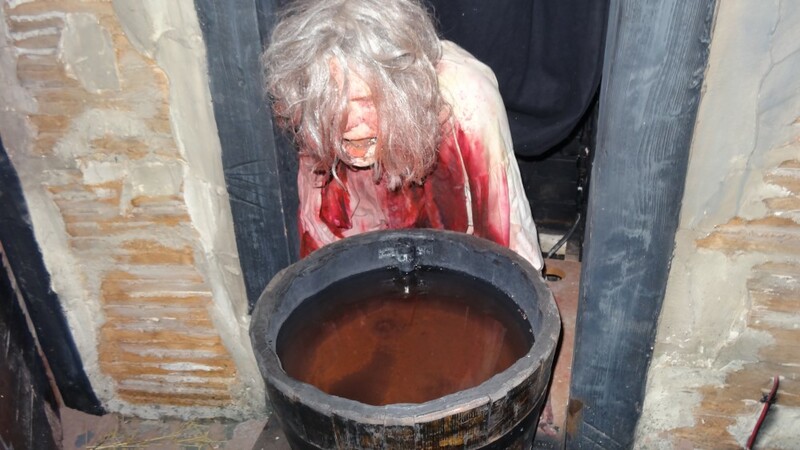 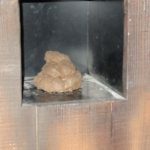 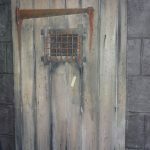 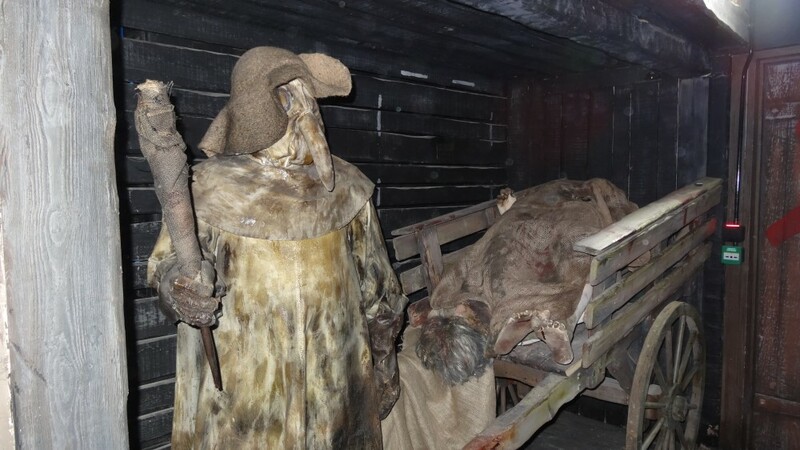 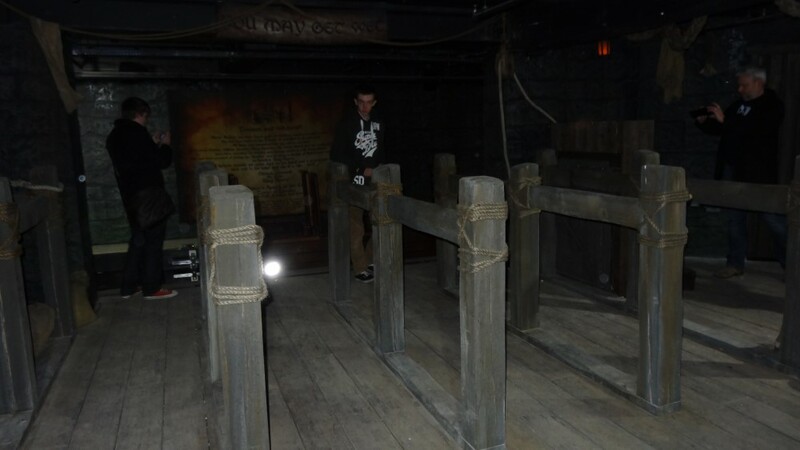 This leads you onto the new attraction in The Dungeons Guy Fawkes! 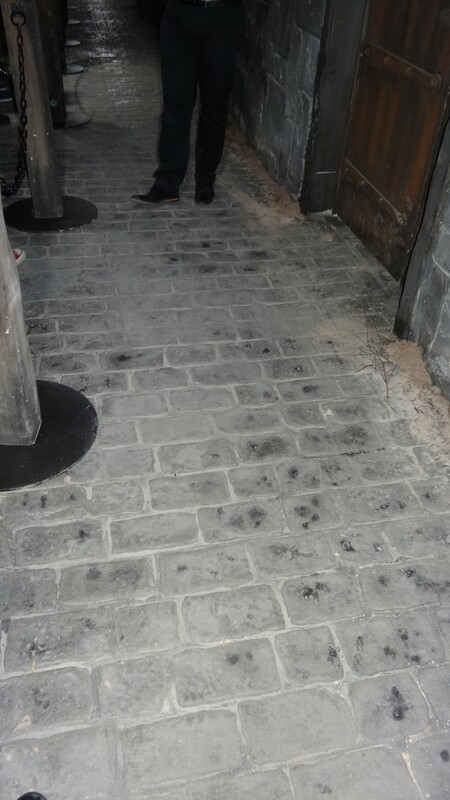 The flooring is cobbles and slightly wonky making you feel again a little disorientated. 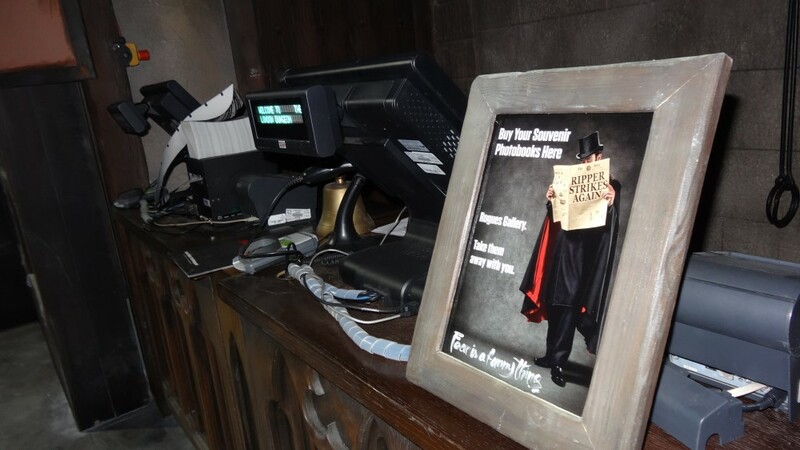 You have a projector which will project the guy Fawkes story in front of you. 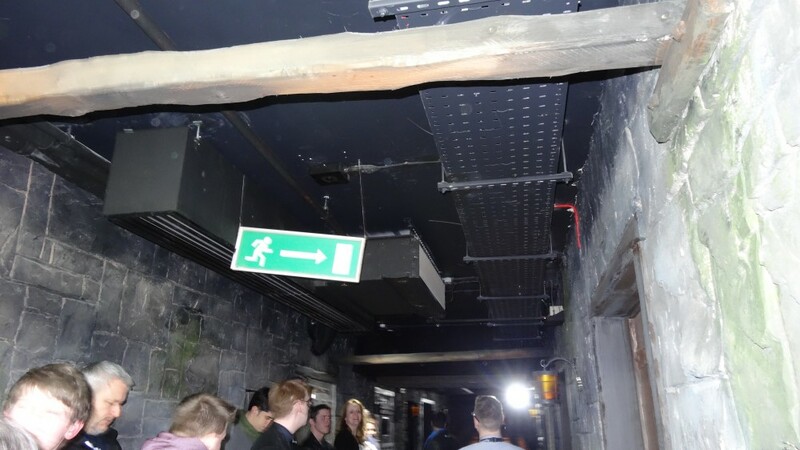 This will be accompanied with effect s such as fibre optic lights, smoke and blasts of air! 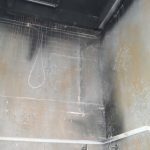 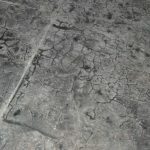 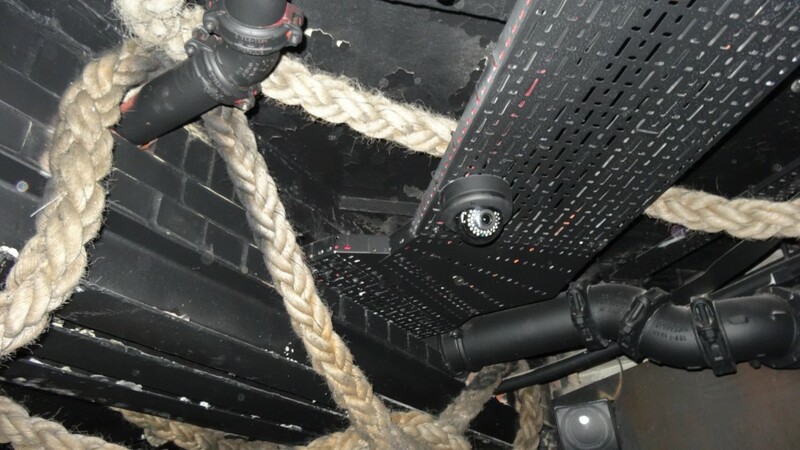 There is a fibre cable that runs along the front of the scene which will cause the effect! 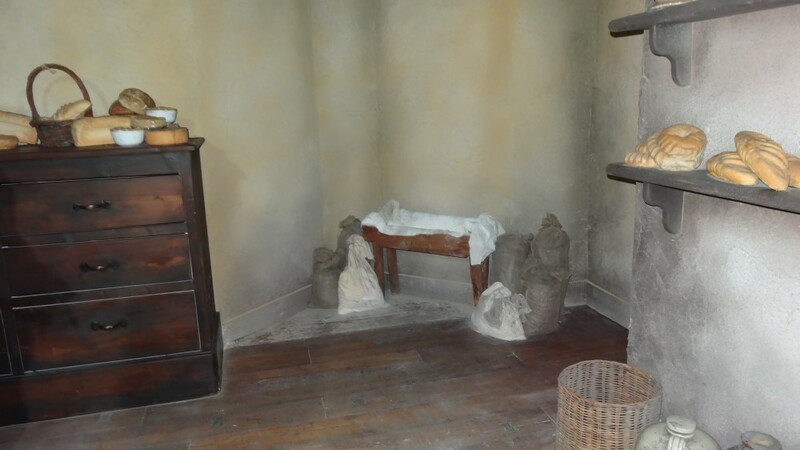 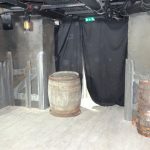 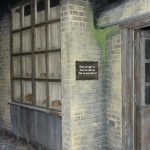 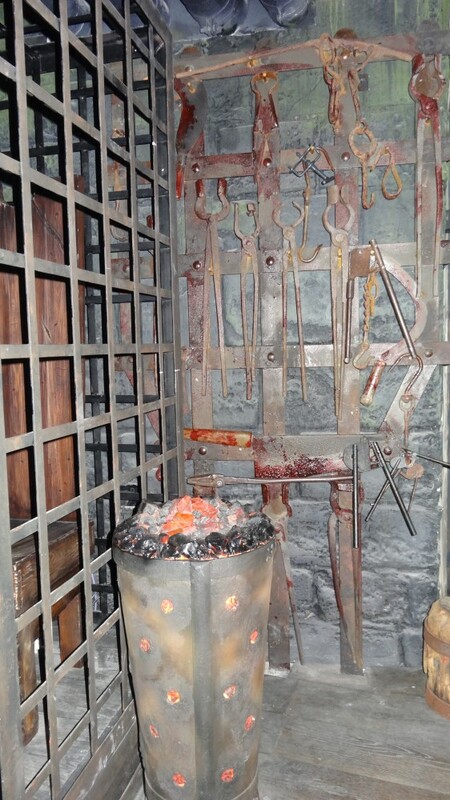 The next scene straight on from this is the torture chamber, slightly smaller than what is was a Tooley Street it contains most of the same things you would have seen before. 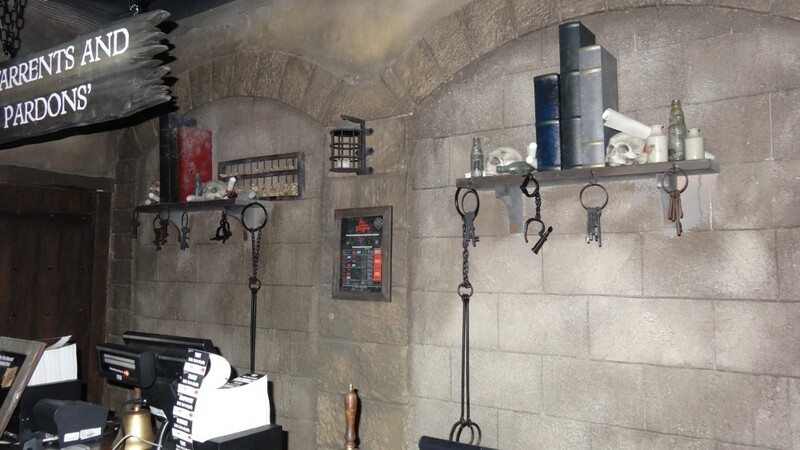 Some new torture tools have been added around the sides of the room though! 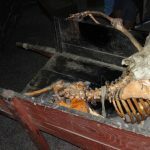 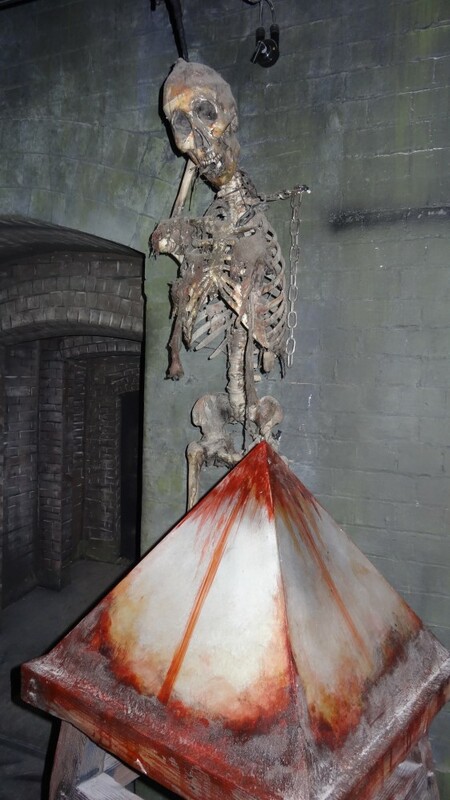 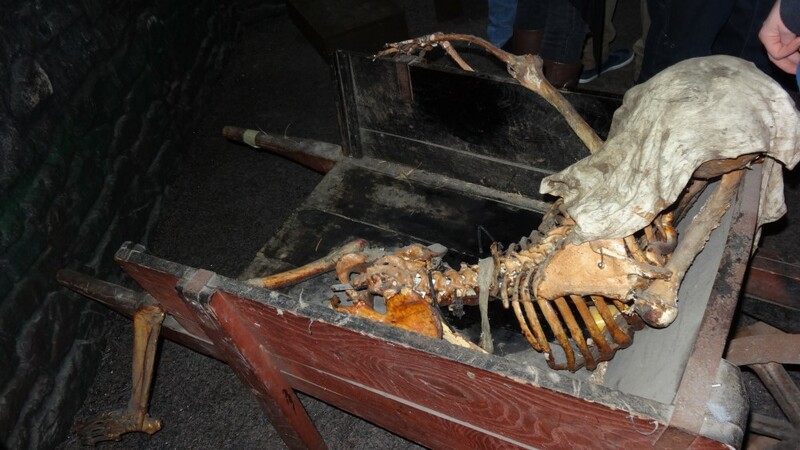 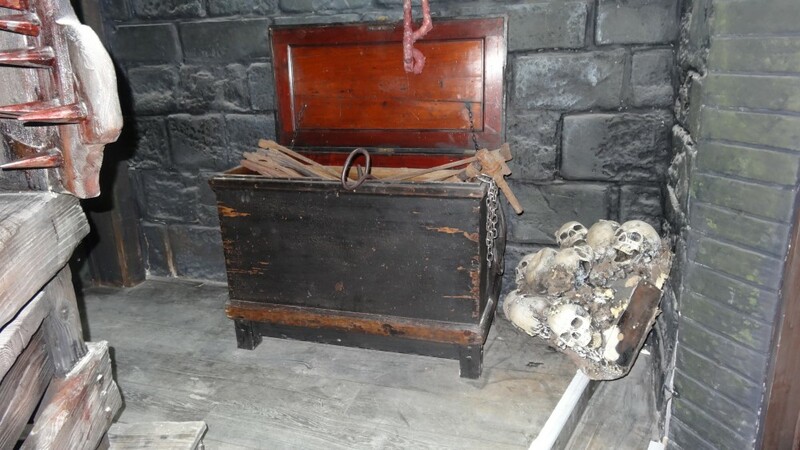 This includes a skeleton in a spike covered chair, heads hanging and numerous other parts through the room. 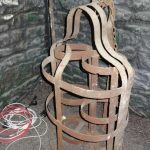 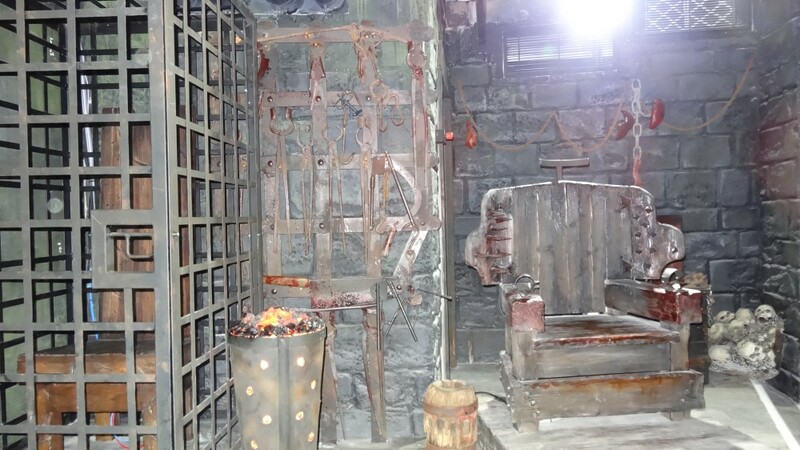 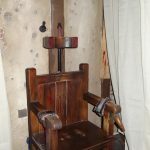 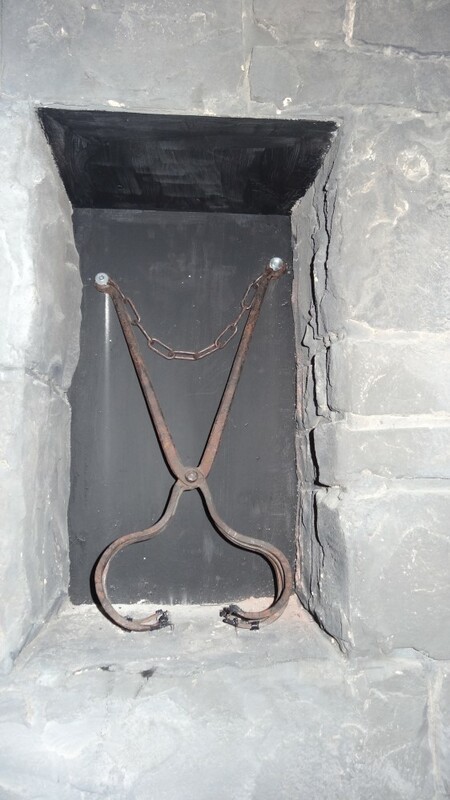 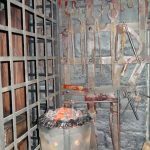 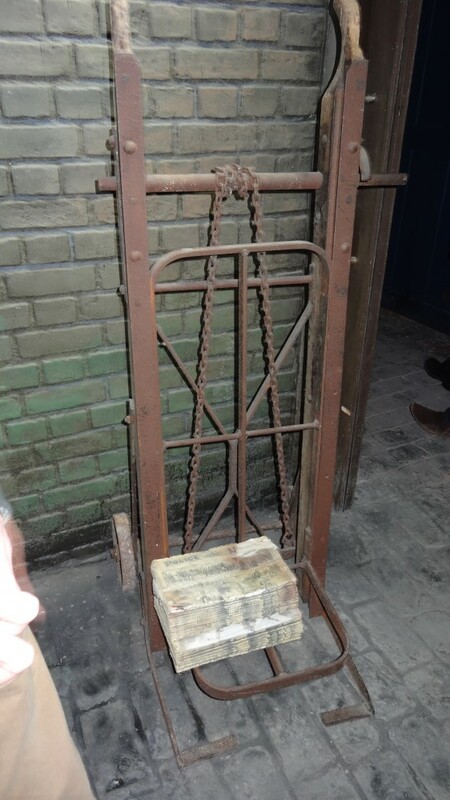 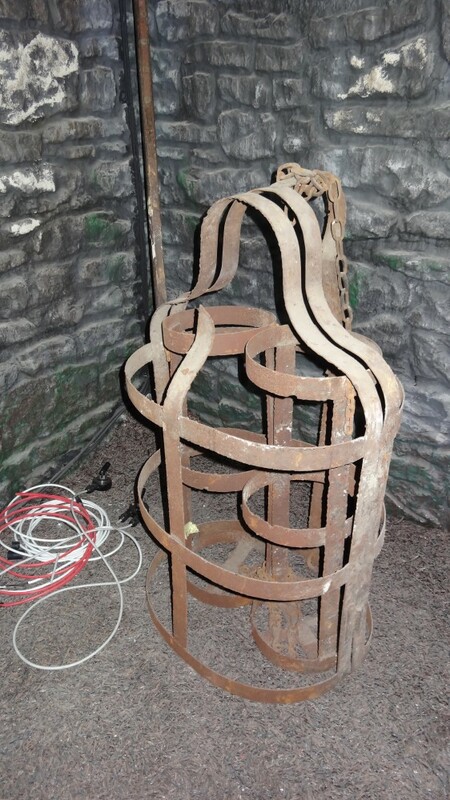 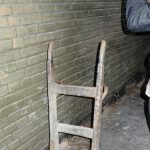 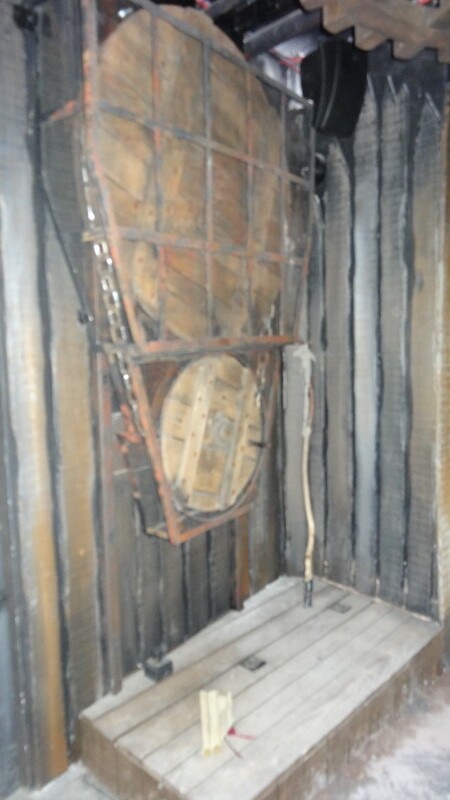 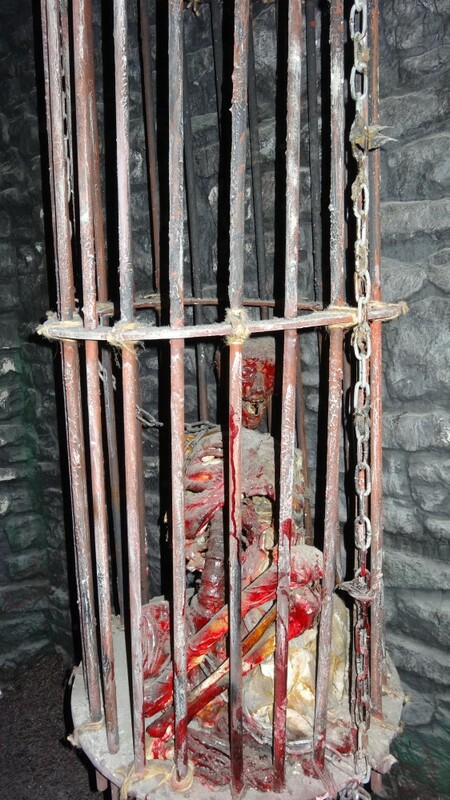 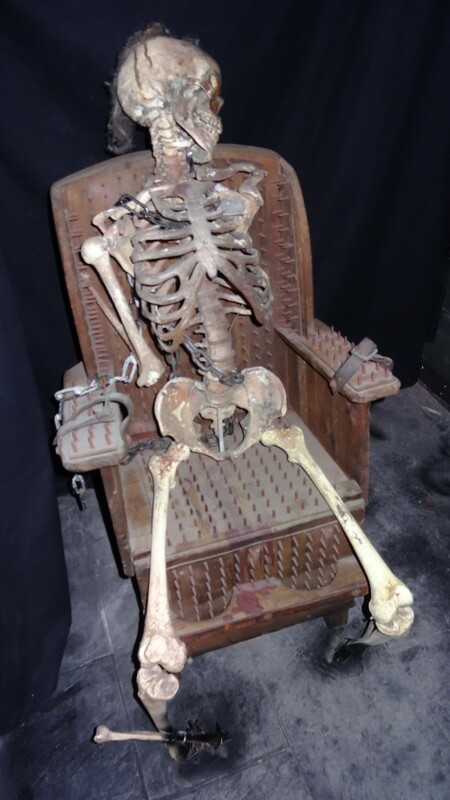 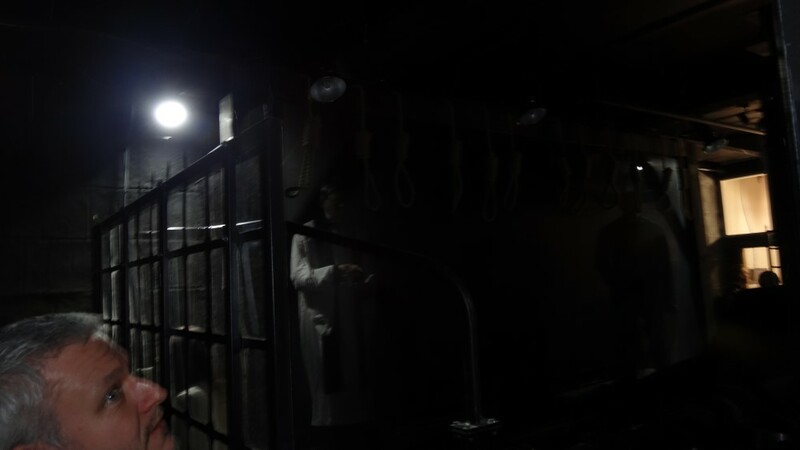 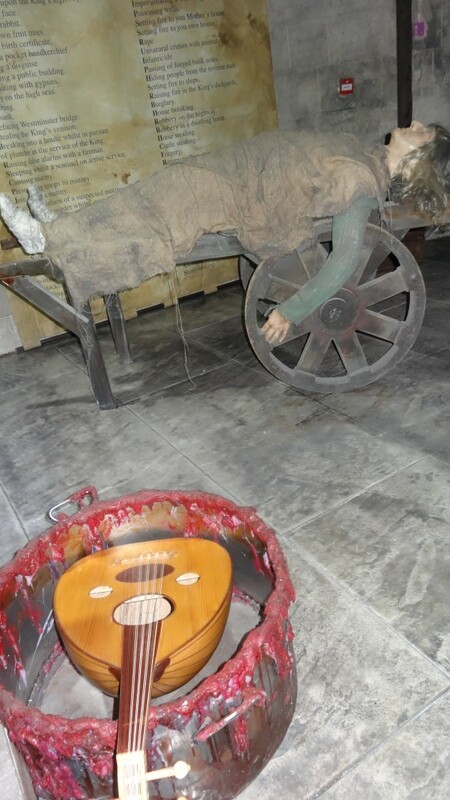 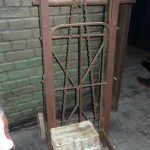 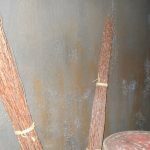 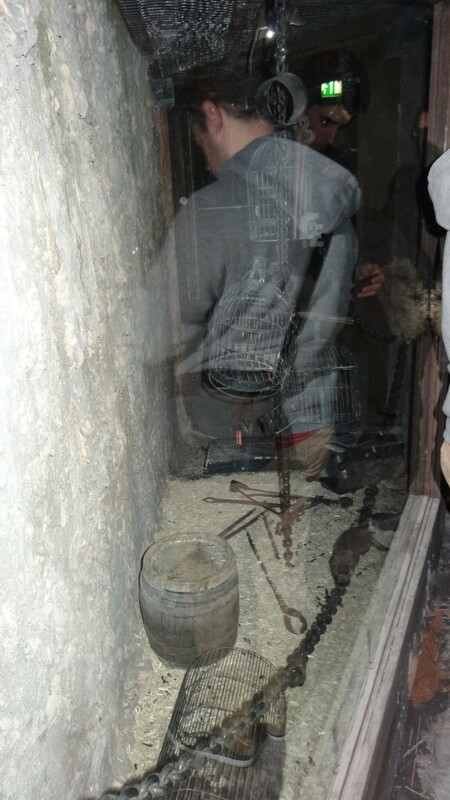 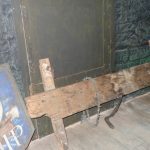 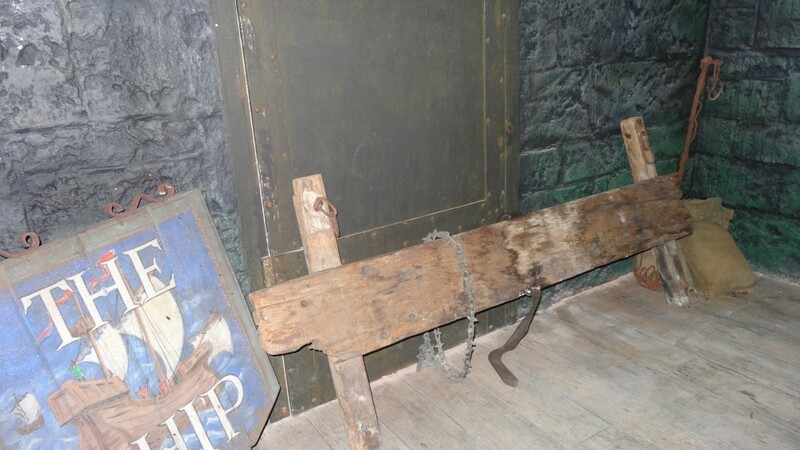 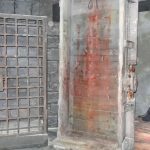 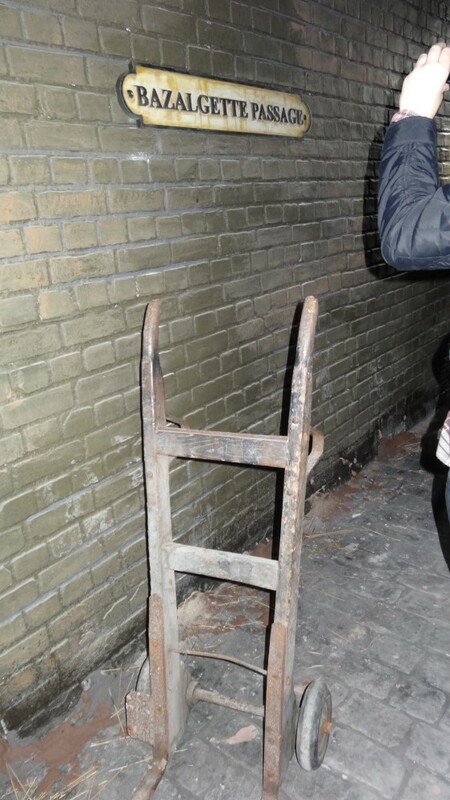 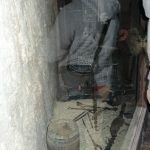 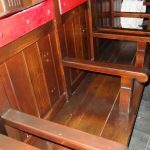 You will also notice the chair that the torturer has one lucky visitor step into and the cage in which another person can sit in. 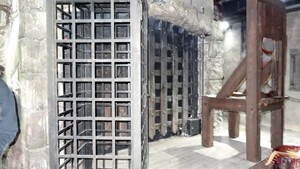 The cage looks considerably taller, looking smaller width. 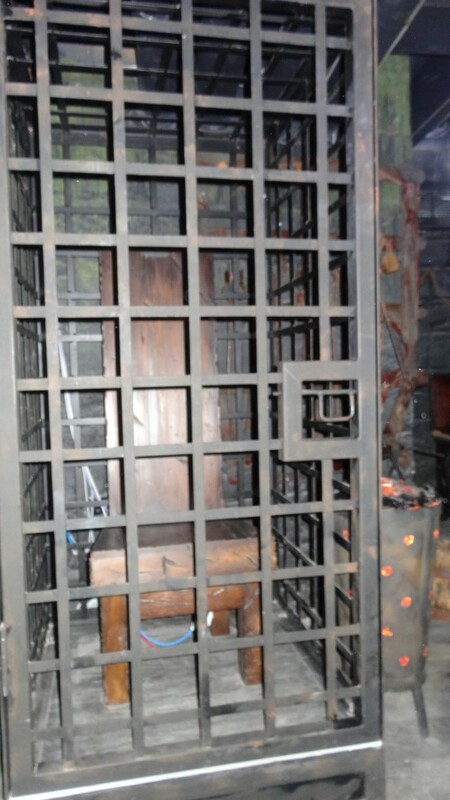 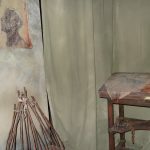 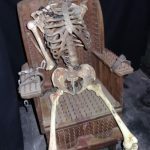 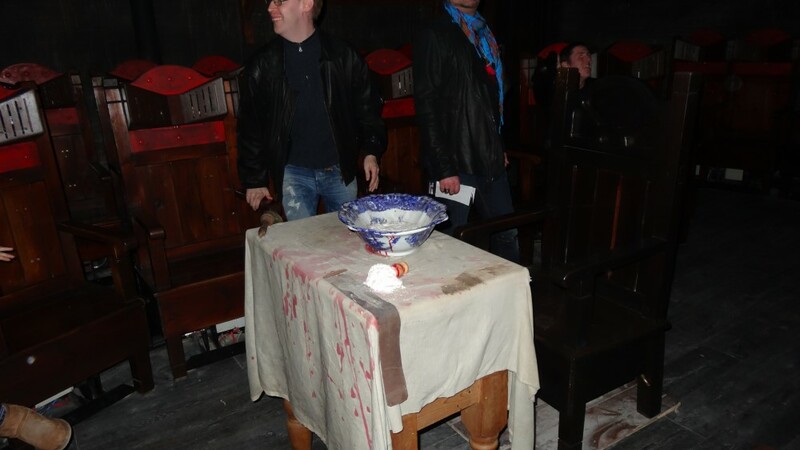 The chair next to it has the hand restraints so the person cannot escape and it is also covered with a quite a lot of blood! 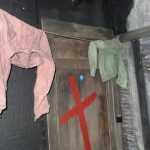 You then cross a small wooden bridge into a small village with small houses, some of the front doors have red crosses plastered across the front of them. 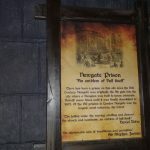 Which in the days in which it is based upon, the occupants had the plague and to stay away! 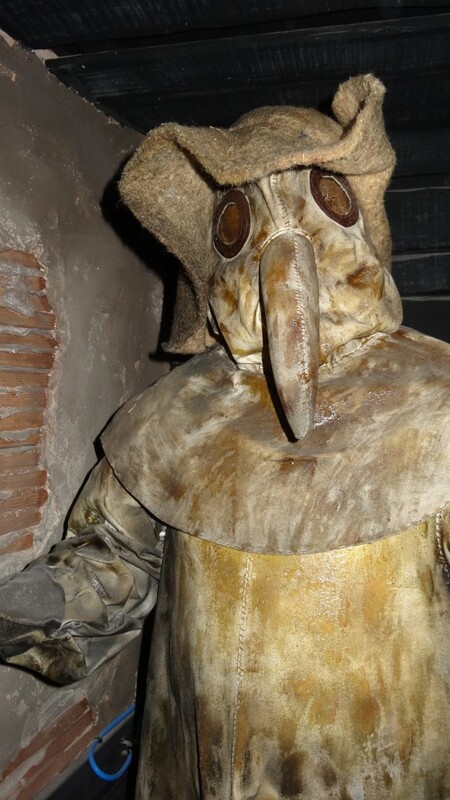 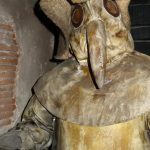 You then meet a strange looking mannequin with a mask upon his face, with two holes for the eyes and a huge beak like nose. 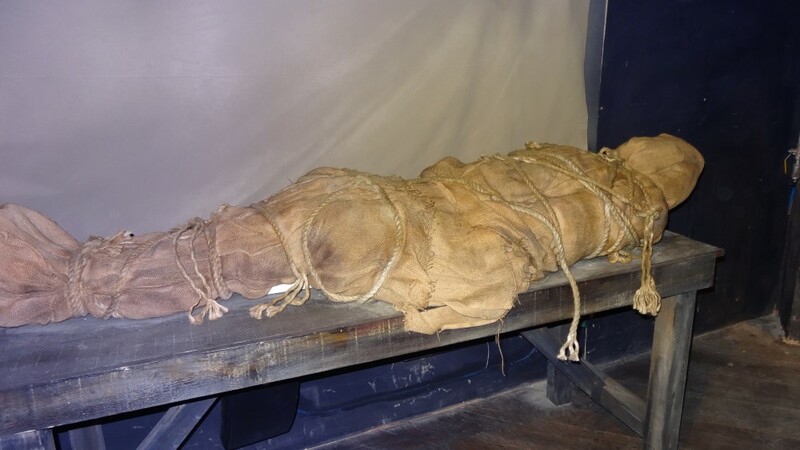 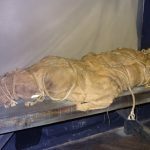 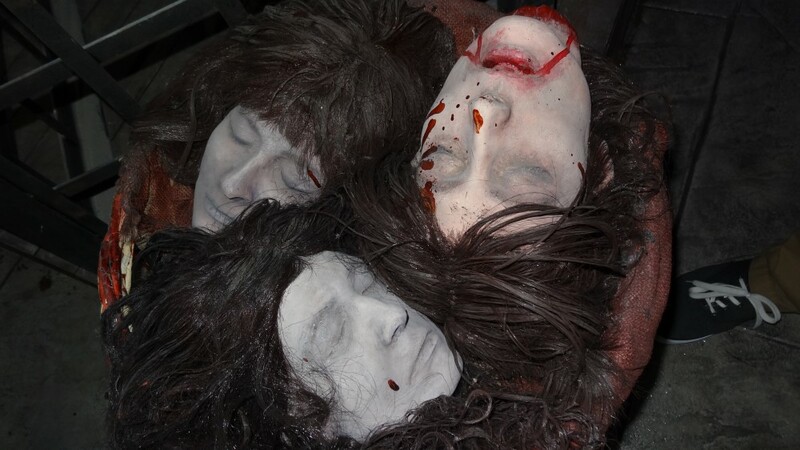 Next to him lays two corpses covered within a blanket. 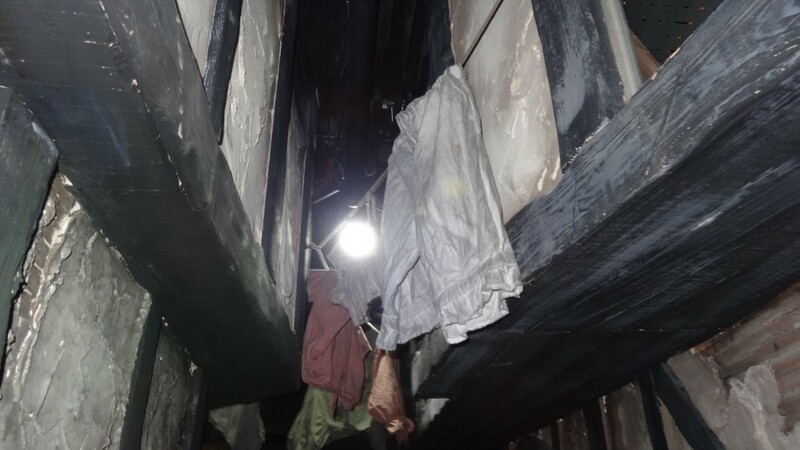 If you look above you, you will see hanging clothes on a wash line. 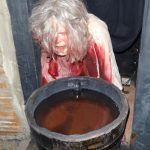 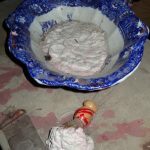 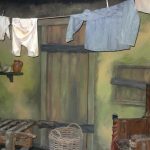 You will be occupants of this village as you walk around, including one woman who is throwing up into a bucket and also a man who looks as if he is in a lot of pain! 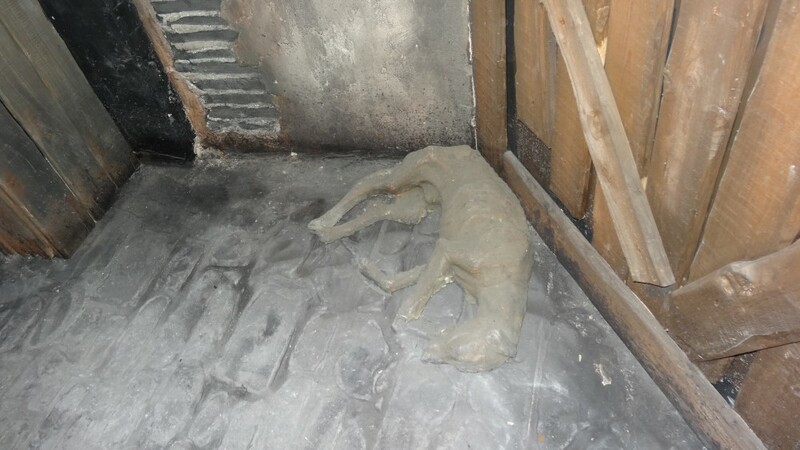 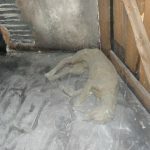 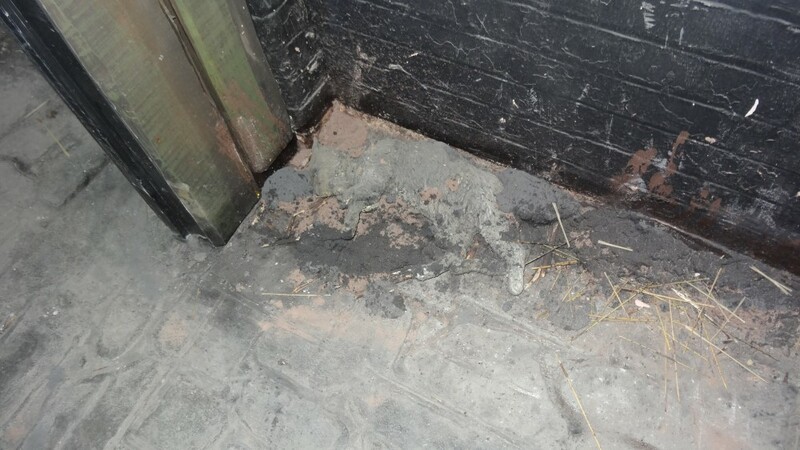 If you look closely into the corners of the hallways you will see dead animals, like cats and dogs! 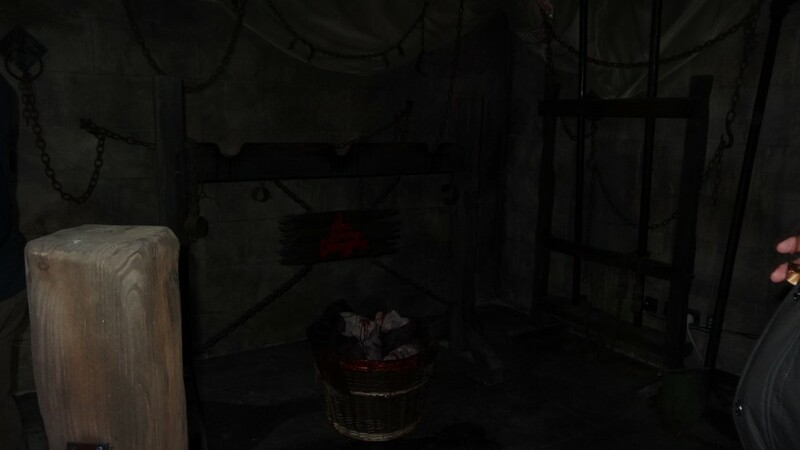 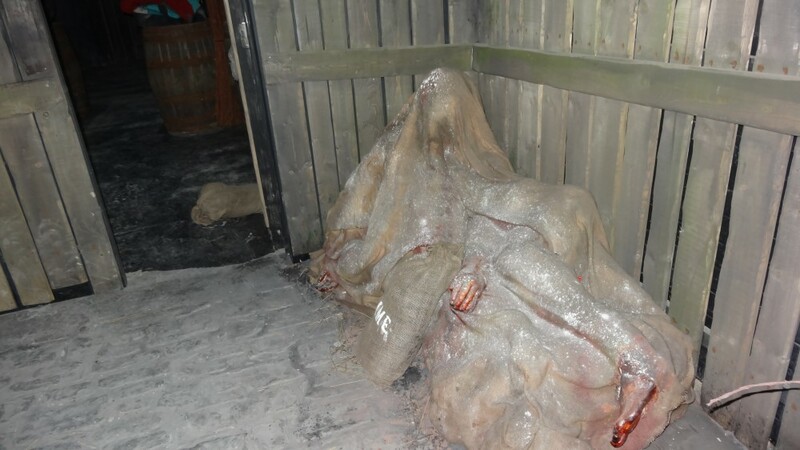 Also you can find rubble and blankets, but look again as you will bodies tangled up in these! 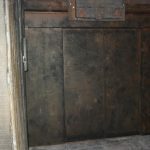 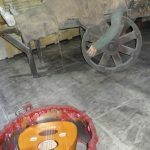 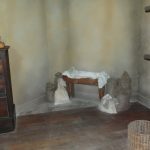 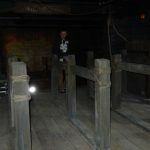 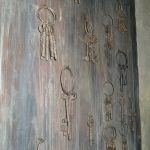 This then leads you into the coffin room, where you will see numerous coffins scattered across the floor and standing up against the walls. 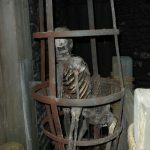 It will be your job to find out if they are dead or alive! 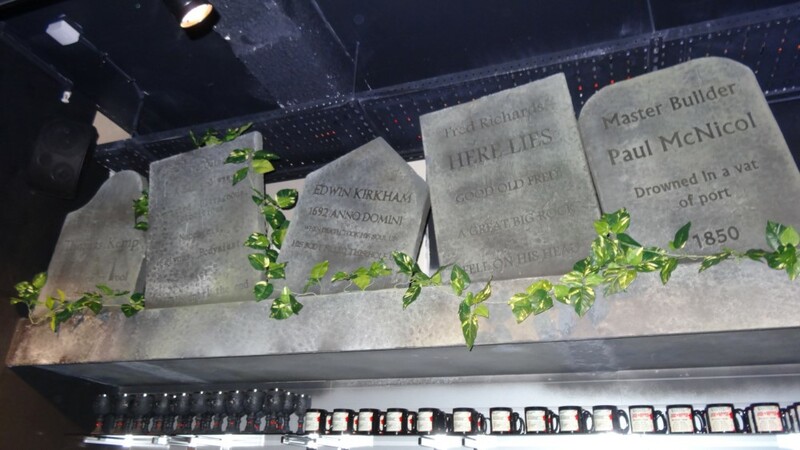 Where any of these bodies buried before their time? 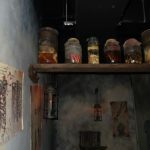 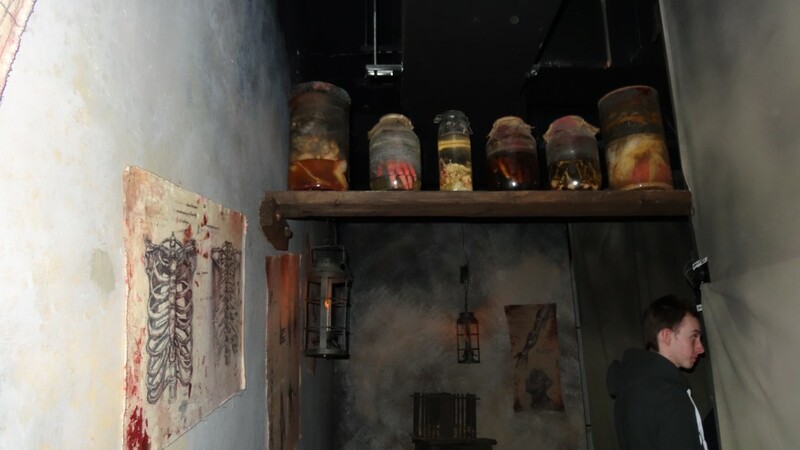 Straight through the next hallway will take you through to the Doctors room, with pictures of the human body all over the walls and above you on shelves there are jugs that contain human parts, such as hands and livers. 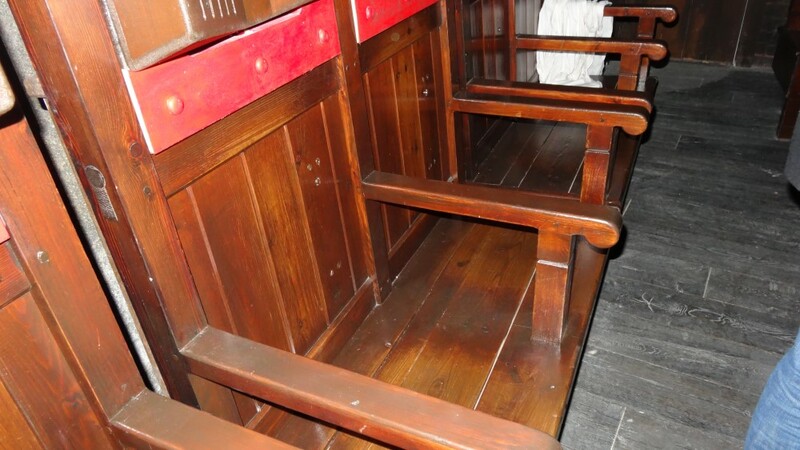 A major difference you will find in the doctors room is that there is now seats! 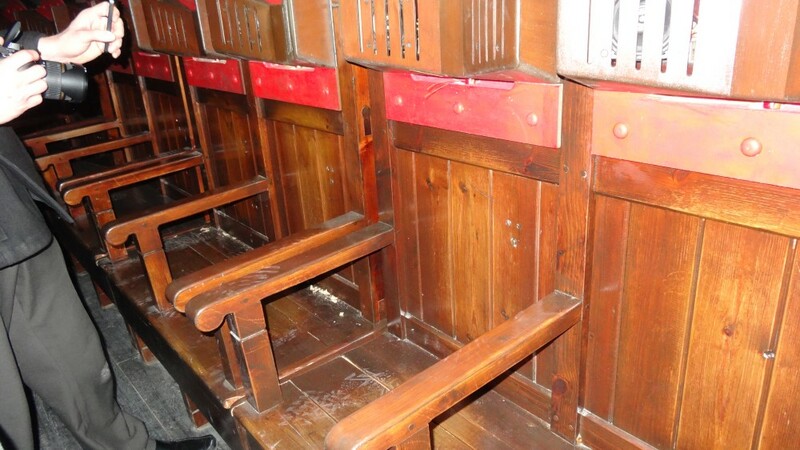 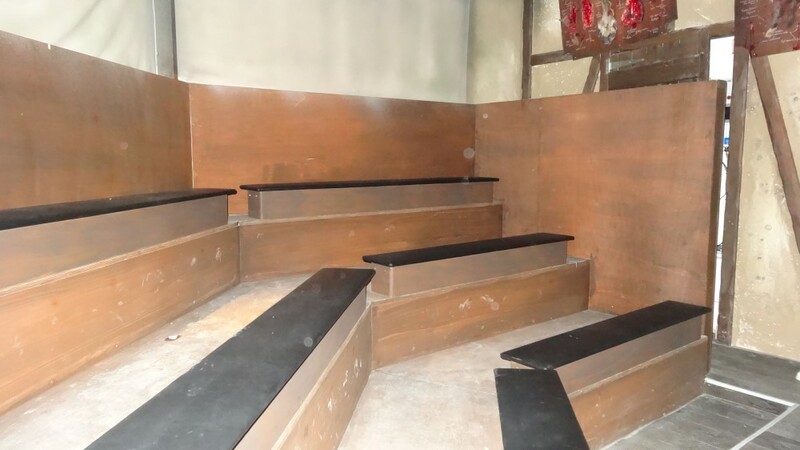 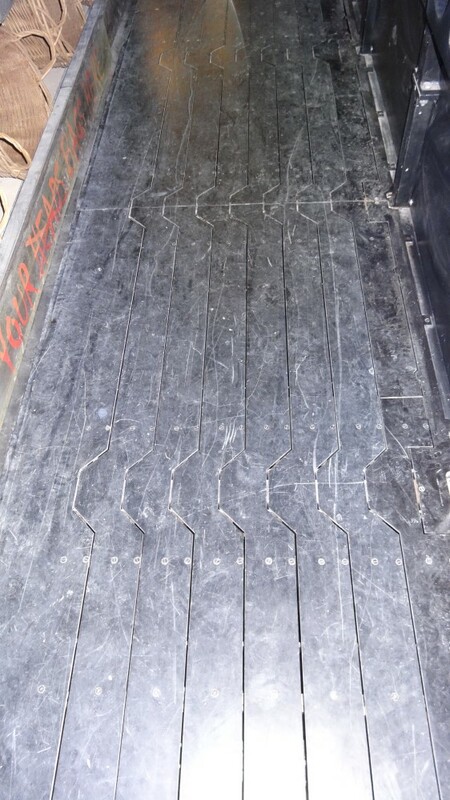 These seats will deliver you scares to go along with the story you shall be watching. 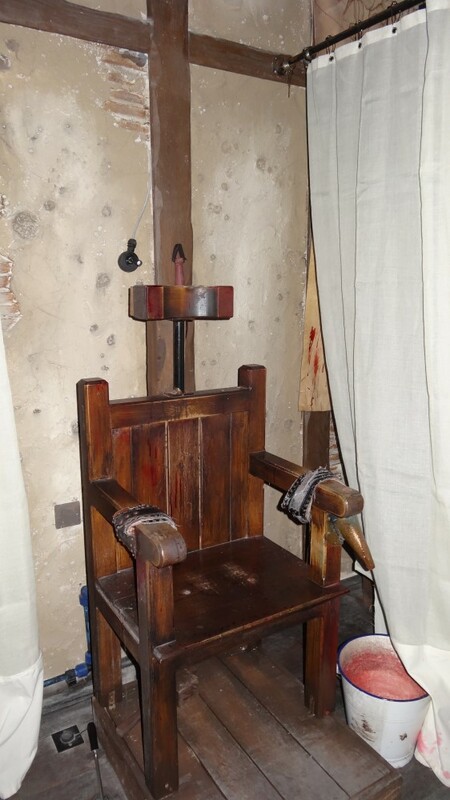 There is same chair that one lucky guest will be able to sit in and have the doctor experiment on them! 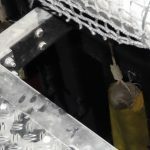 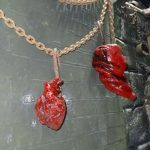 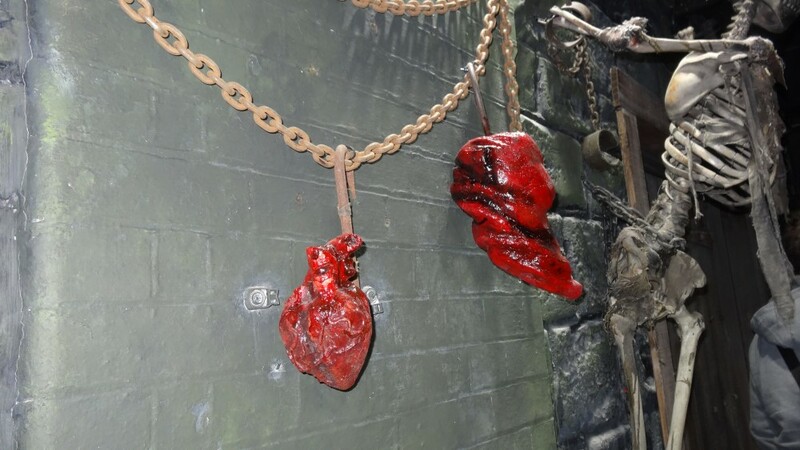 With a body on a bed next to that as well, this body has the whole chest open so you can see his heart, liver and intestines all hanging out of him. 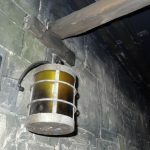 There are small lanterns hanging from the ceiling in this room which will be your only source of light. 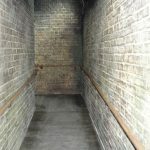 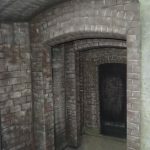 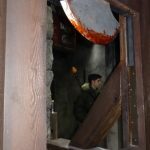 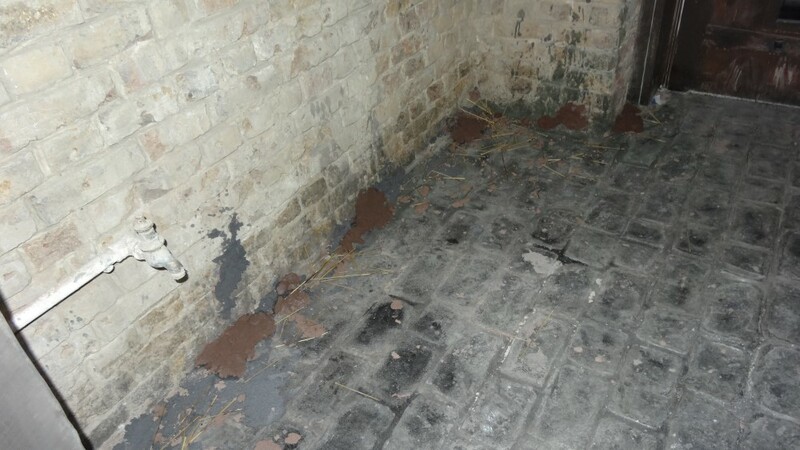 Through another small bricked wall hallway with wooden floor you meet a tunnel, this tunnel has rats running over the top of it. 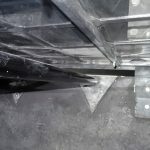 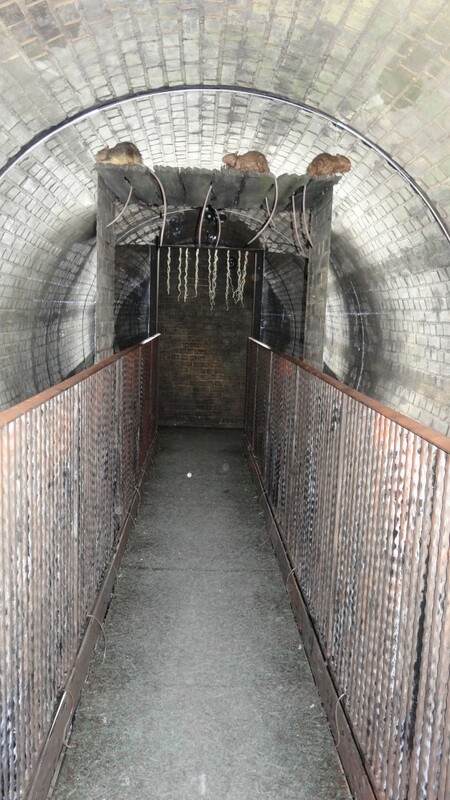 This tunnel will also spin so as you walk through you will get a dizzy feeling which should predominately make you walk at an angle as if you are going to fall. 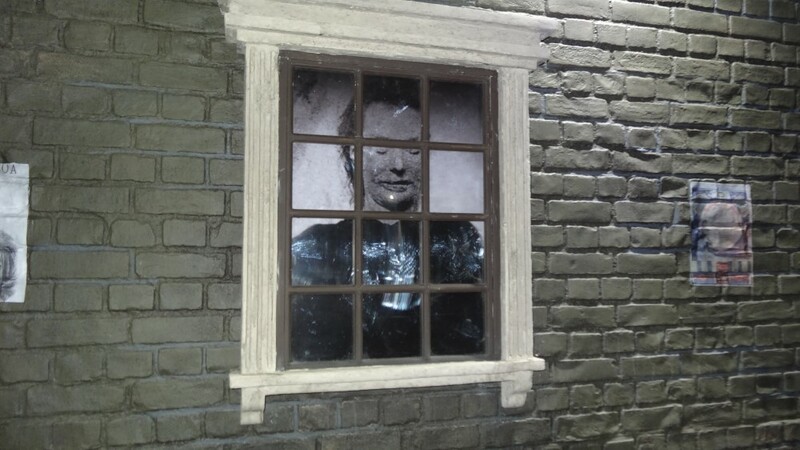 There are also wind effect to put you off even more! 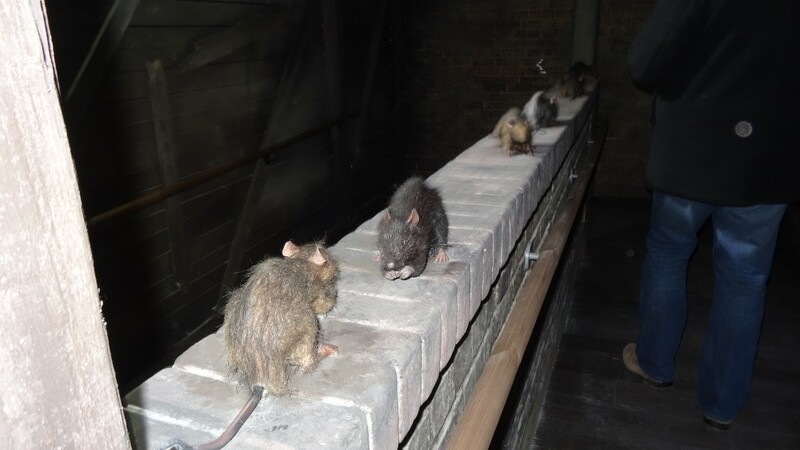 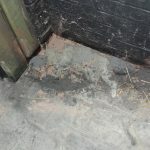 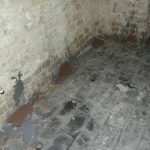 Going through some more bricked hallways you will meet some rats by your feet, so watch your step! 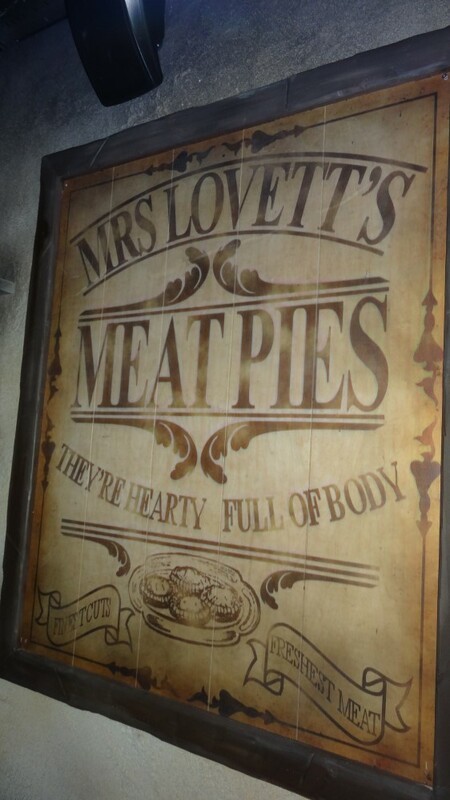 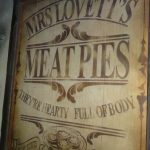 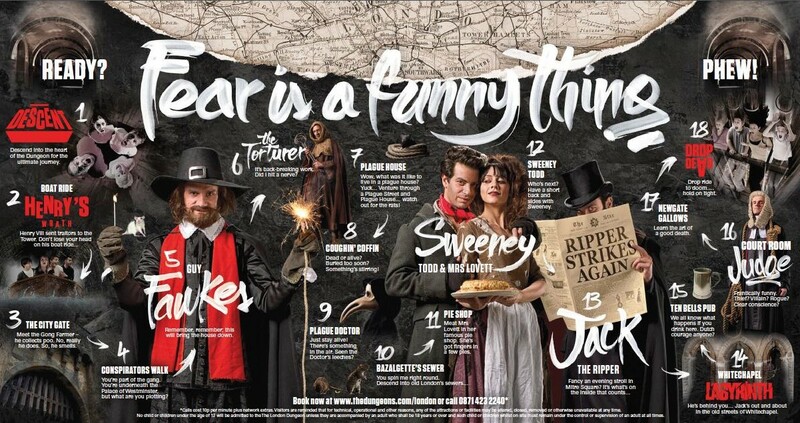 This will take you to Mrs Lovett’s pie shop! 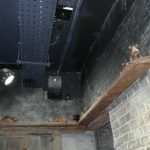 When you came to this in Tooley Street some people didn’t have the chance to hear what she was saying as they were last getting of the boats. 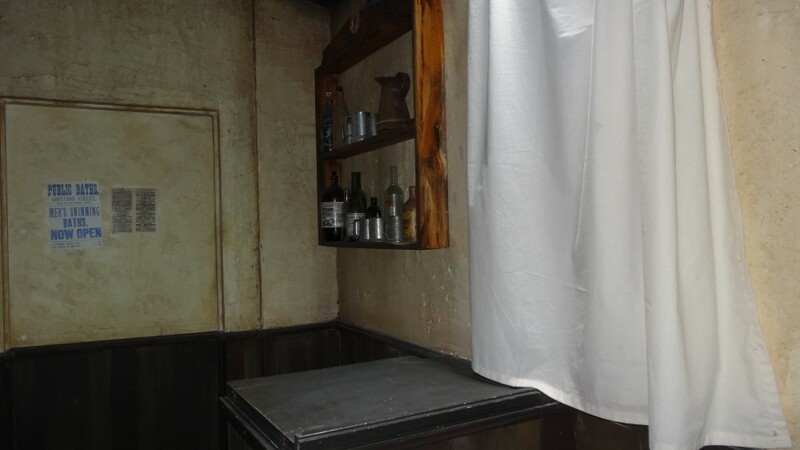 This time she has our own space and we and we can see exactly what she does in her shop! 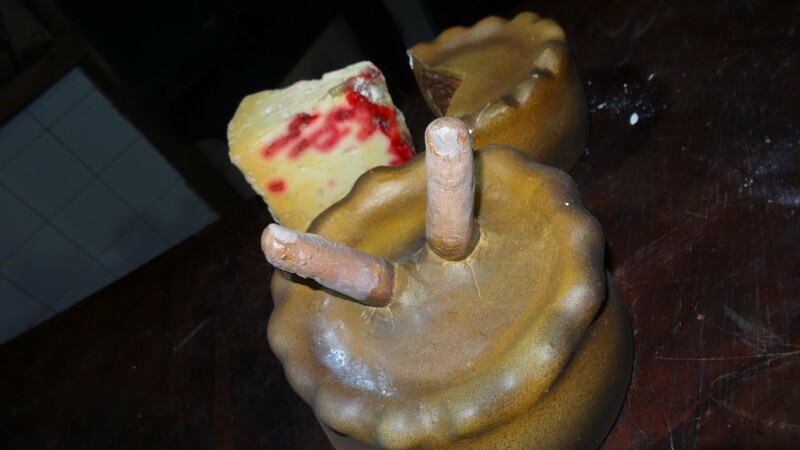 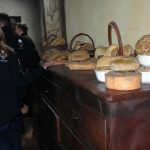 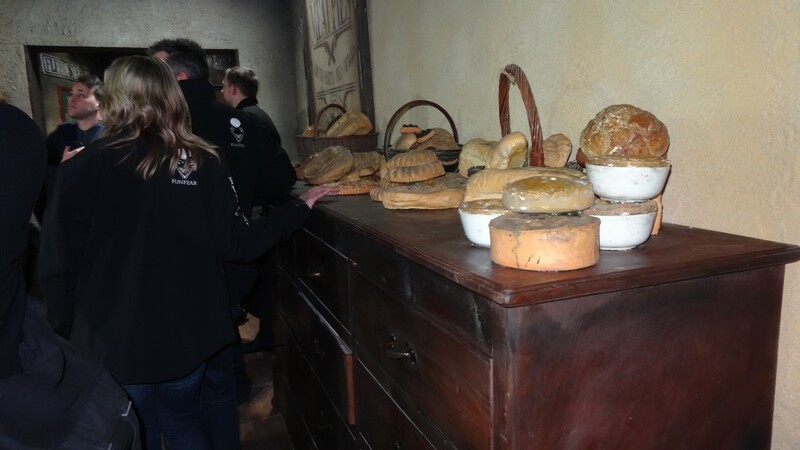 Around you will see a unit covered in bread used for cooking, also a stand with pies on it. 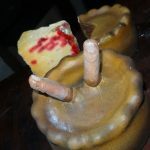 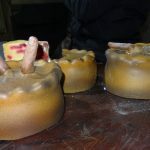 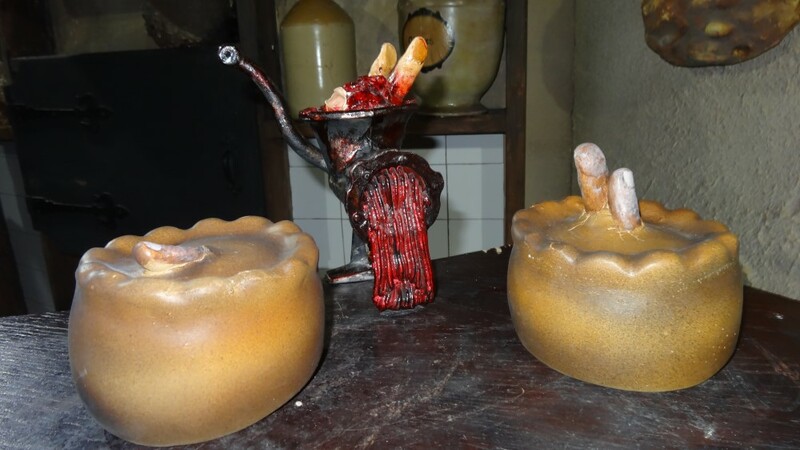 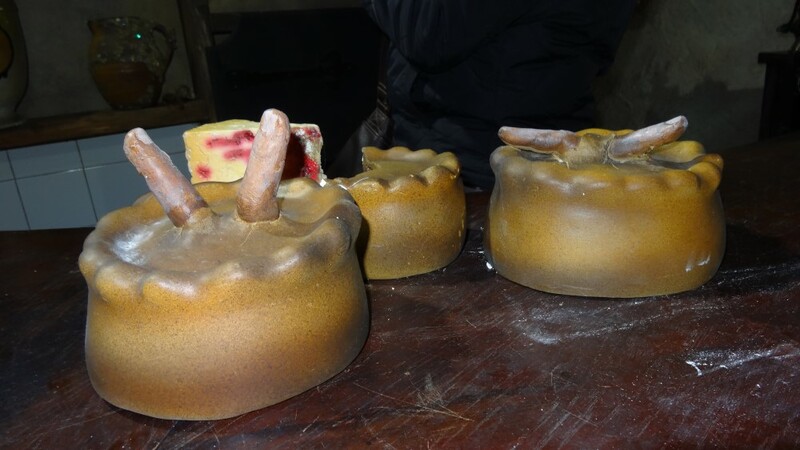 No ordinary pies those as they have fingers coming out from the top! 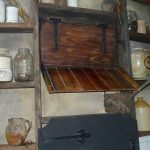 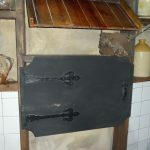 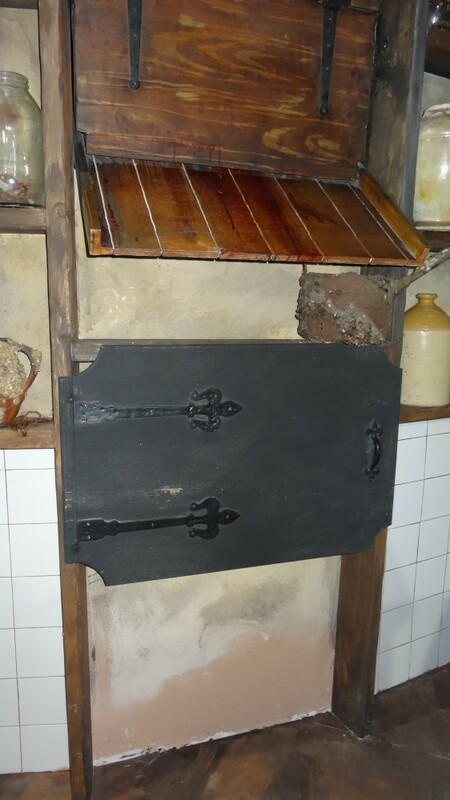 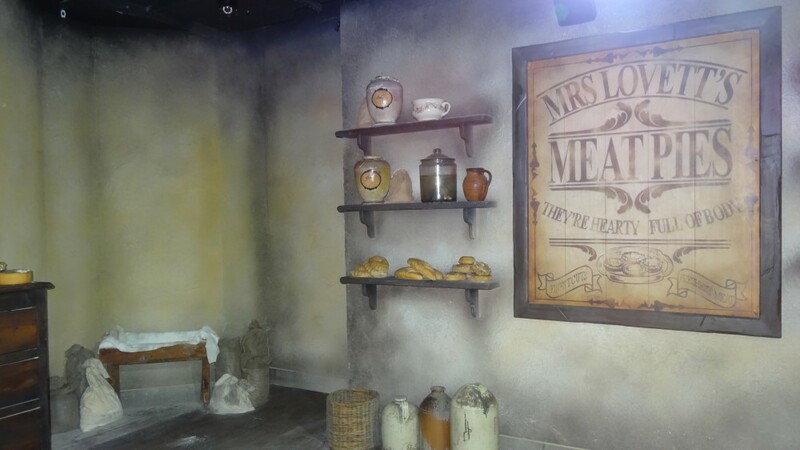 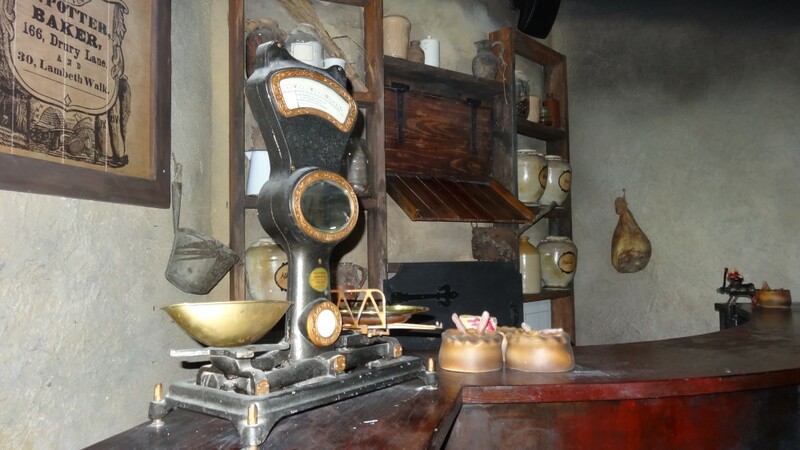 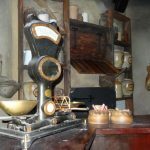 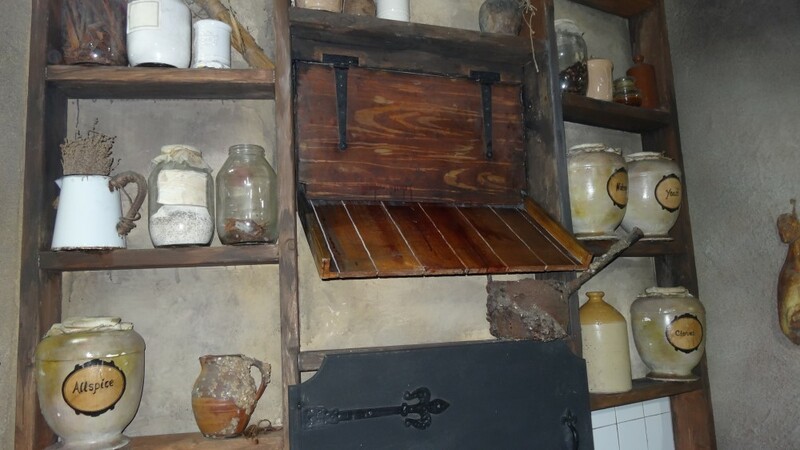 Behind the stand that Mrs Lovett will be talking to you from there are shelves with lots of different cooking equipment. 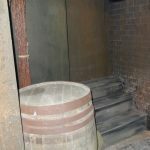 Look just below that though and there is a trap door where Sweeney Todd will be appearing from and some point. 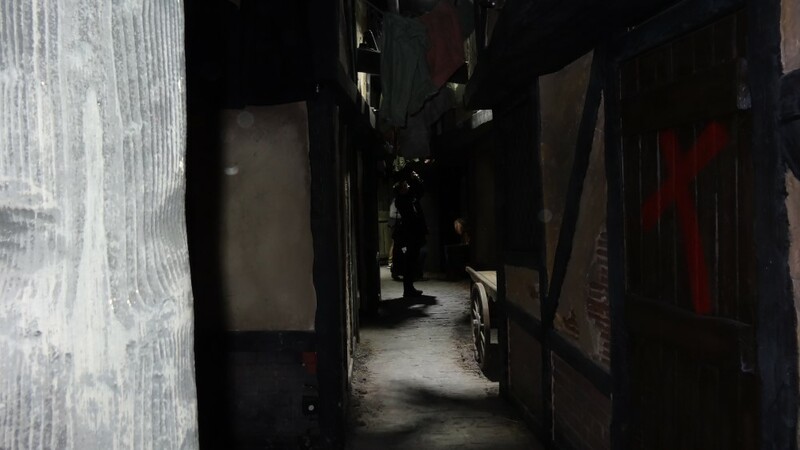 You will see him twice in this scene so keep a lookout! 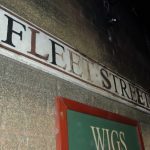 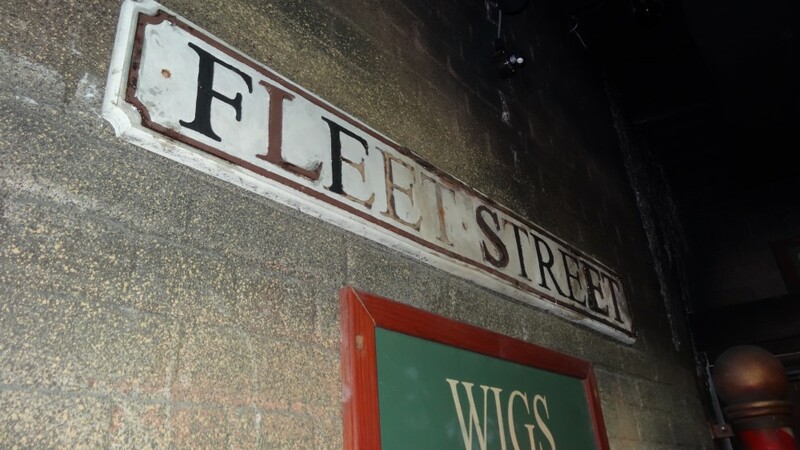 Along to Sweeney Todd’s barber shop! 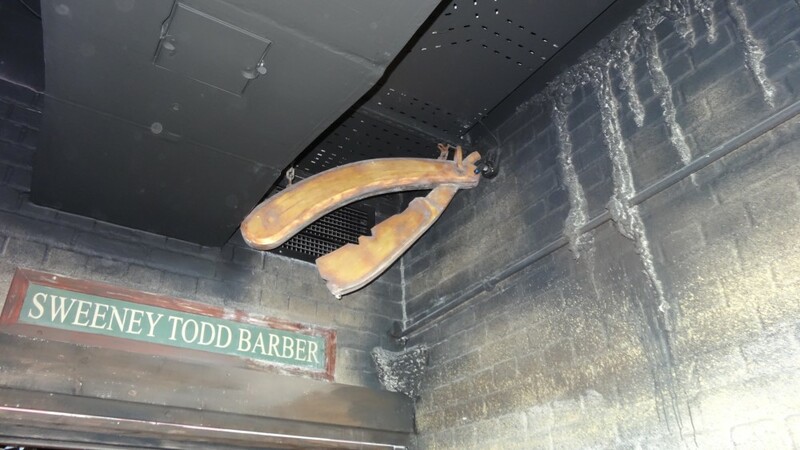 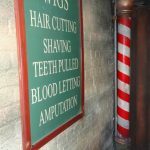 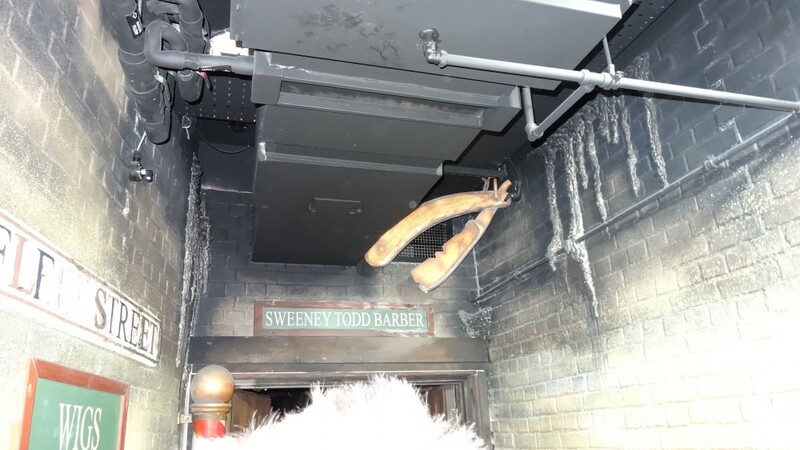 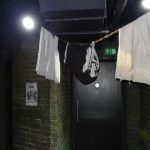 Just as you enter you will see an iconic barber shop pole, some cut throat razors hanging from the ceiling and also a sign explaining to you what Sweeney Todd does in his barbers! 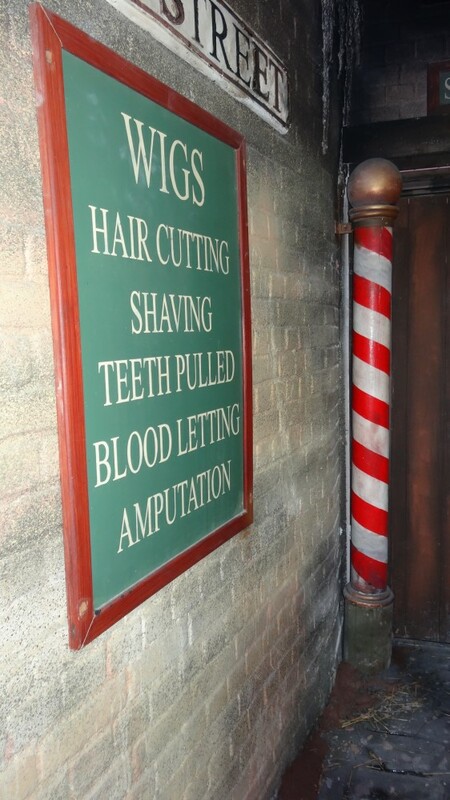 Then take a seat as he gives you a hair cut! 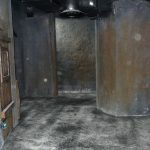 A new feature in this part is that there will now be an actor roaming about in here! 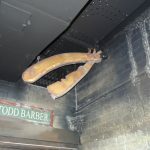 It is said to be one of Sweeney Todd’s children..! 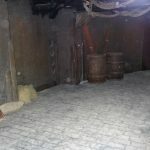 Surviving Sweeney Todd you will lead yourself through another hallway, around you, you will see stacks of newspapers in the cobbled floor. 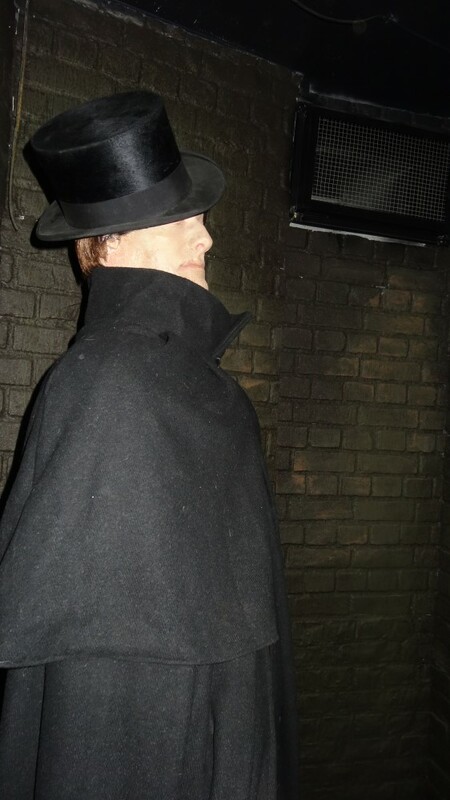 This takes you to a murder scene, Jack the ripper has struck again. 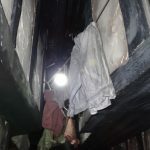 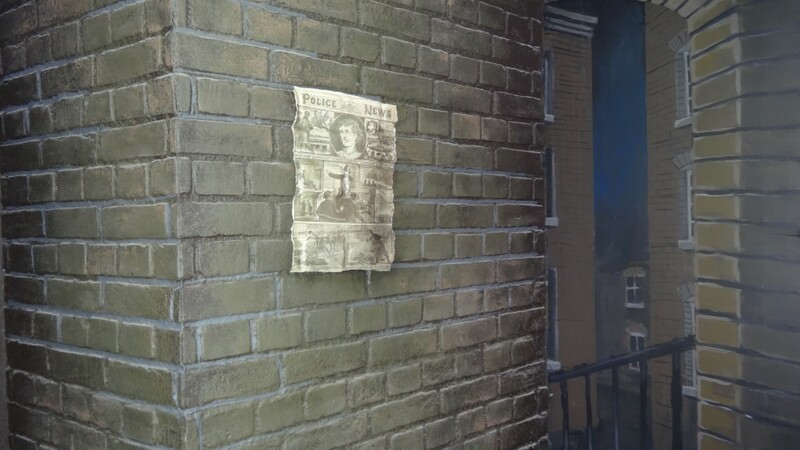 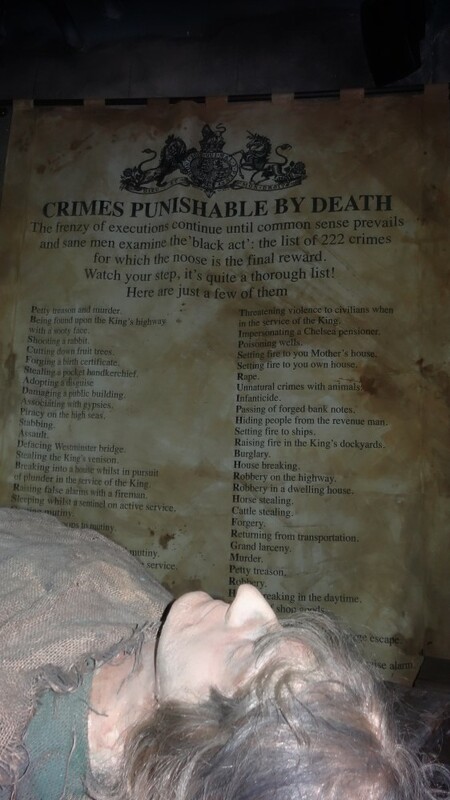 Posters of killings around the room and a body of a woman surrounded by a fence on the floor. 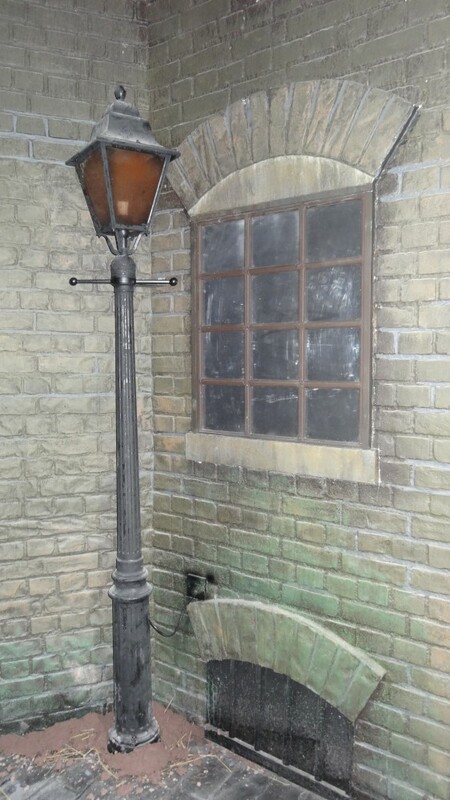 Your only lighting in this room is just the small lampposts in the corners. 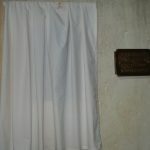 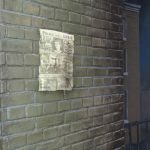 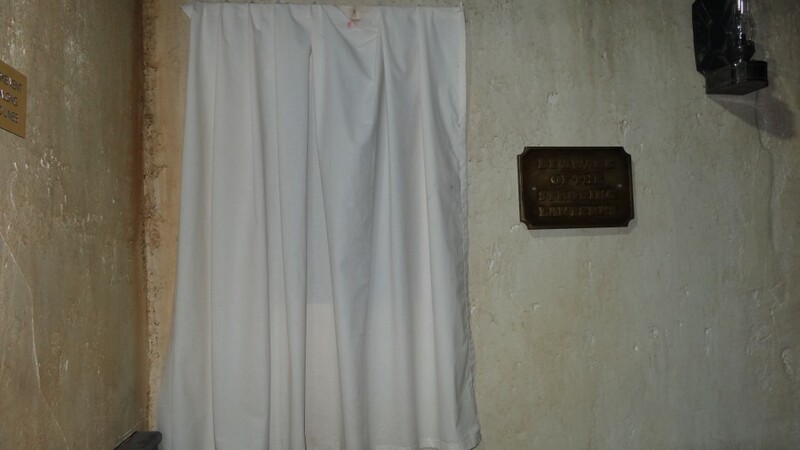 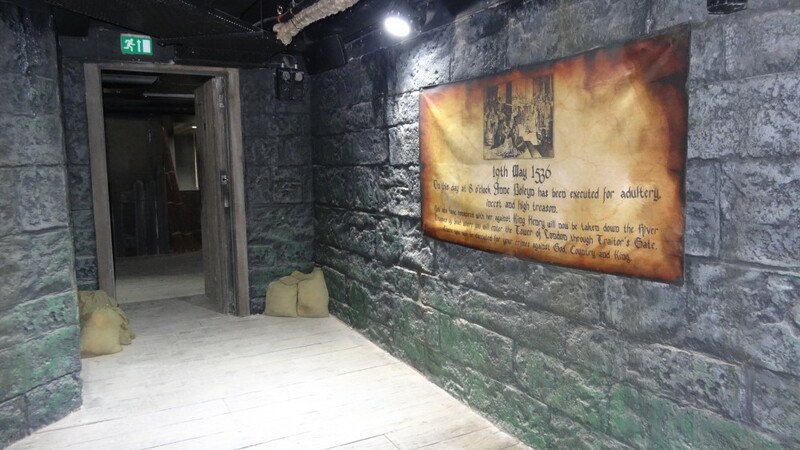 The documented pictures of the victims of Jack the ripper are also placed around the room. 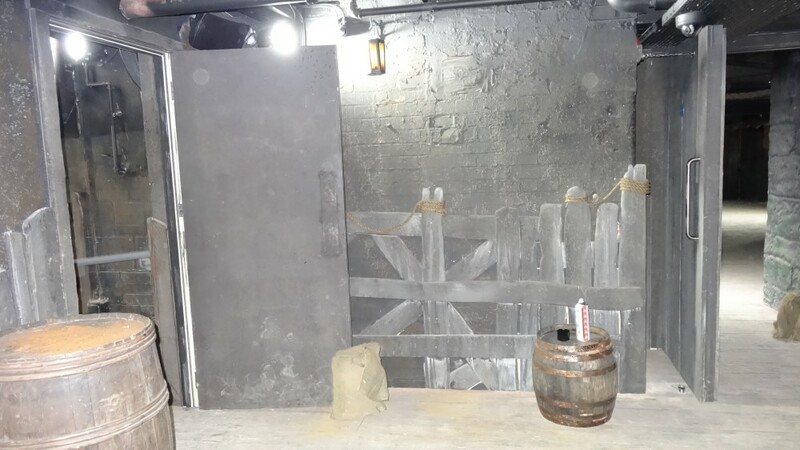 You’ll meet a man in the corner of this scene, covered in a long black cloak and a top hat. 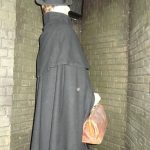 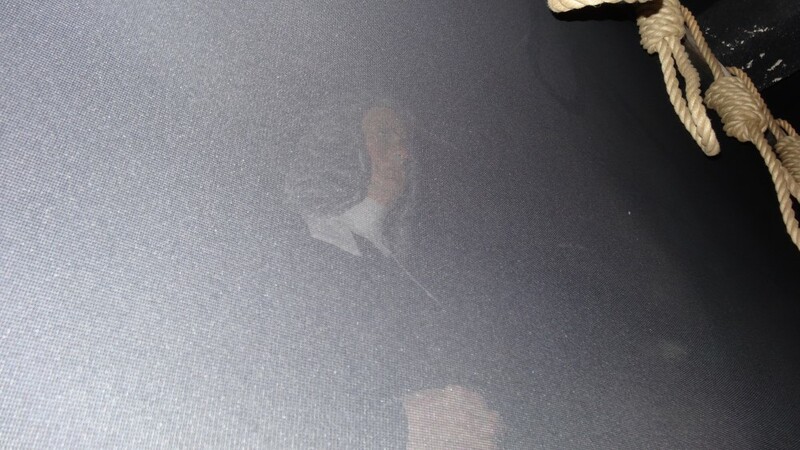 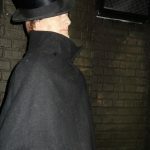 Is he Jack the ripper? 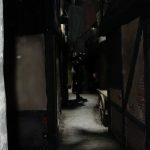 Leaving the murder scene you find the twisty alleyways of White Chapel, the mirror maze! 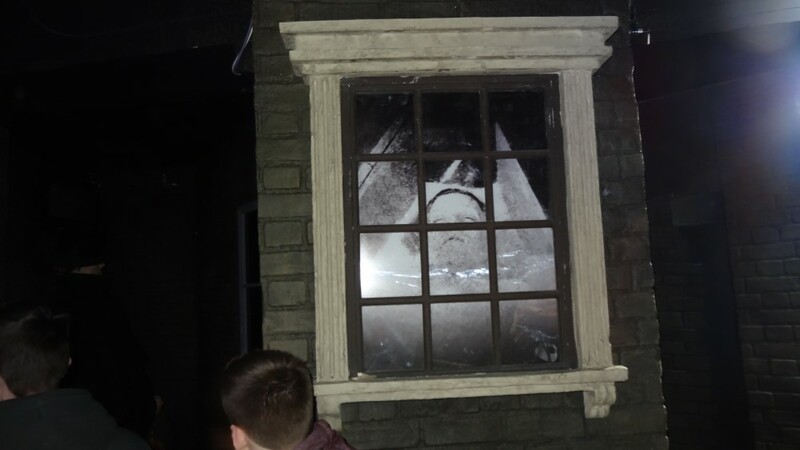 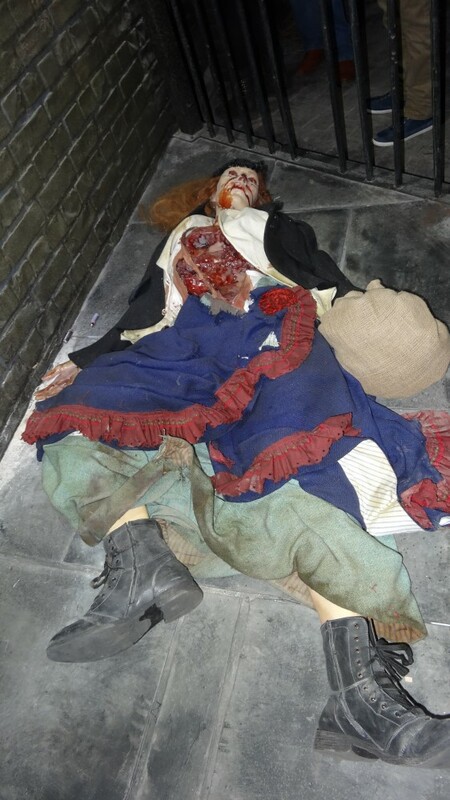 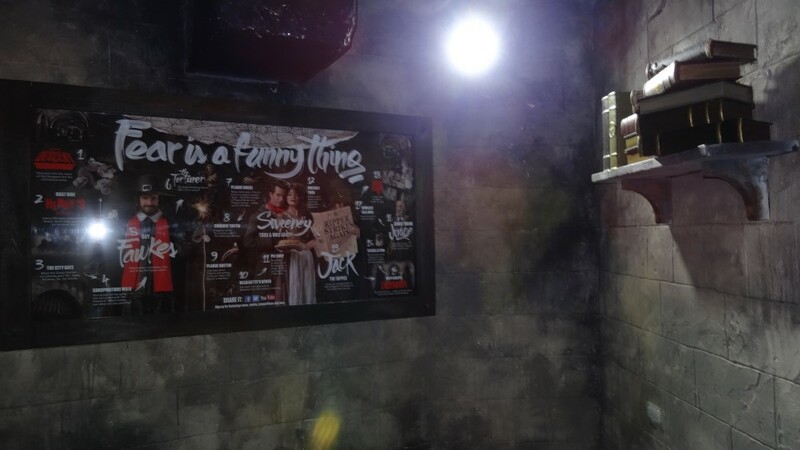 Make your way through without Jack the ripper finding you! 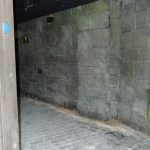 When you find your way out there will be a water effect as you leave getting you soaked unless you run through it quickly! 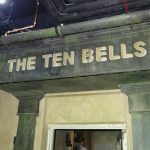 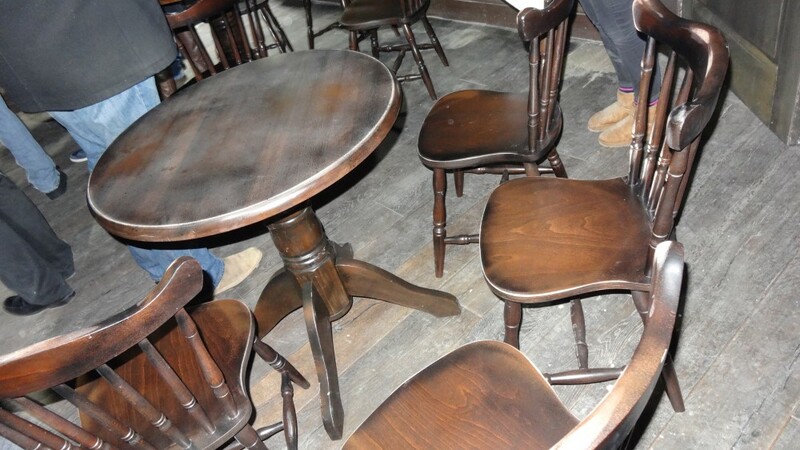 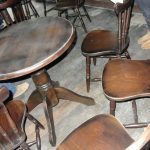 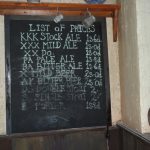 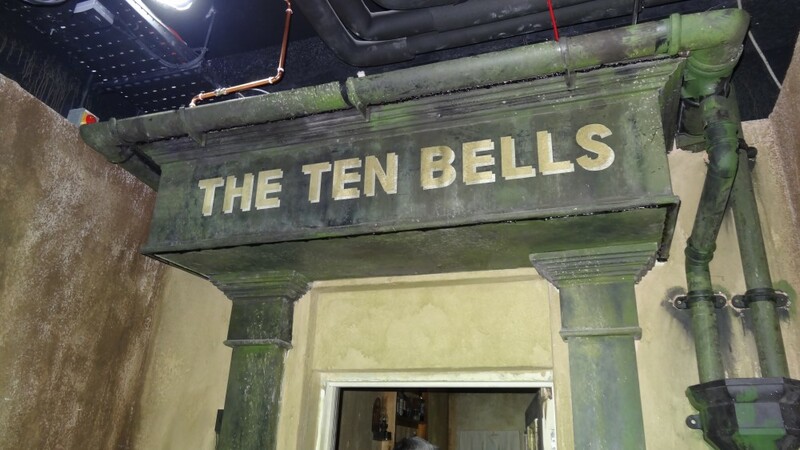 The ten bells pub is the next stop on your journey, with a much bigger room that what it used to be there is plenty more seating for people. 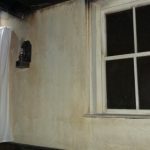 You’ll see around the room small windows with white sheets covering them. 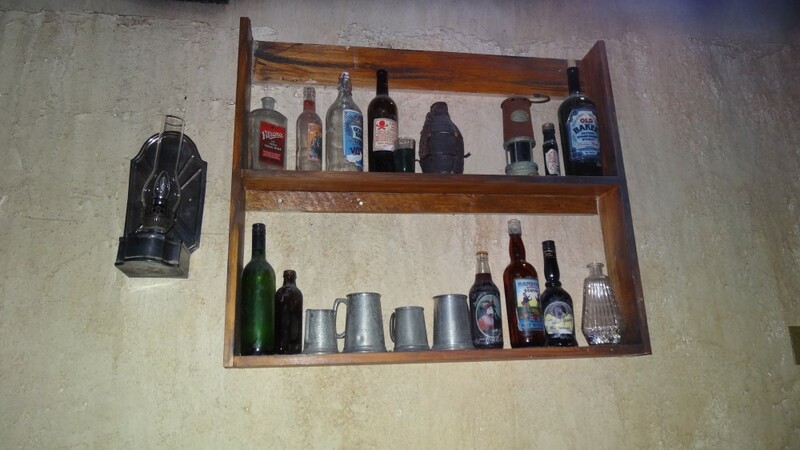 Also shelves with bottles placed of them as well. 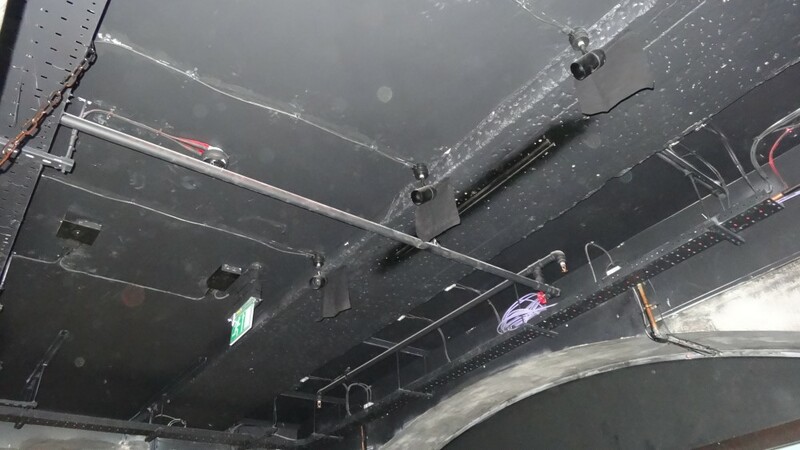 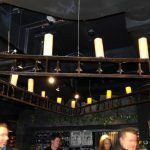 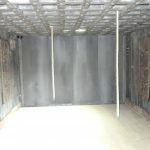 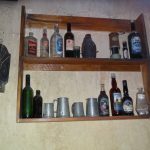 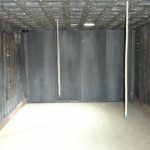 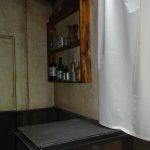 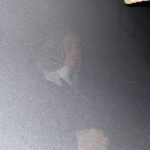 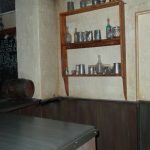 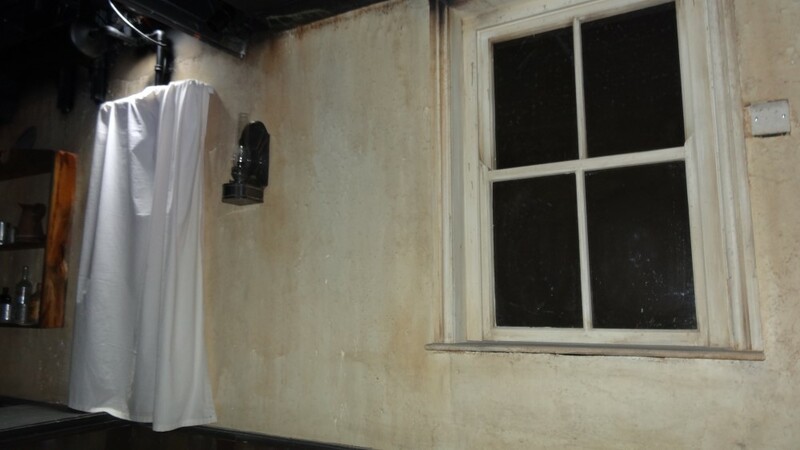 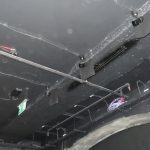 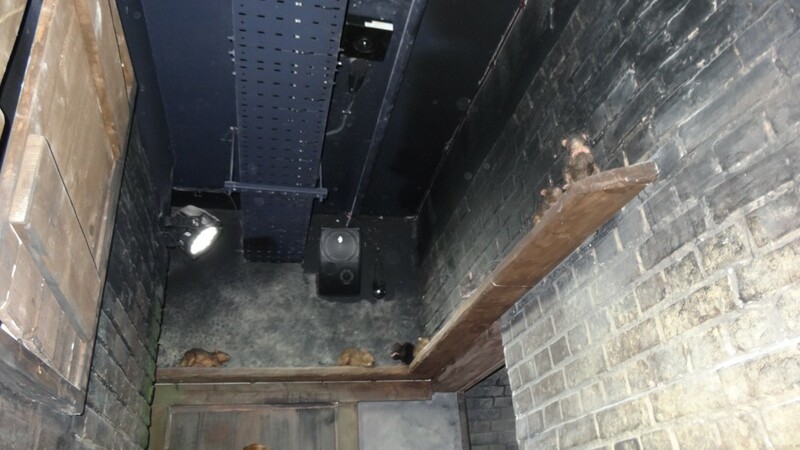 The windows will have strobe effects for lightning, the shelf at the back room rattles and shakes whilst the shelf of the front wall falls with bottles on it. 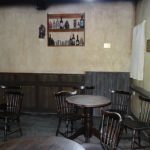 The lighting will cut a number of times with the barmaid interacting more with you, watch out for her when the lights go out! 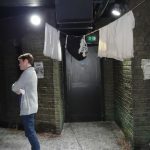 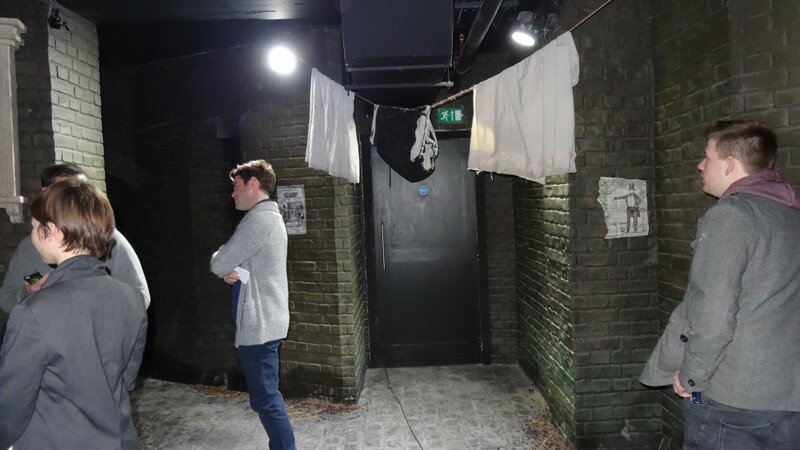 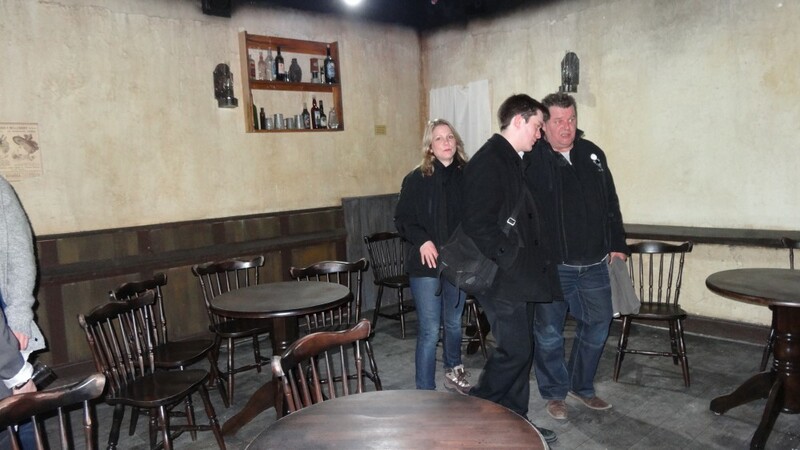 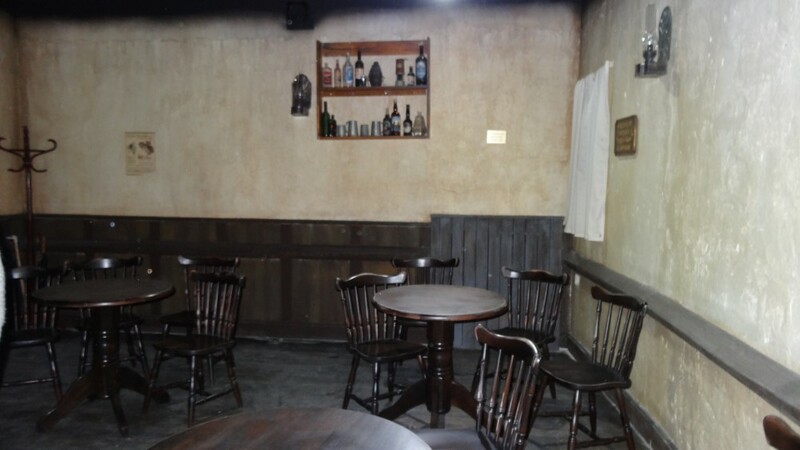 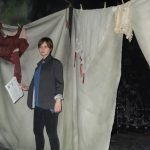 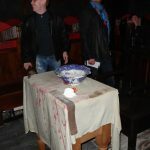 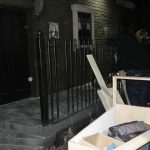 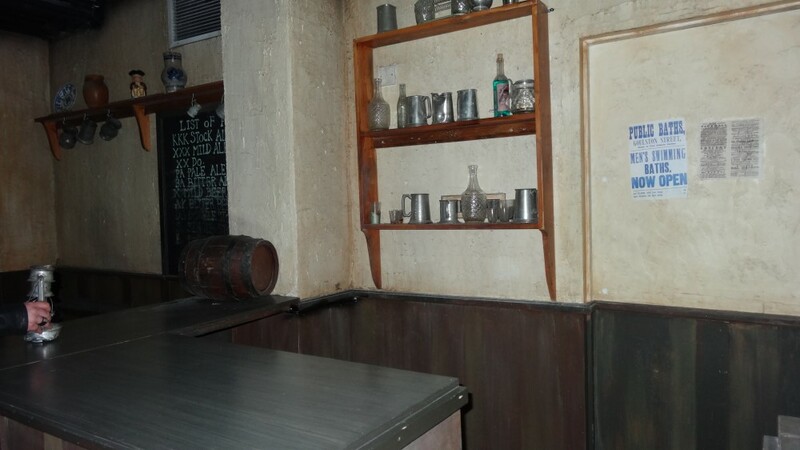 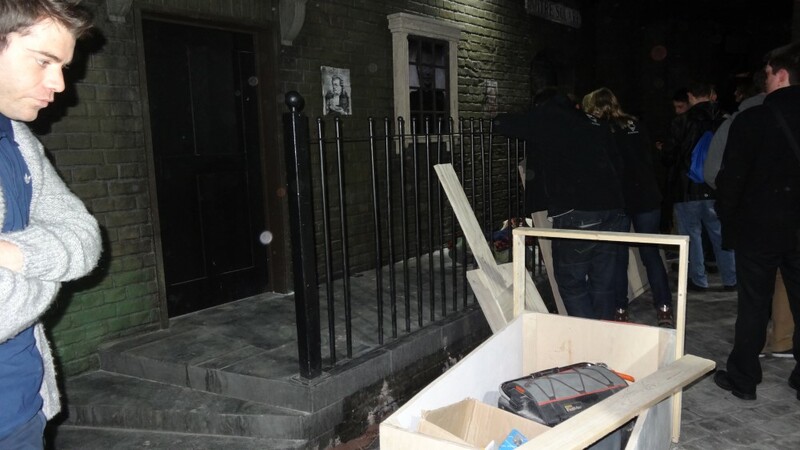 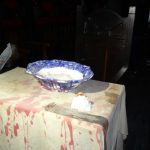 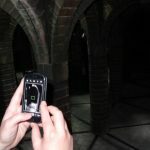 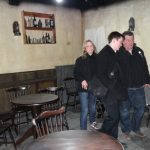 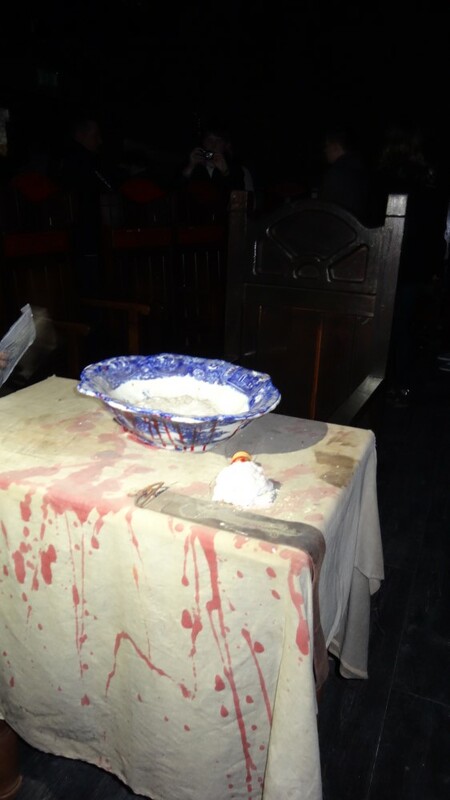 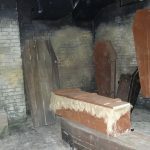 You will also encounter Jack the ripper on two occasions in this scene! 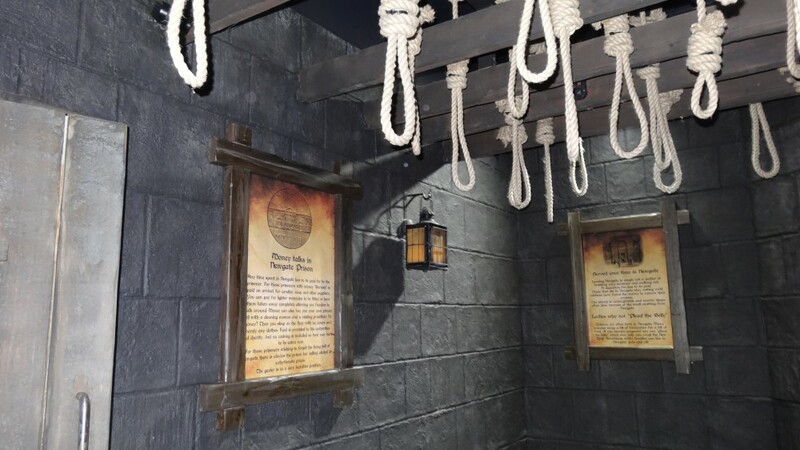 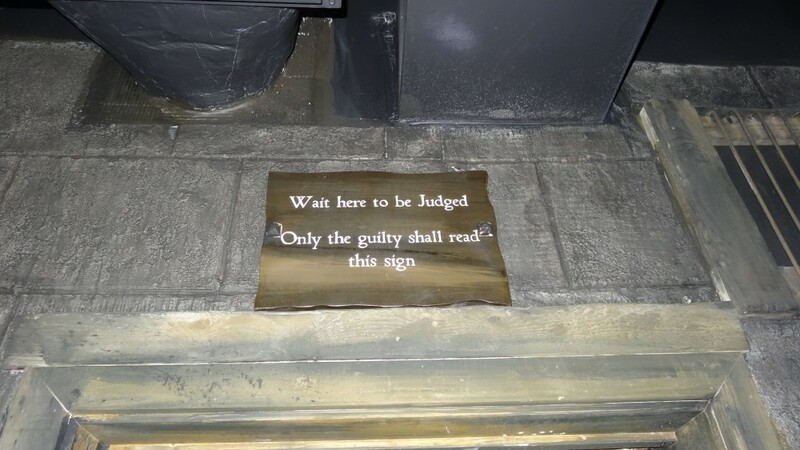 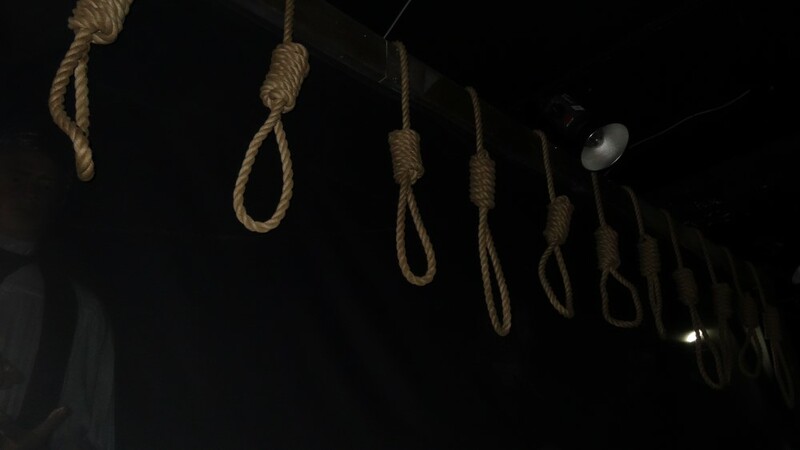 You will receive your punishment in this next room, which is The Courtroom. 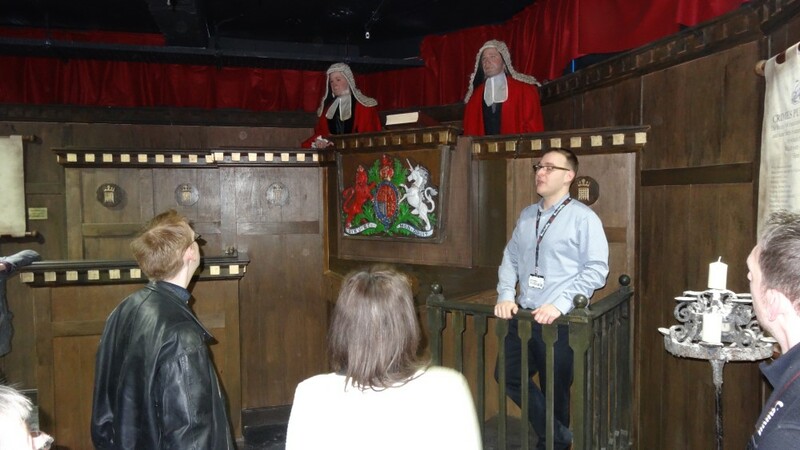 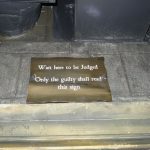 Face the judge as he discusses your crimes and what to do with you! 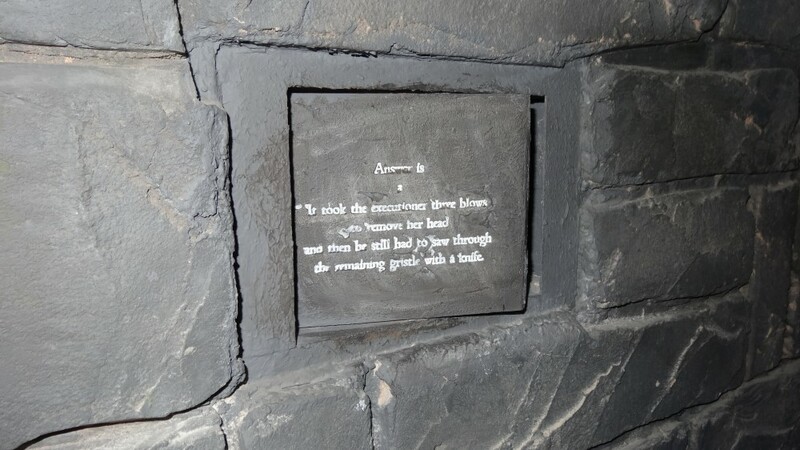 Because of the move the dungeons has created a completely new script to fit in this scene. 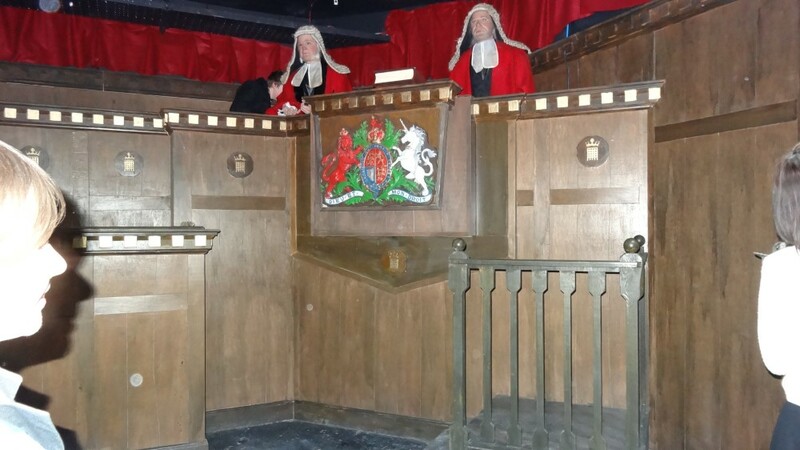 Along with the judge up in his stands there as also two mannequins up there, you may not see those though as they haven’t decided if they even want to keep them yet! 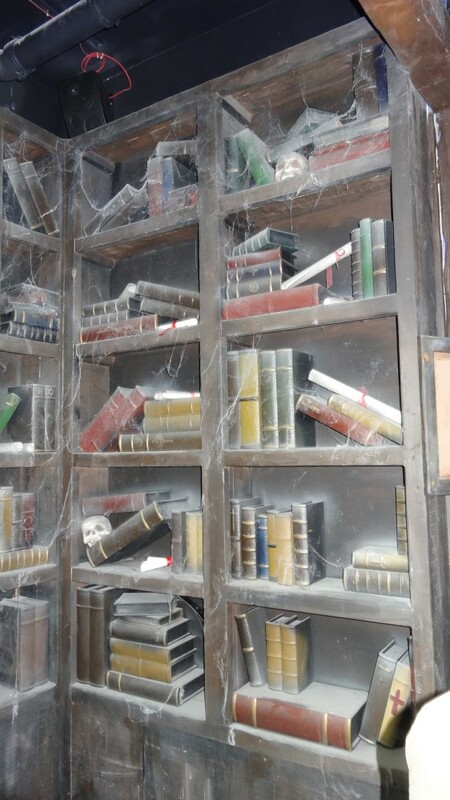 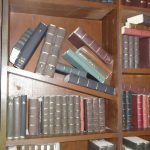 Behind you again, is a huge bookcase with a large selection of books of it. 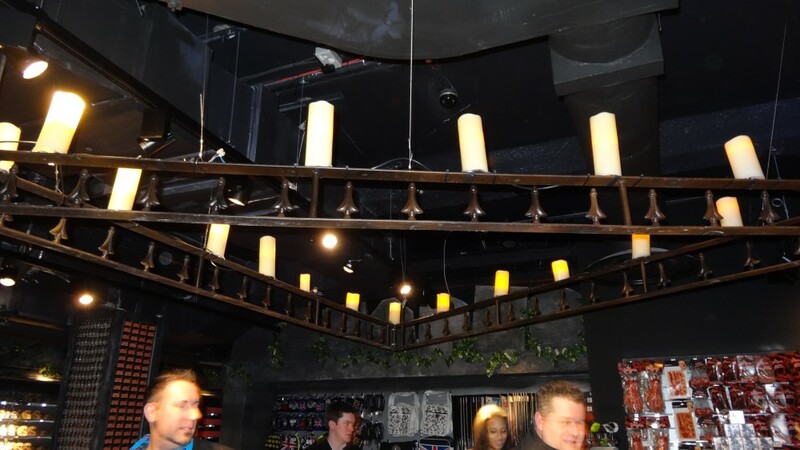 Two small candle holders either side of the room will be your only light within this. 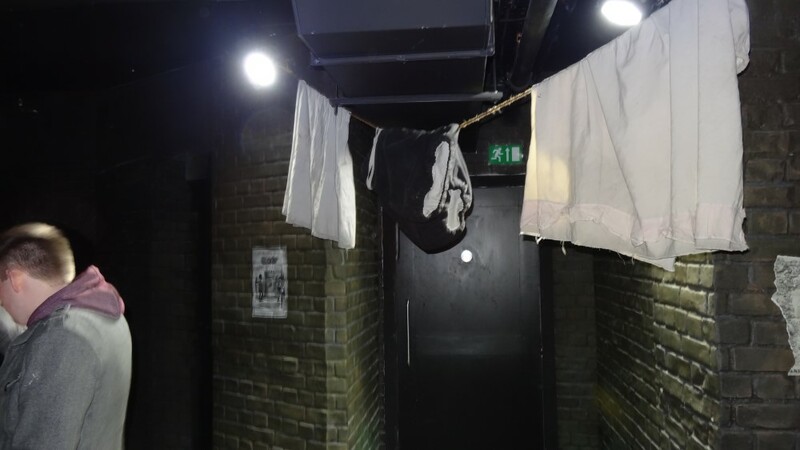 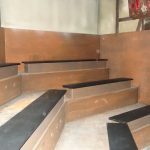 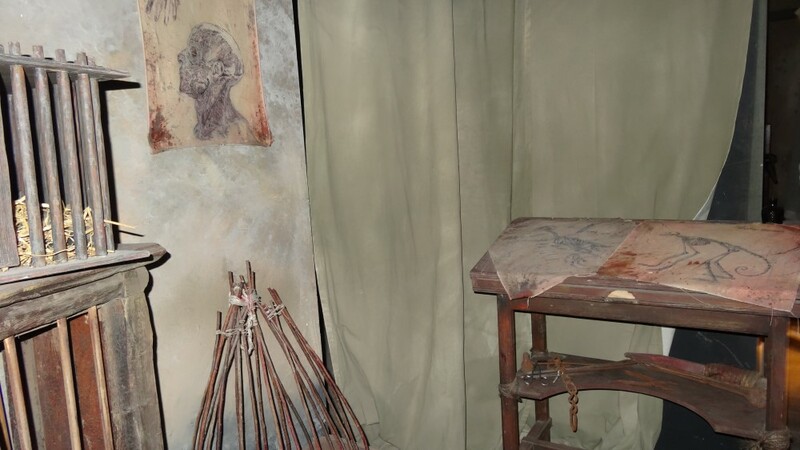 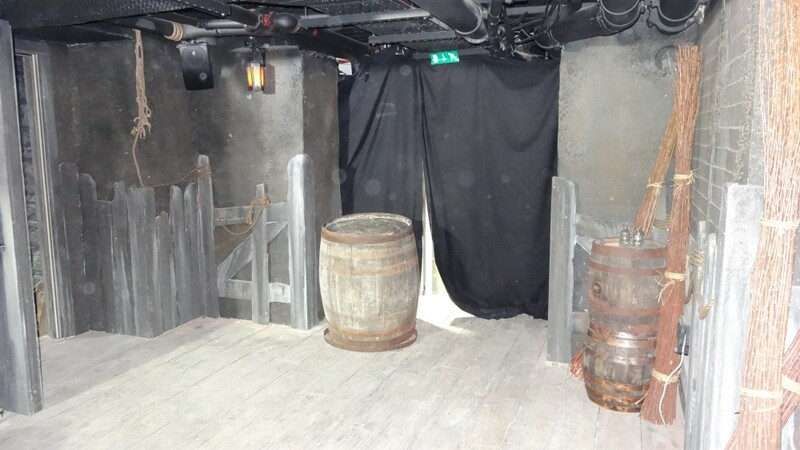 Walk along and you will find a bare room with a stand in front of you, an actor will be placed on this get you ready for the next and last part of the tour.. 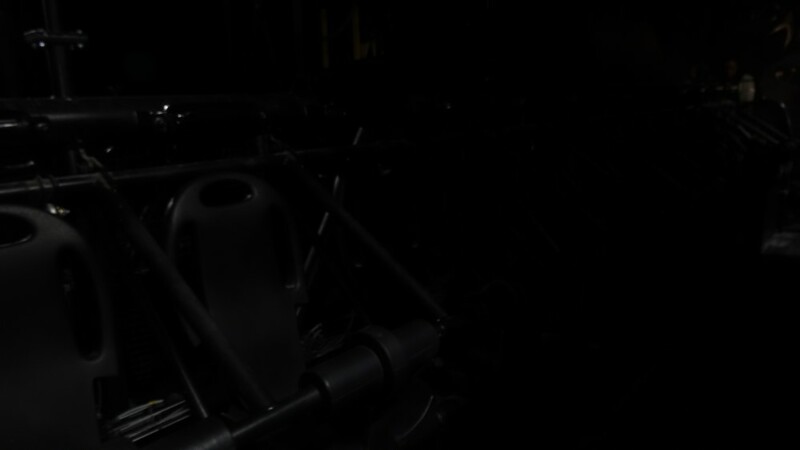 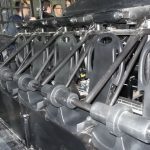 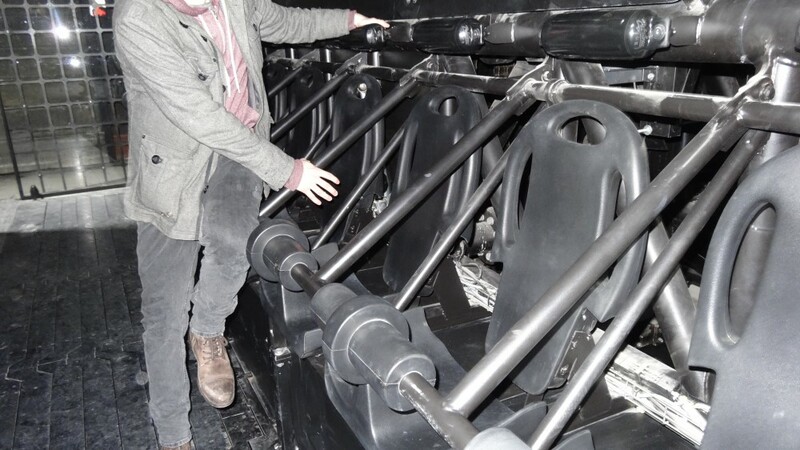 Previously called Extremis, the new ride is called Drop Dead. 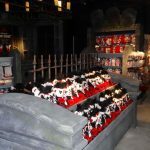 The reason for the name change is because they felt it was easily translated with other languages as they get a lot of tourists. 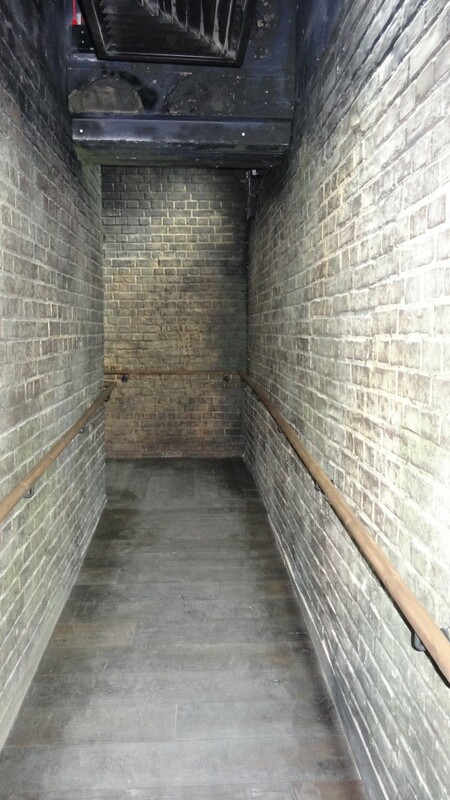 This drop is the same height as the last one. 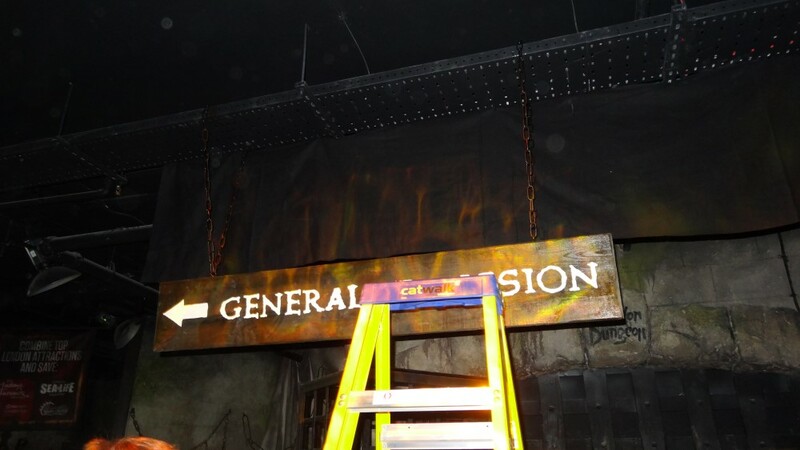 However, this one starts at the top! 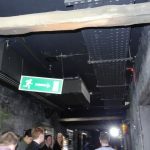 It will be much more of a surprise when you drop. 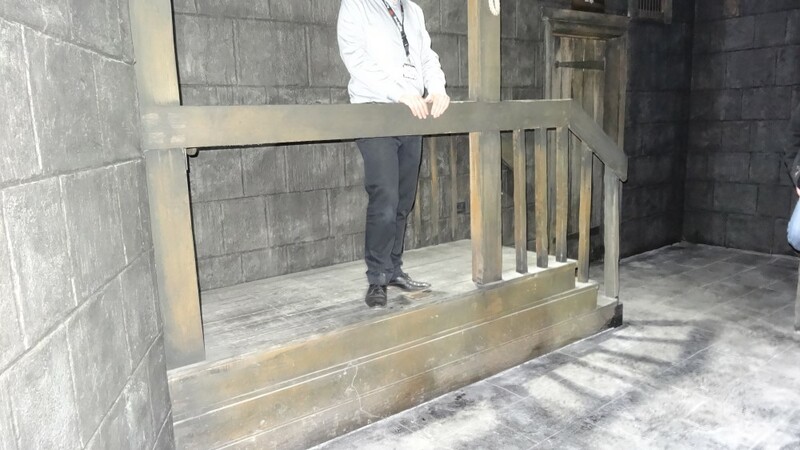 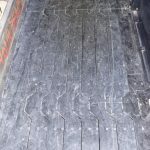 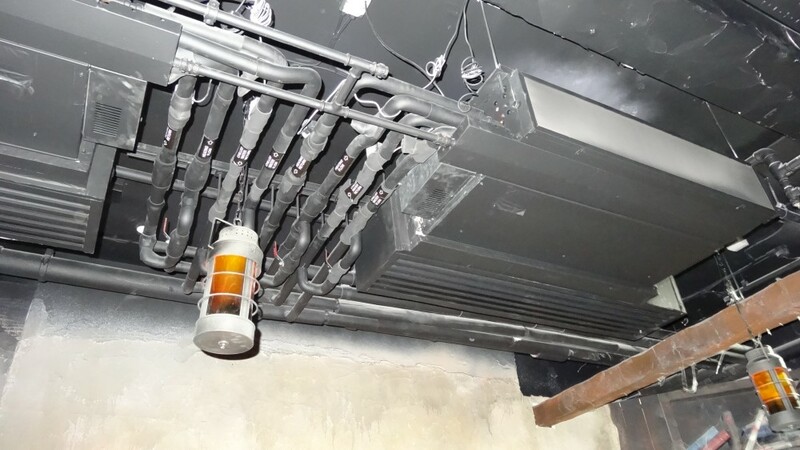 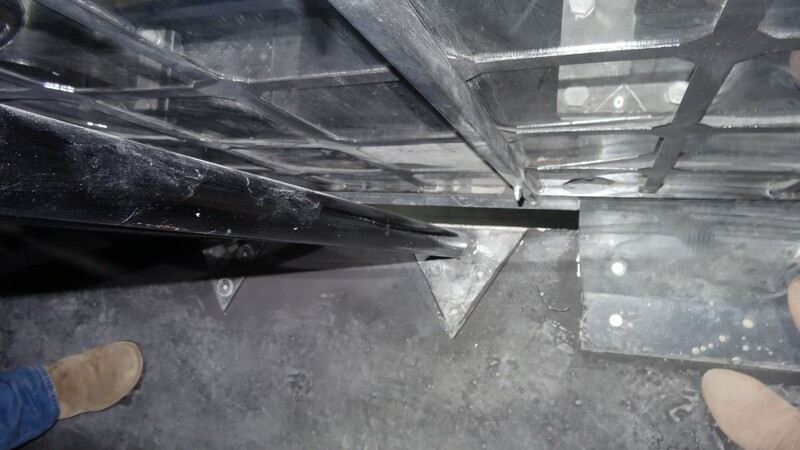 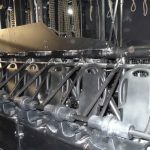 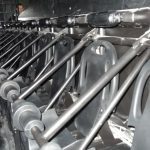 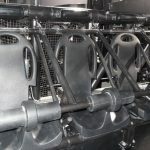 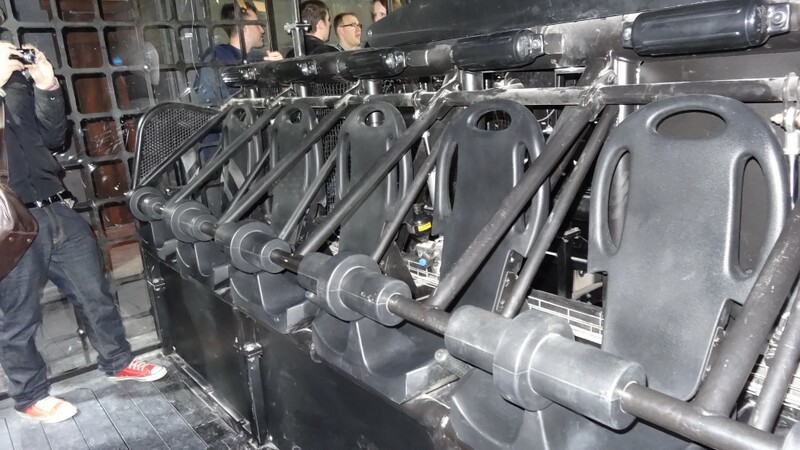 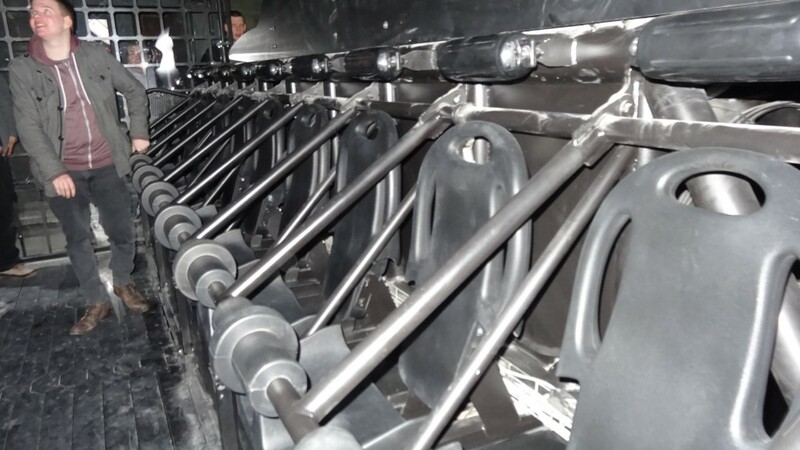 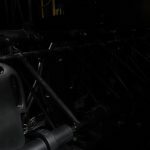 The ride has had improvements over Sub Terra at Alton Towers particularly using slats in the floor, this enables air to pass through the ride whilst dropping creating a more forceful experience whilst not messing up your hair as much! 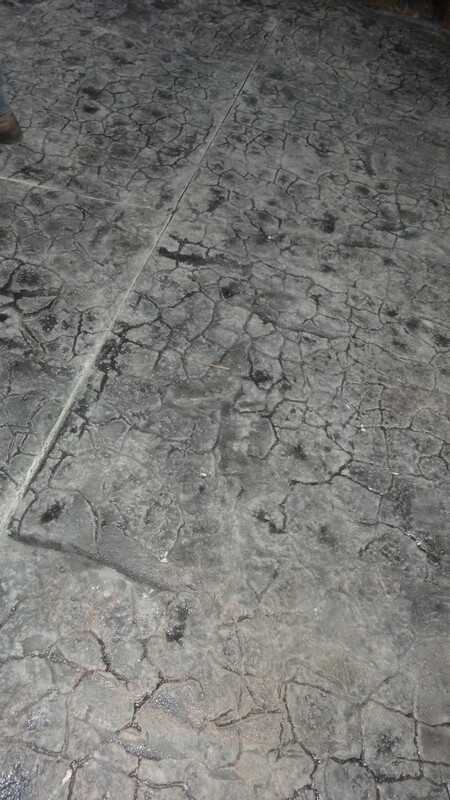 Additional to all this Drop Dead only drops you once but when you think its over it will drop you once again! 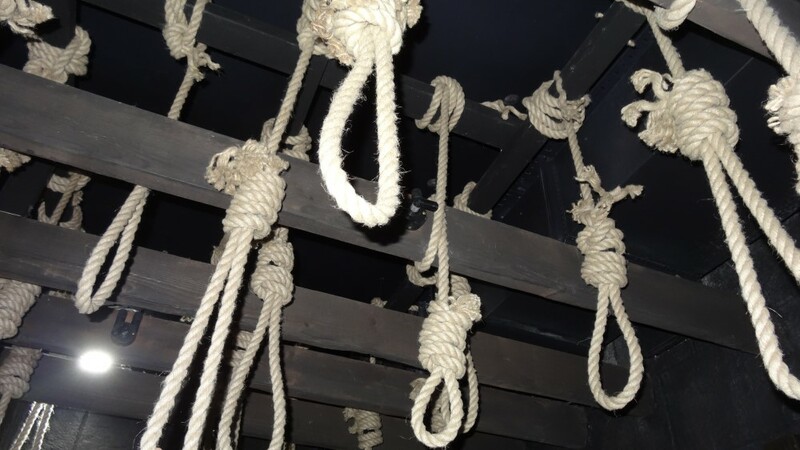 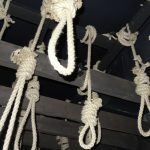 Once dropping to the bottom you will other hanging victims! 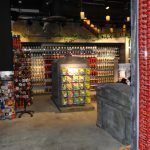 Surviving your drop you then leave to the picture collection point, alongside you will find shop. 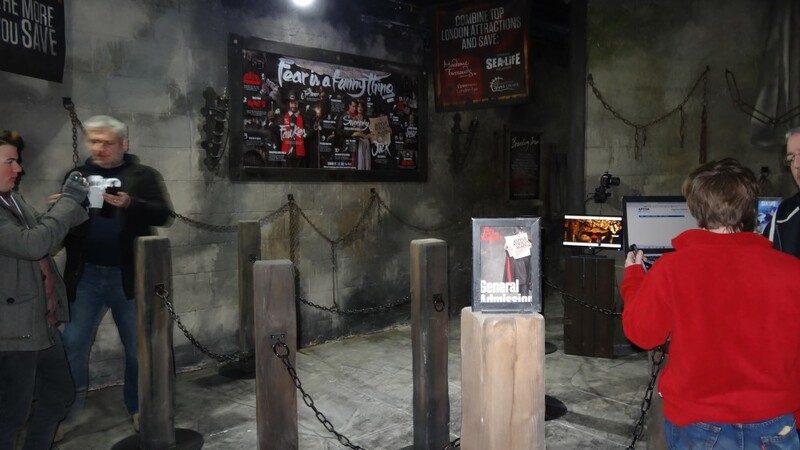 You will find within the new promotional material also there are no blood splats as they would like to more groups of families in. 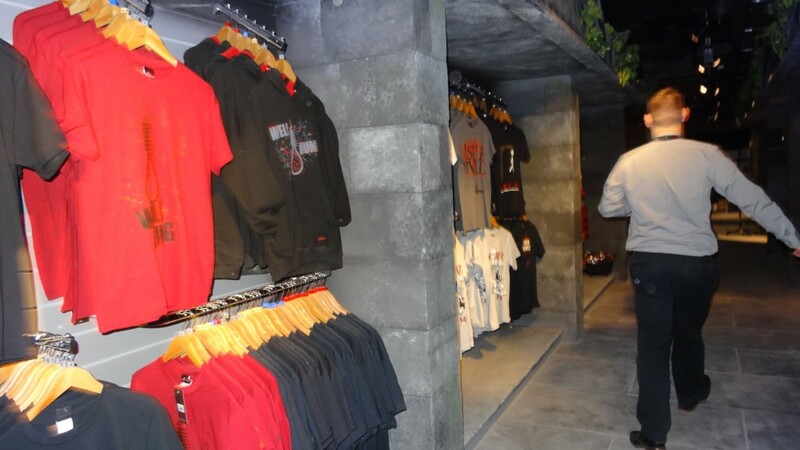 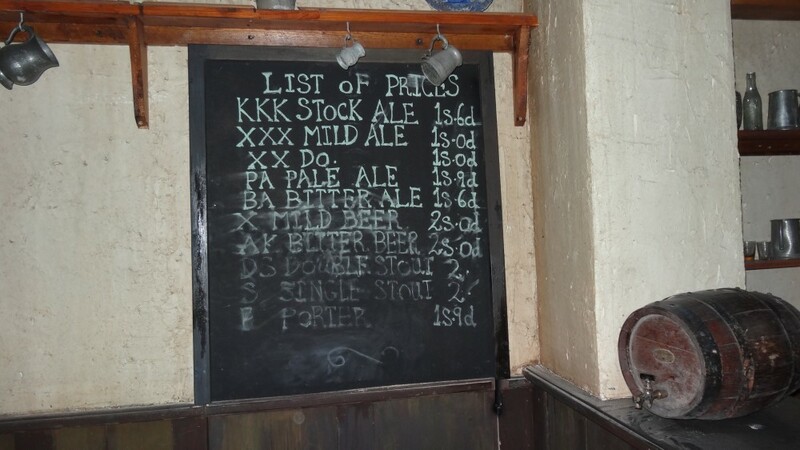 This also applies to the merchandise as well which will be toned down once the old stocks have sold through. 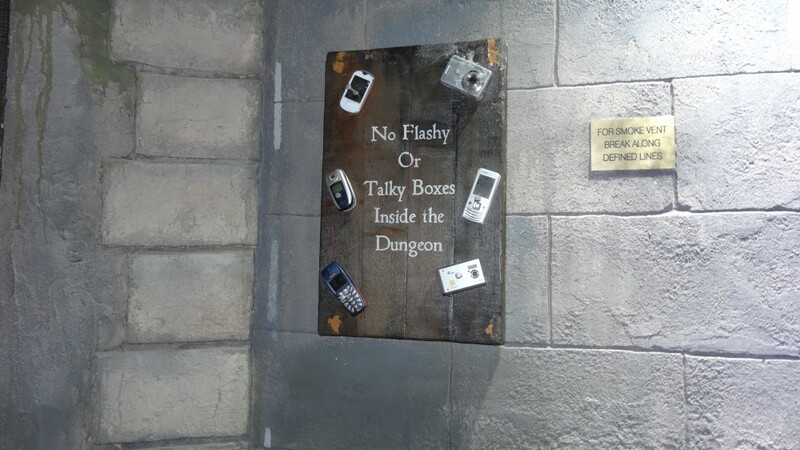 So what about the Dungeons? 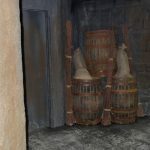 Well they have fully succeeded in re-producing the feel that many felt the old Dungeons carried. 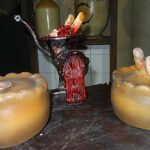 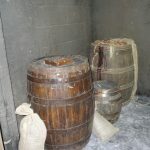 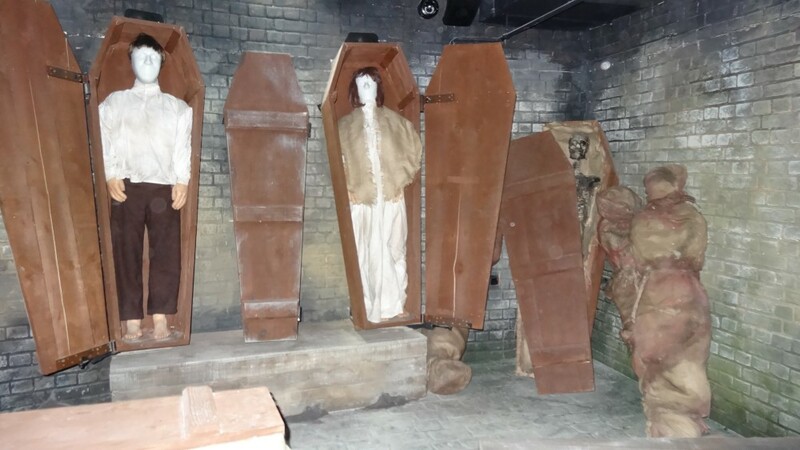 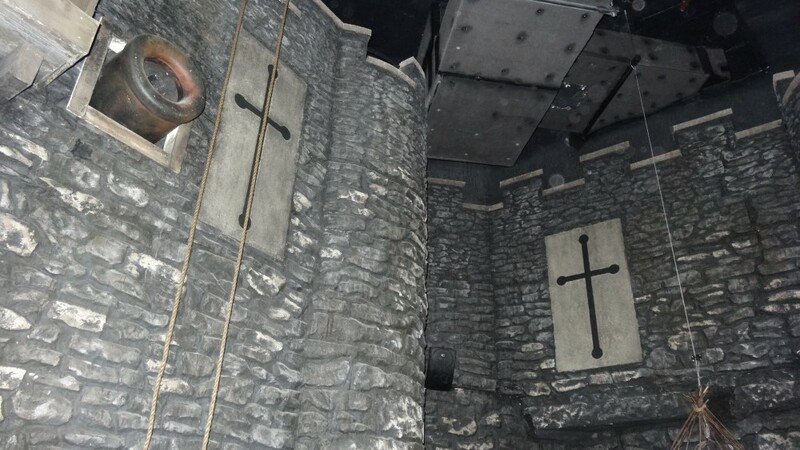 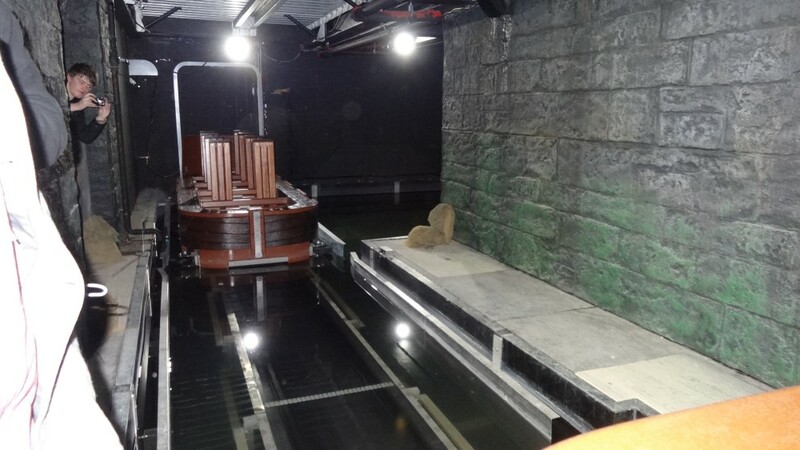 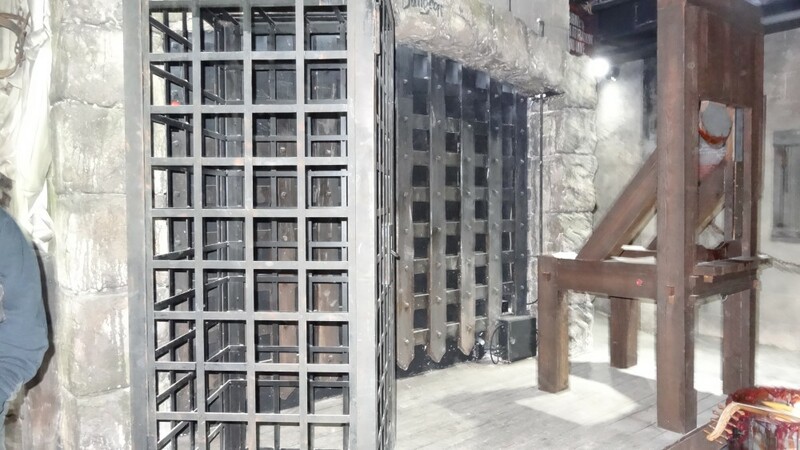 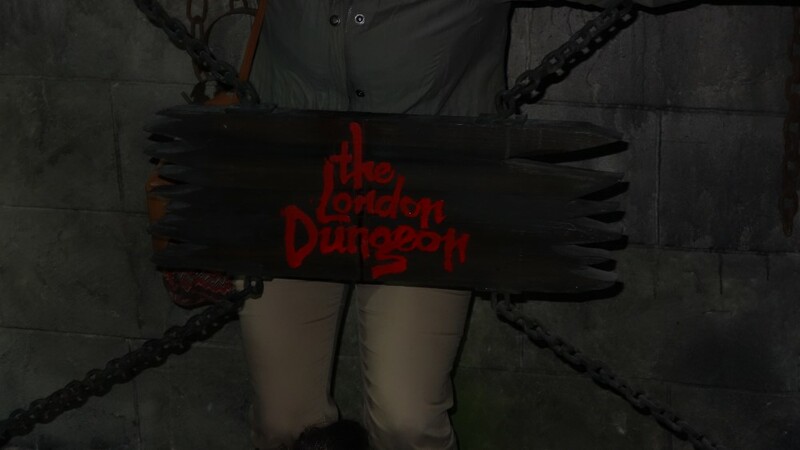 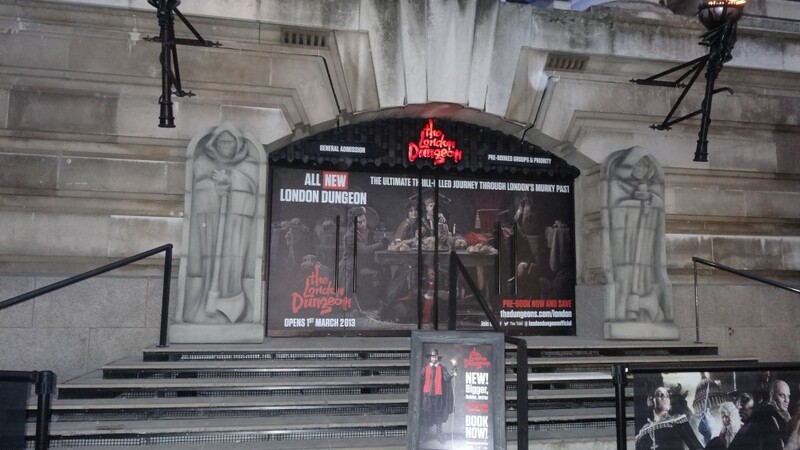 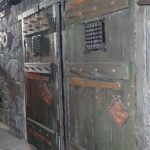 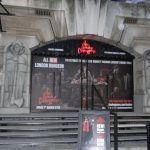 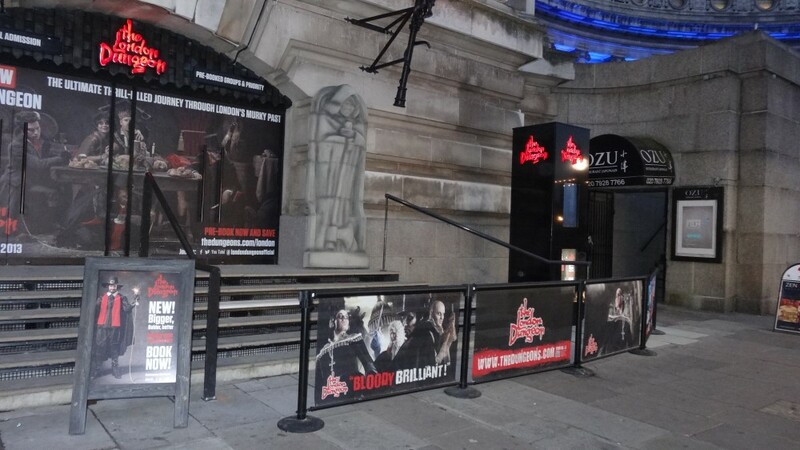 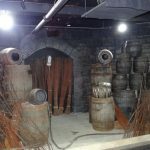 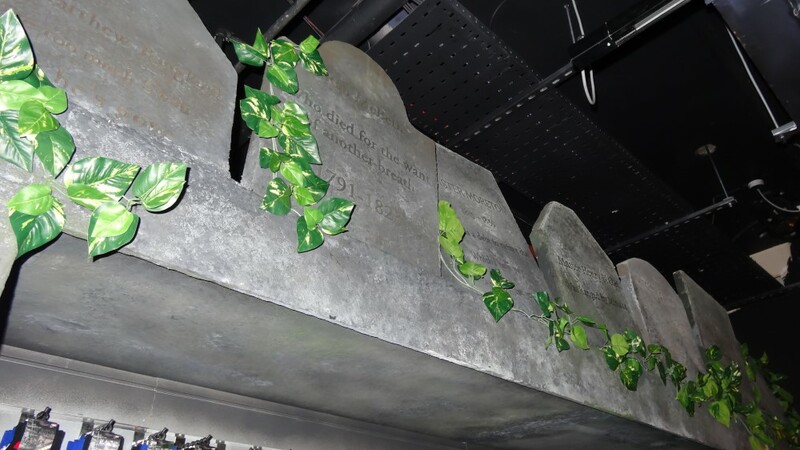 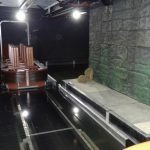 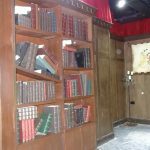 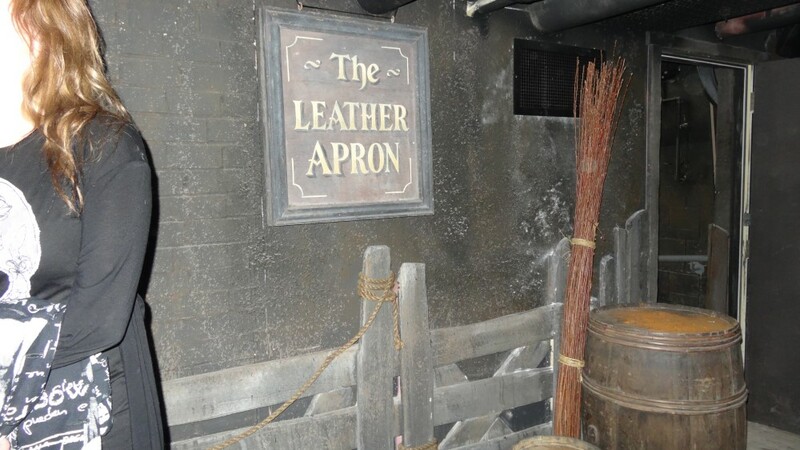 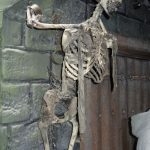 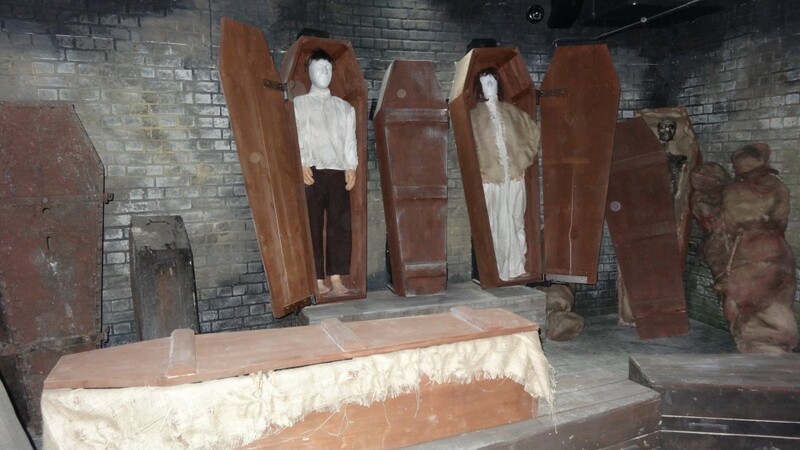 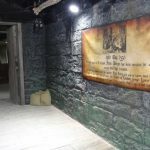 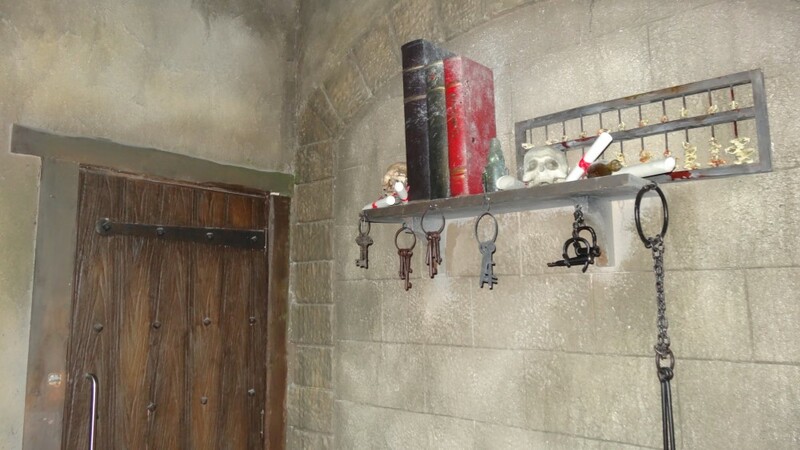 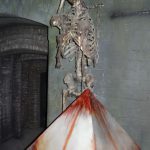 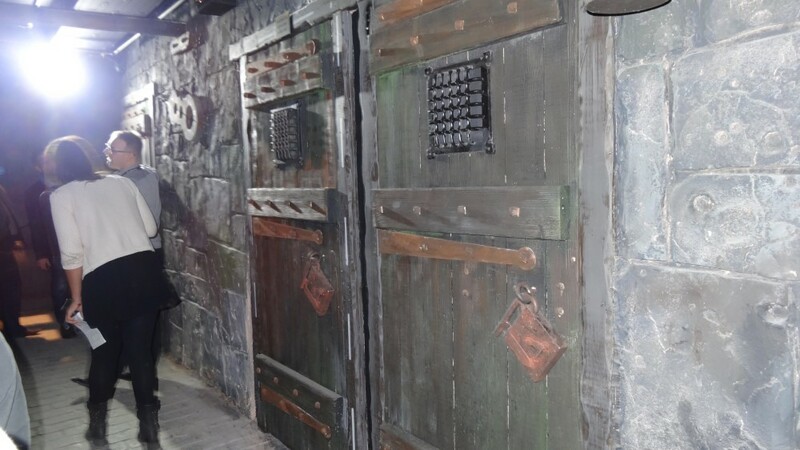 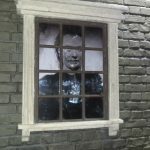 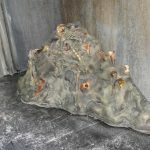 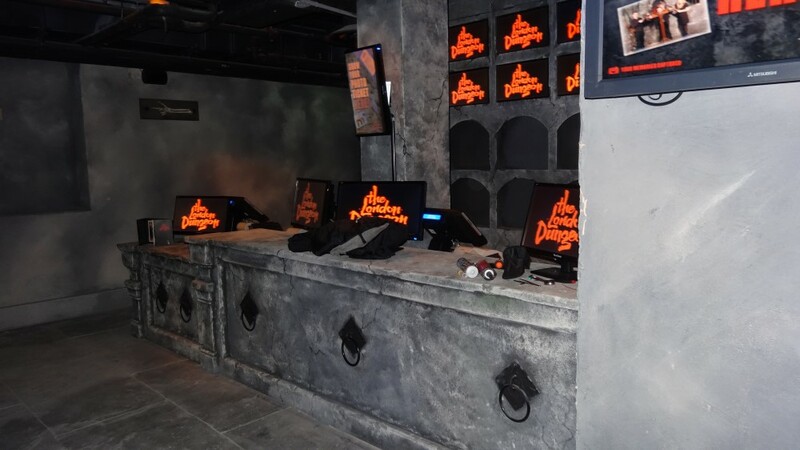 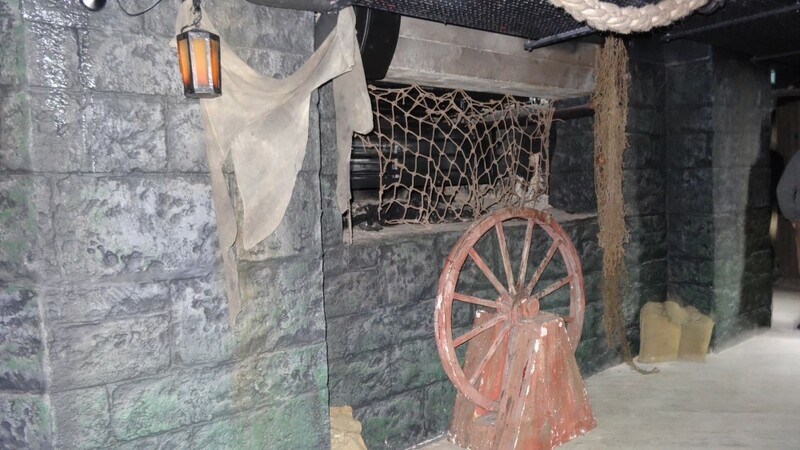 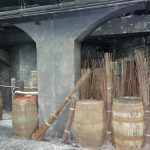 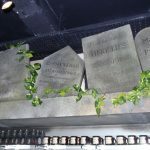 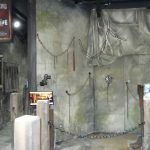 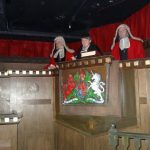 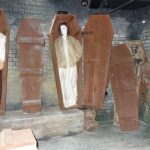 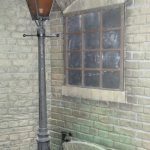 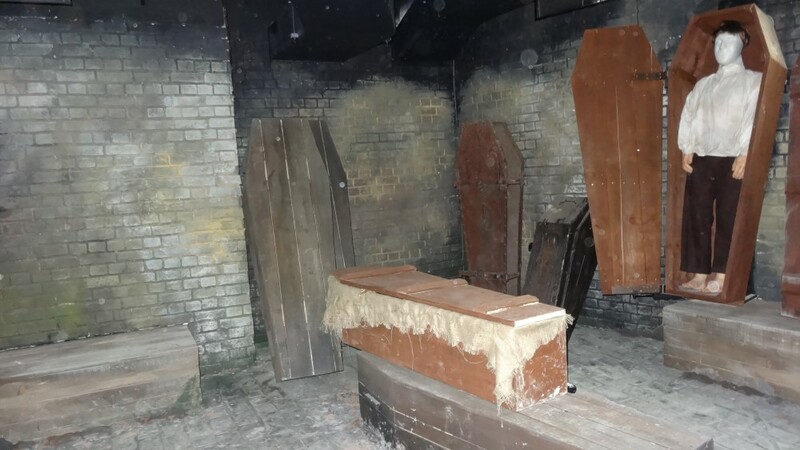 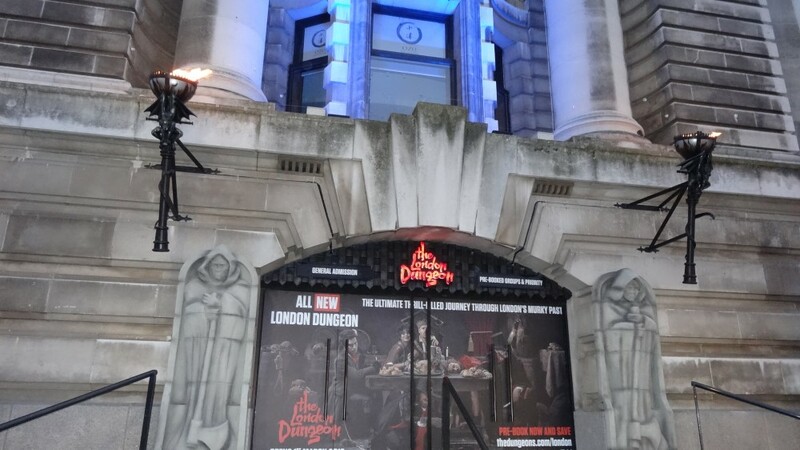 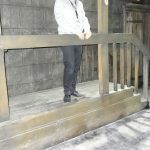 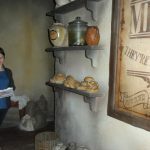 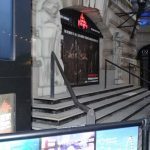 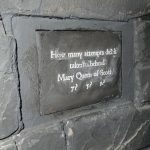 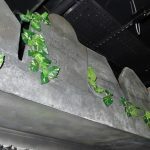 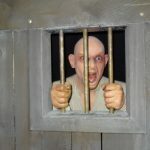 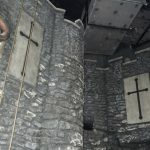 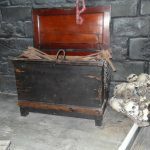 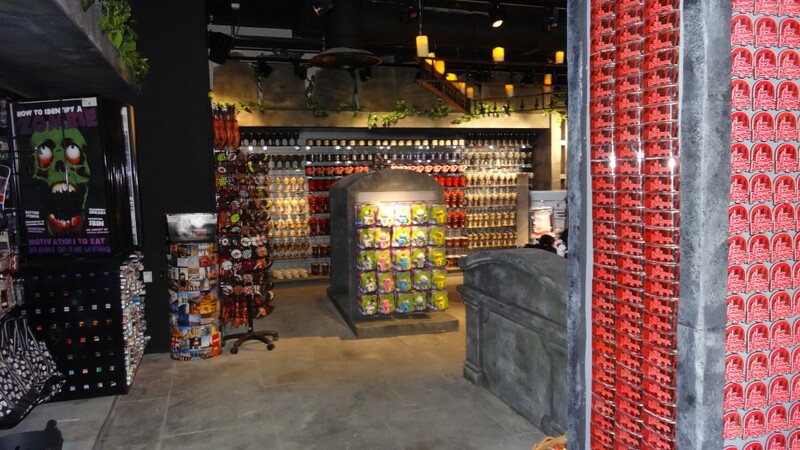 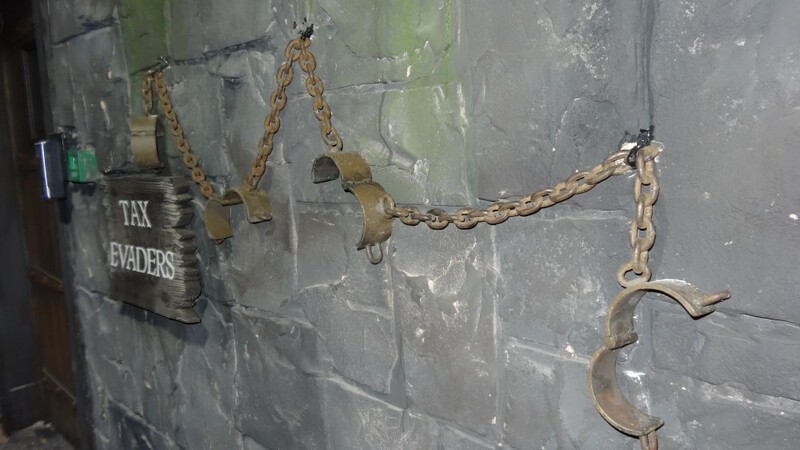 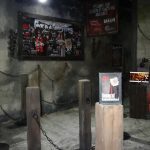 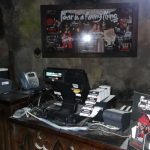 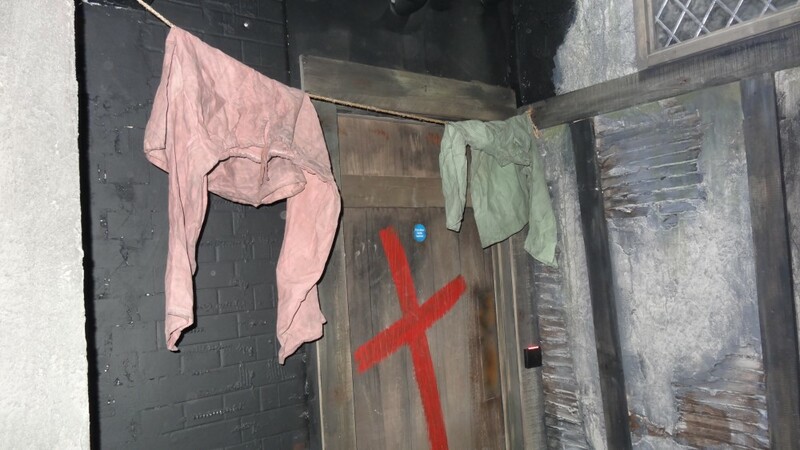 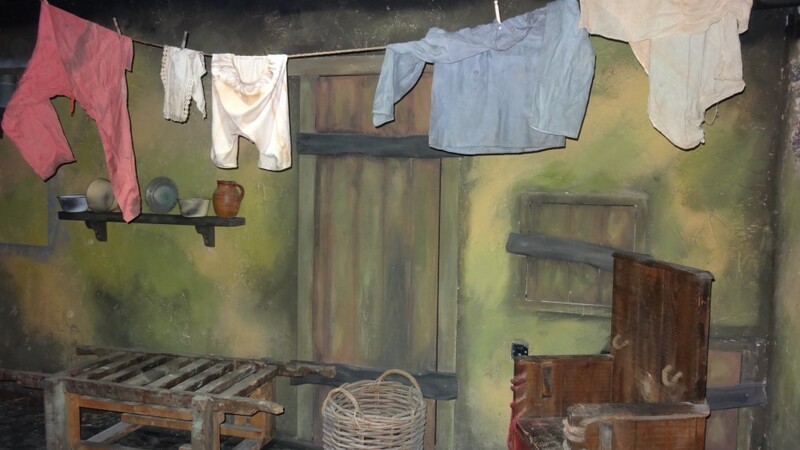 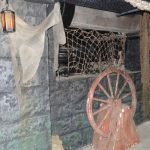 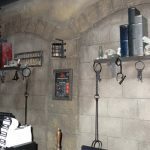 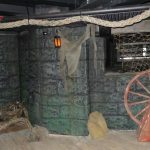 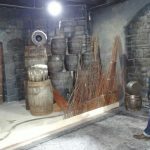 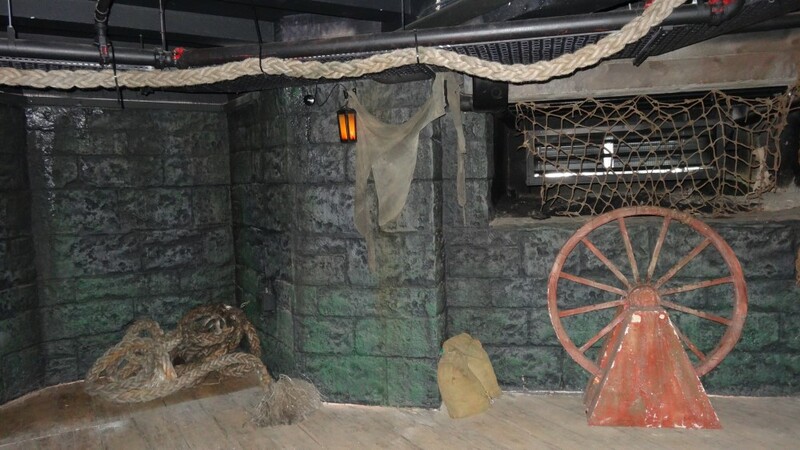 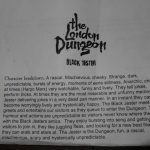 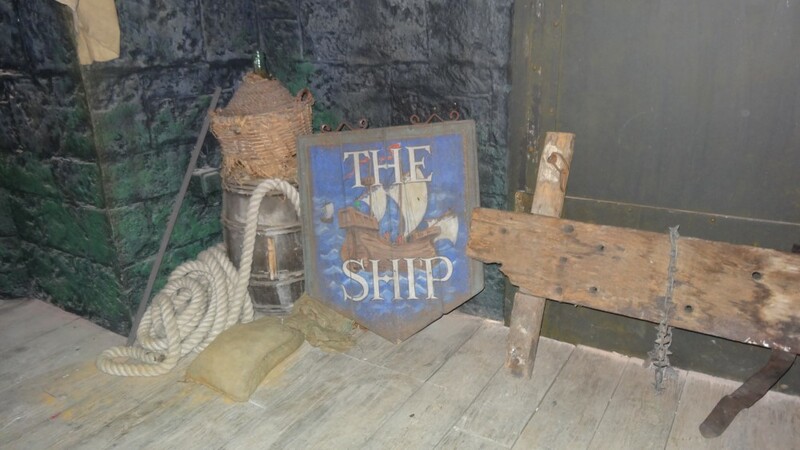 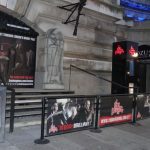 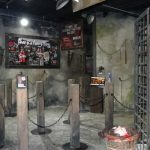 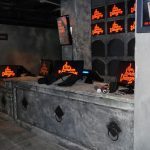 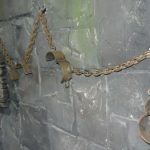 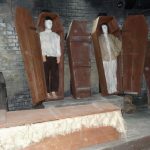 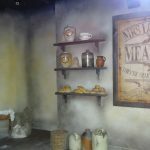 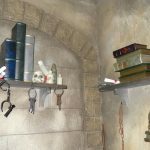 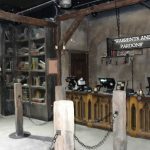 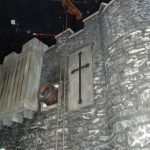 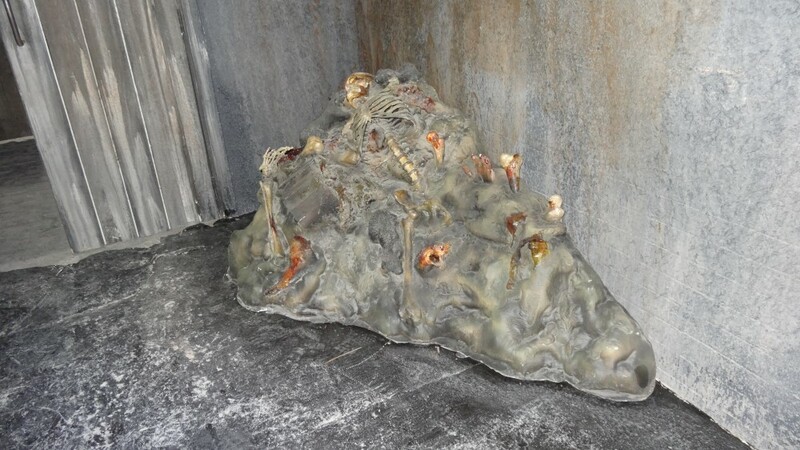 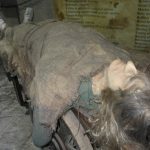 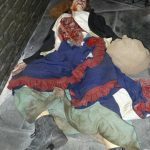 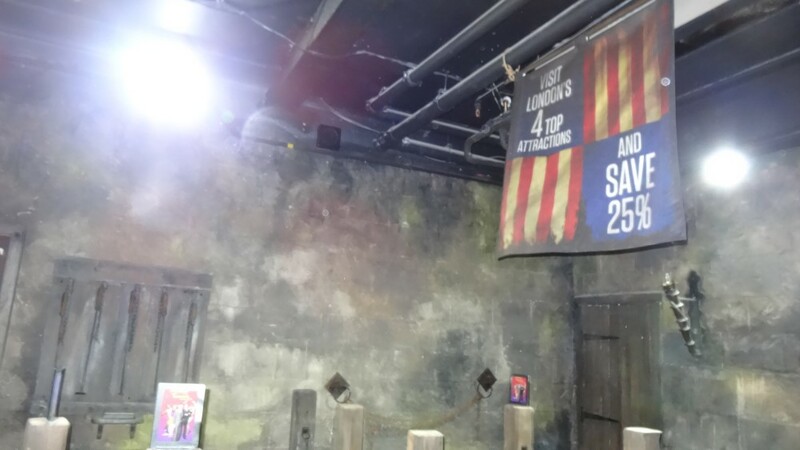 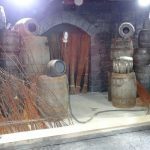 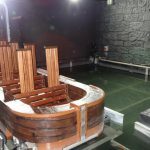 The time and effort spent in the models, shows, theme and effects are second to none and having the London Dungeons as the flagship Dungeon has also succeeded. 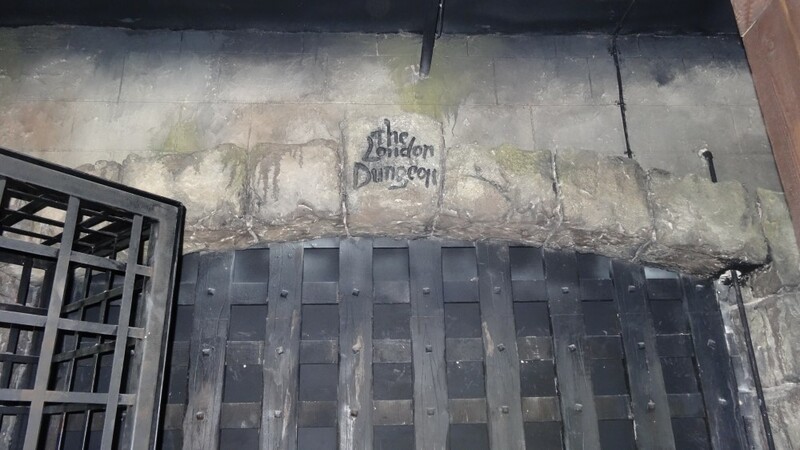 The show time is the about the same as the previous Dungeons with the space made up by more scenes. 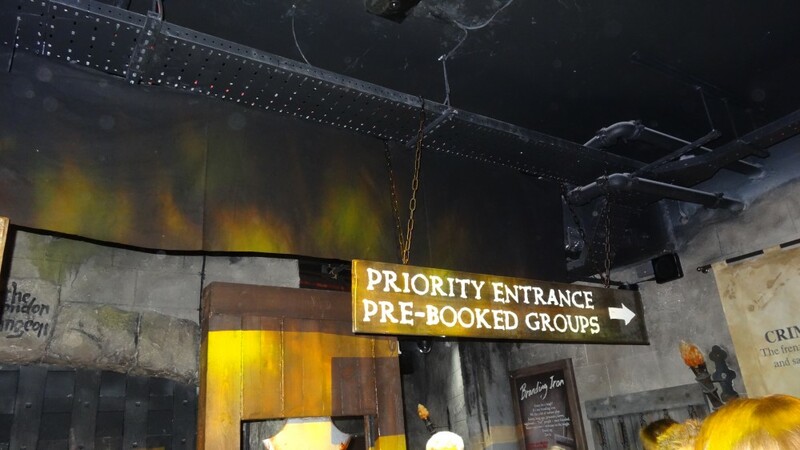 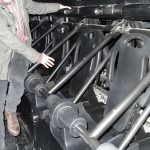 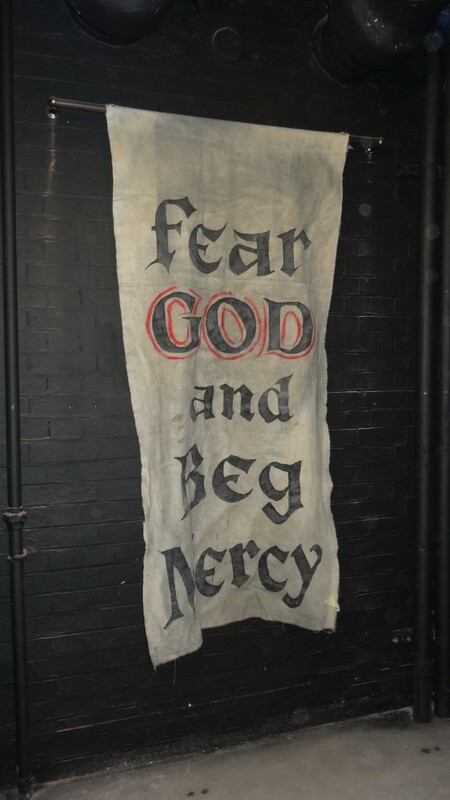 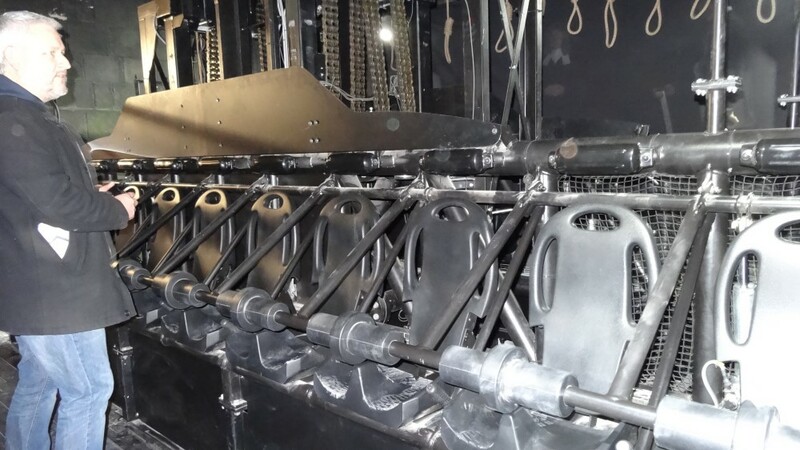 When you consider the loading, show time and unloading of Vengeance (which is now in storage at Thorpe Park although there are currently no plans to use it) the time is used more effectively with shows and stories. 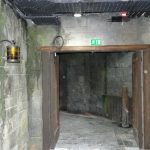 Overall this is undoubtedly a great success for the Dungeons and a positive move which when you stand back and look, much needed.